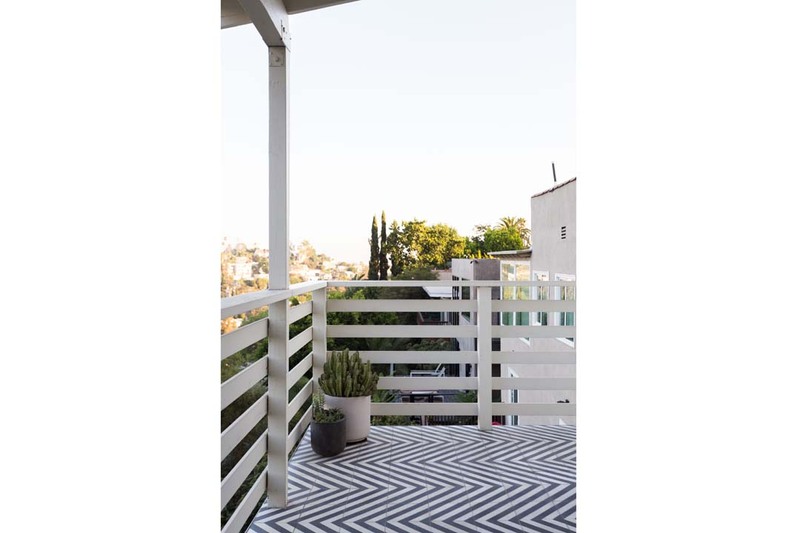 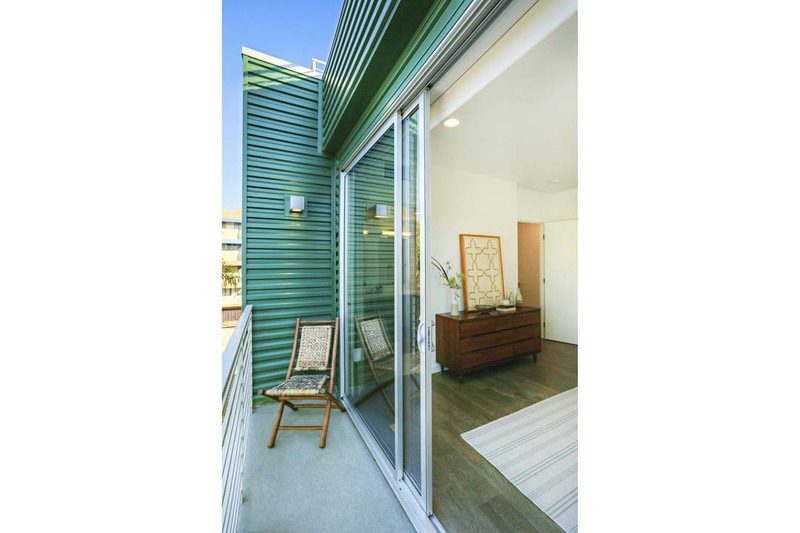 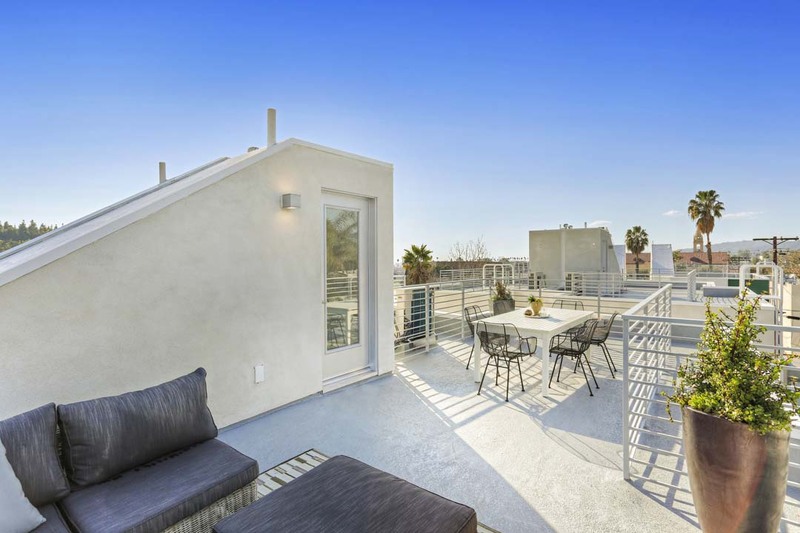 Ciel – “sky” – stretches above your private rooftop deck in the heart of LA’s trendy Eastside. 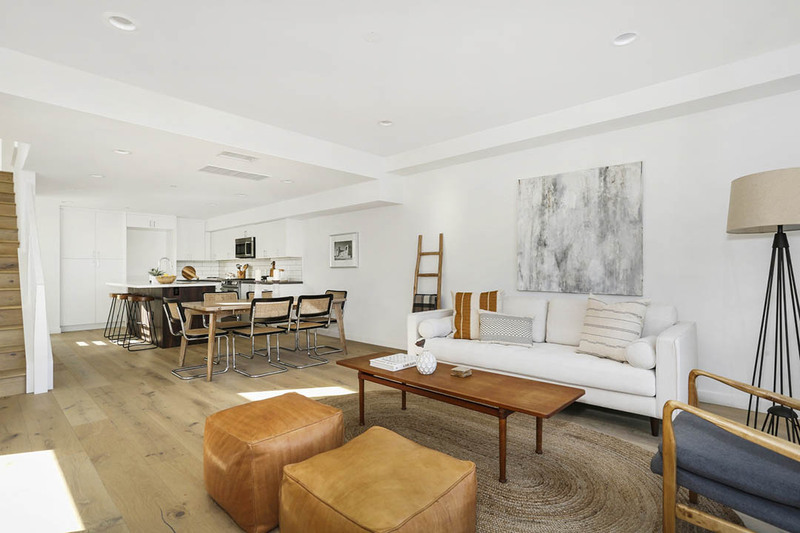 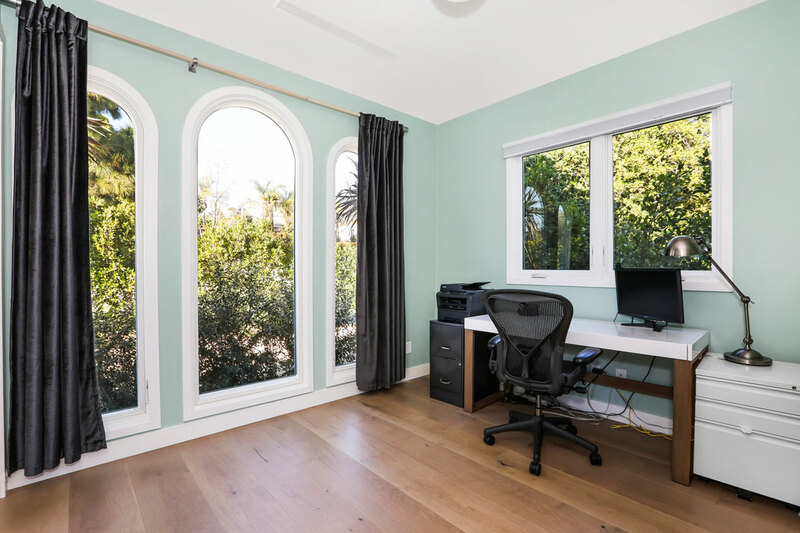 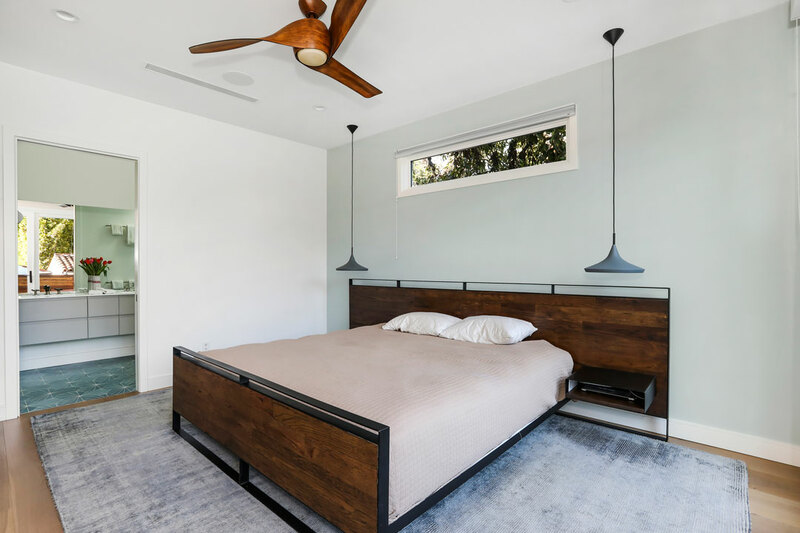 This newly-built home is one of just four that are structurally independent and arranged as book-ends to provide privacy and abundant natural light. 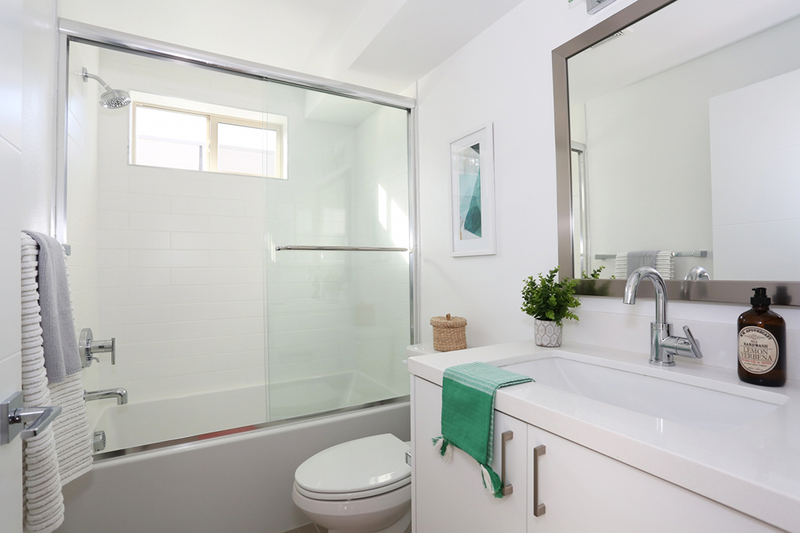 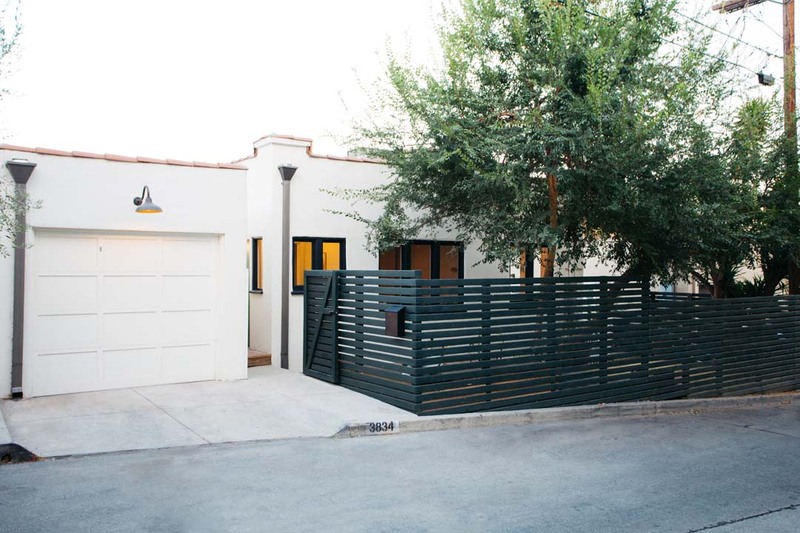 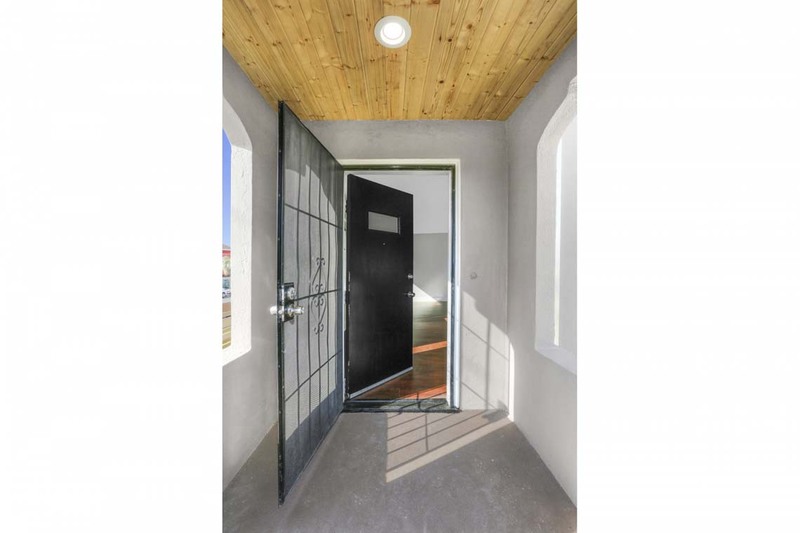 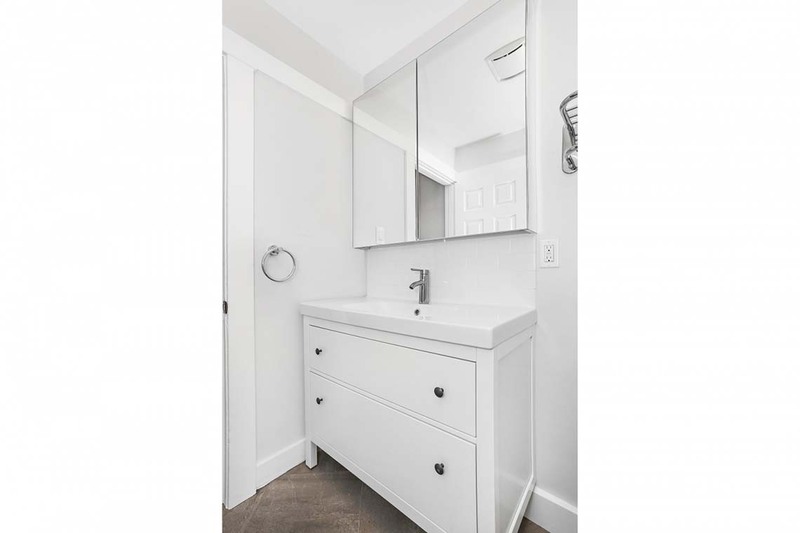 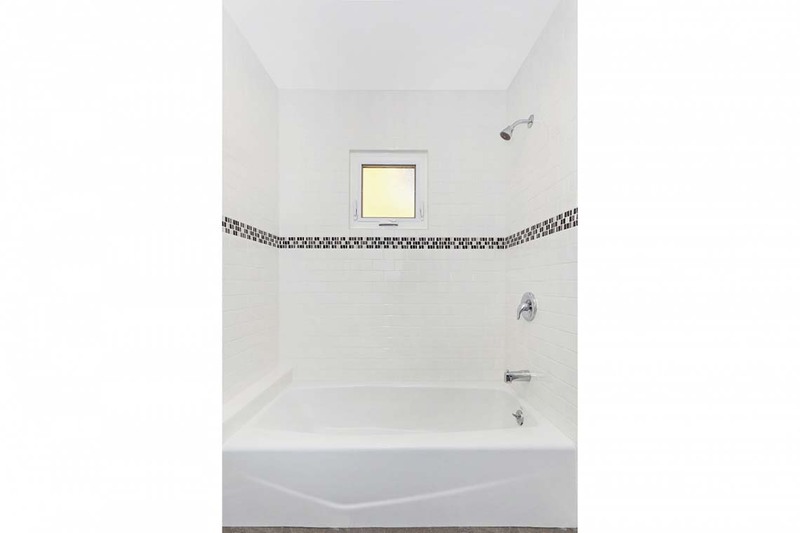 Three bedrooms, three bathrooms, an office/den and two-car garage give you ample space in an earth-friendly footprint, with energy-smart features including dual-pane Low E windows and a tankless water heater. 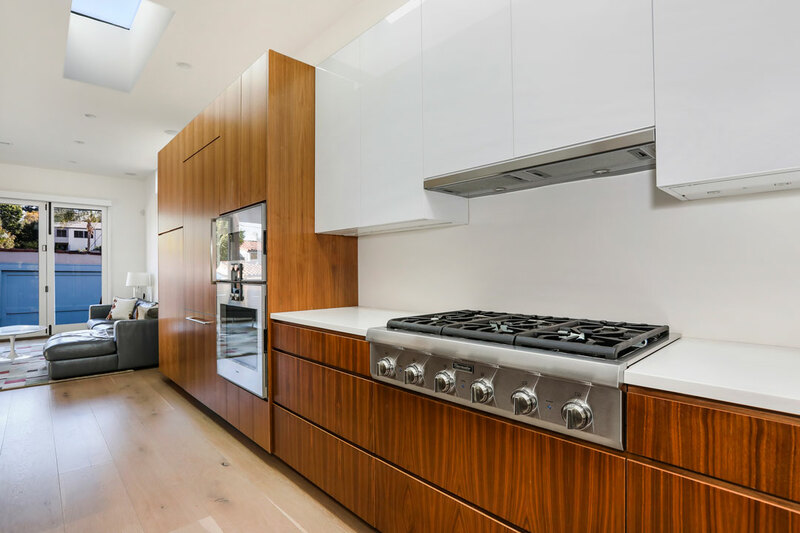 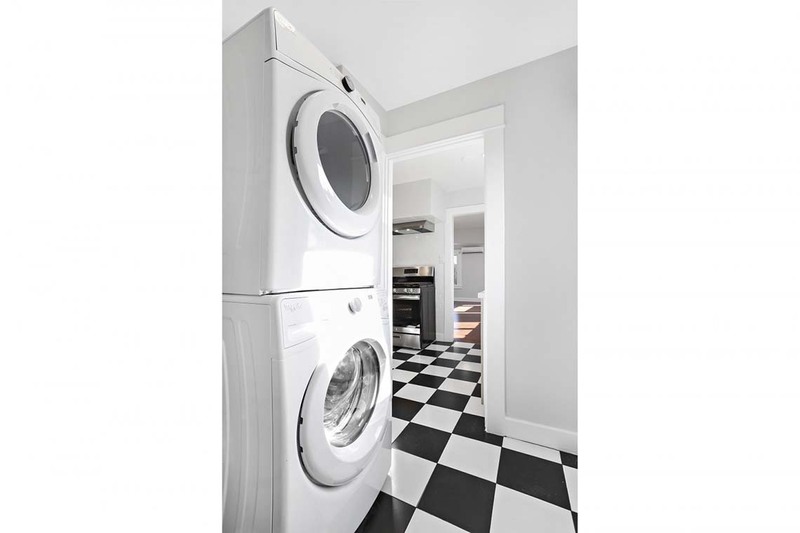 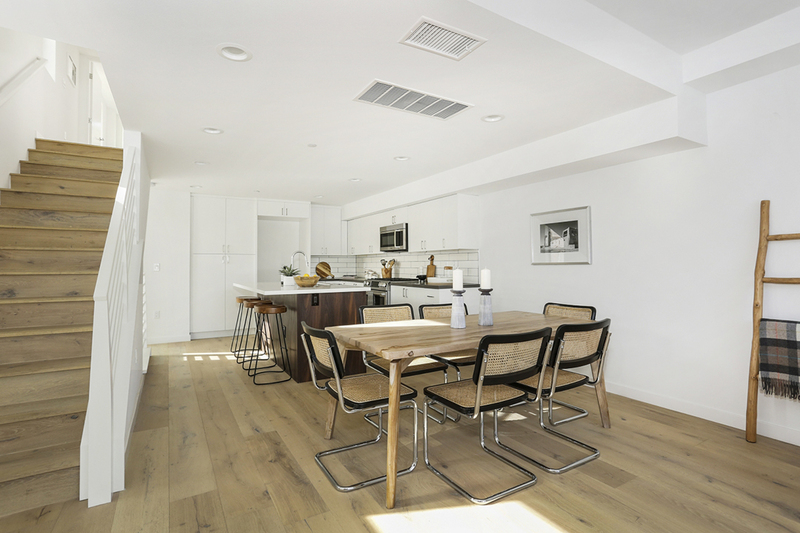 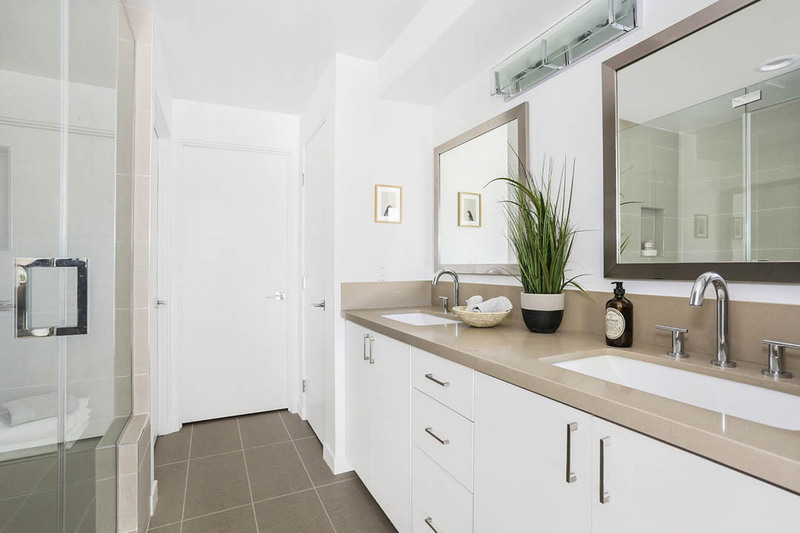 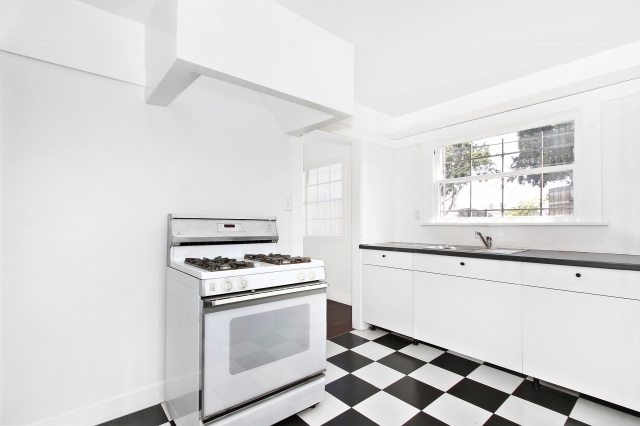 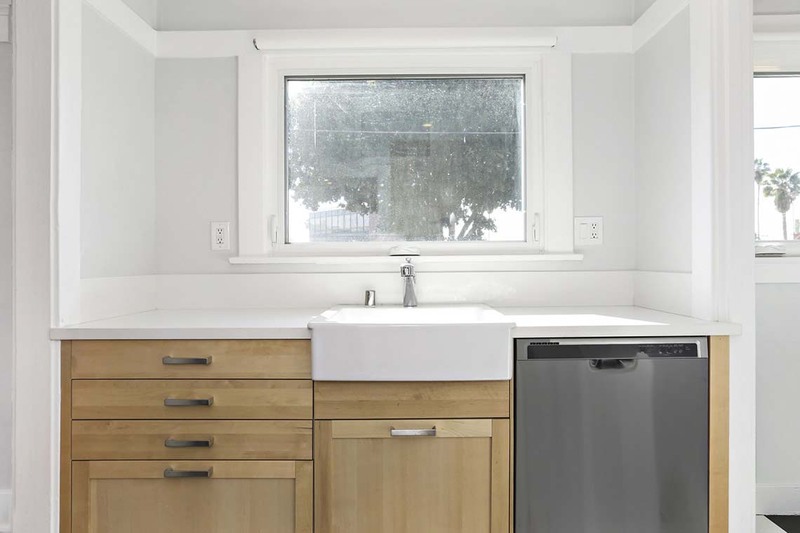 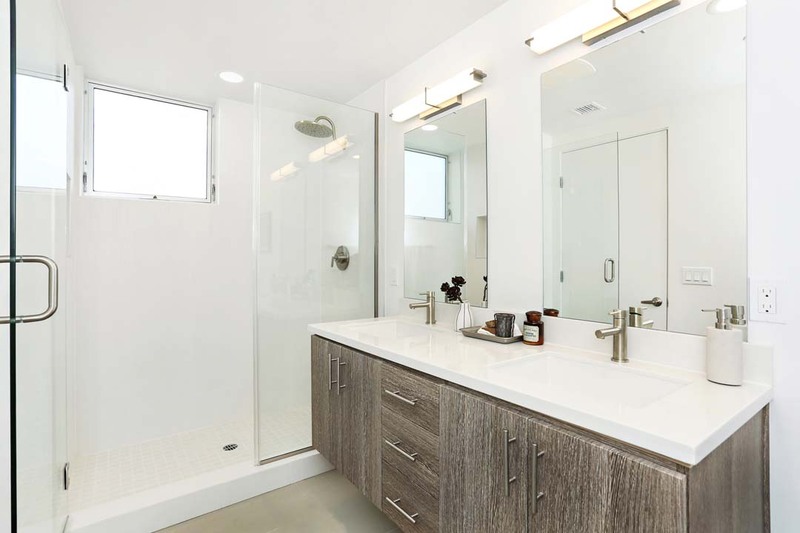 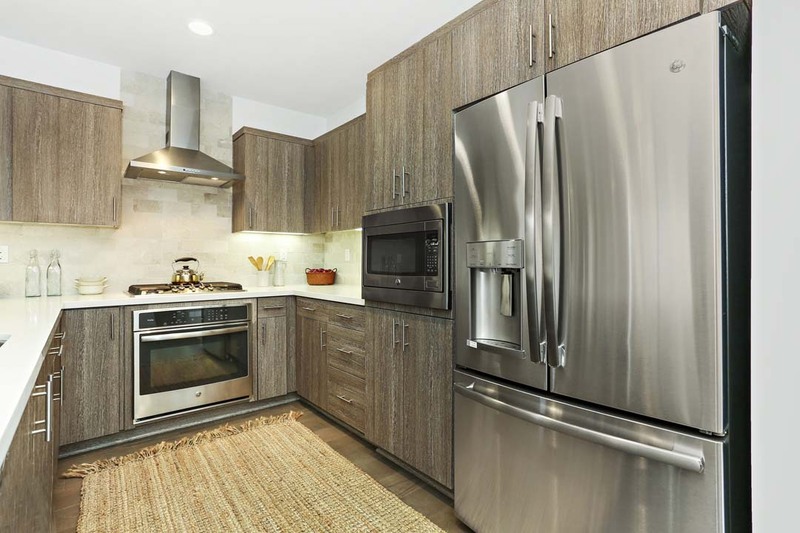 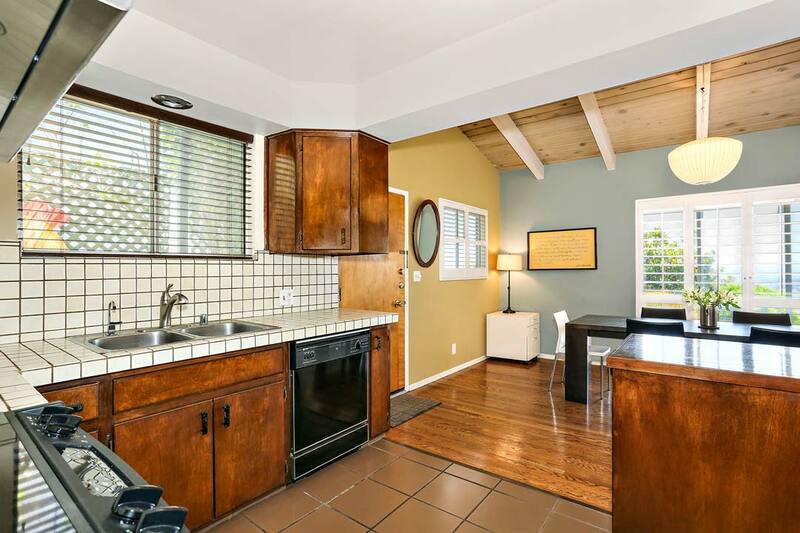 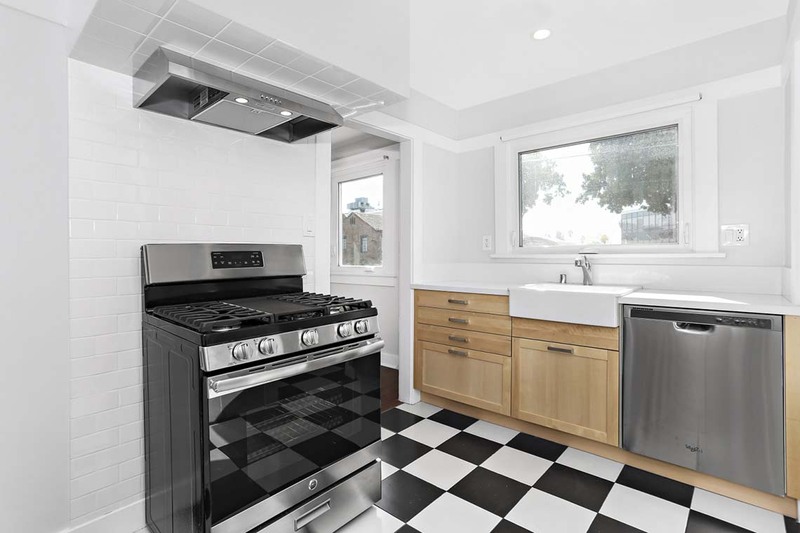 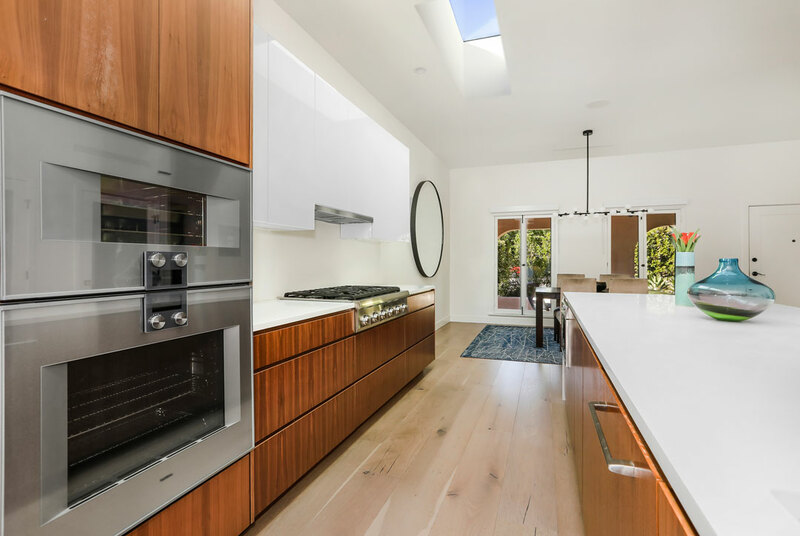 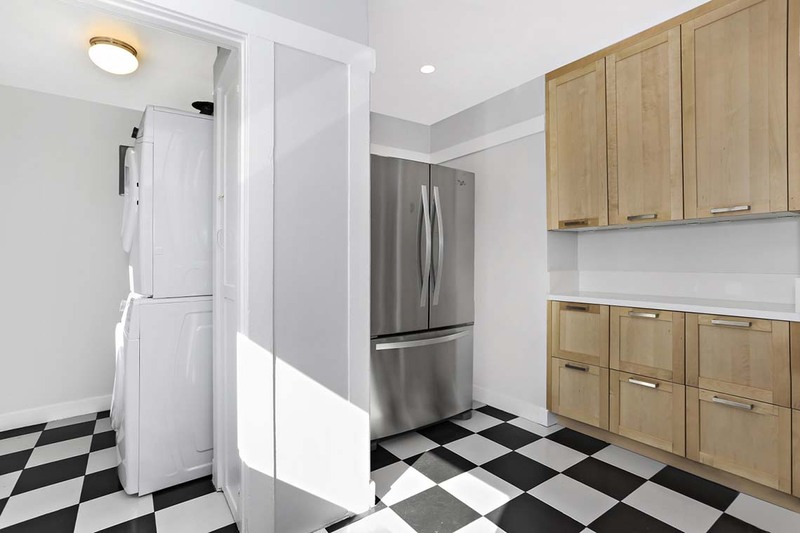 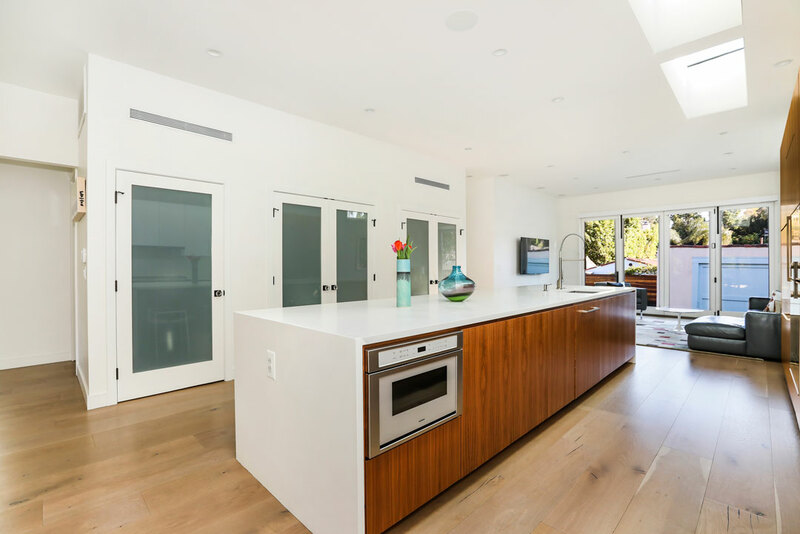 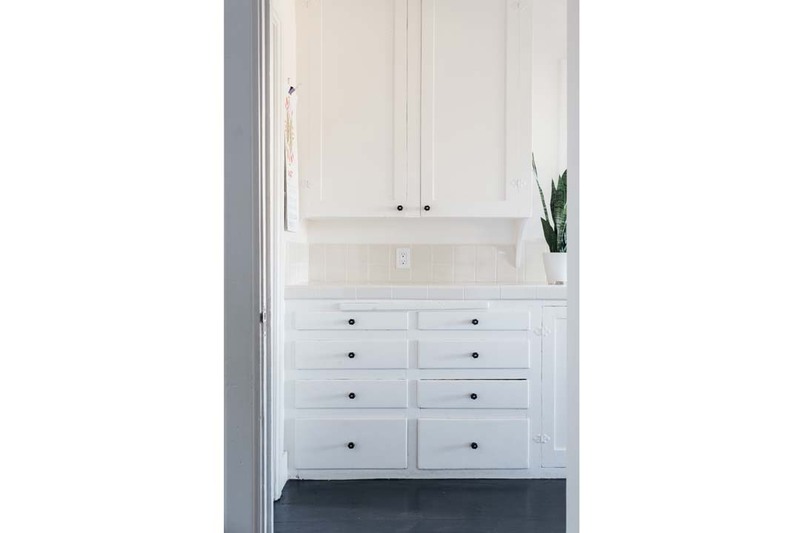 Modern interiors are finished with beautiful oak flooring, custom tile and Bosch appliances. 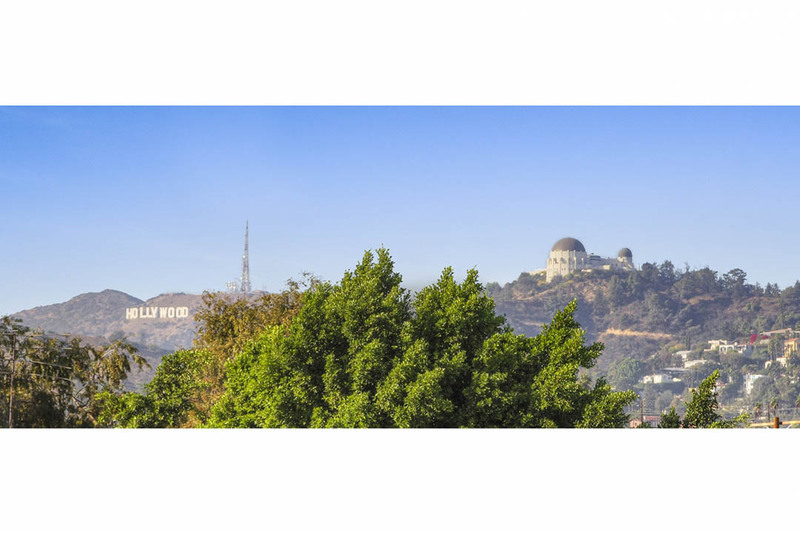 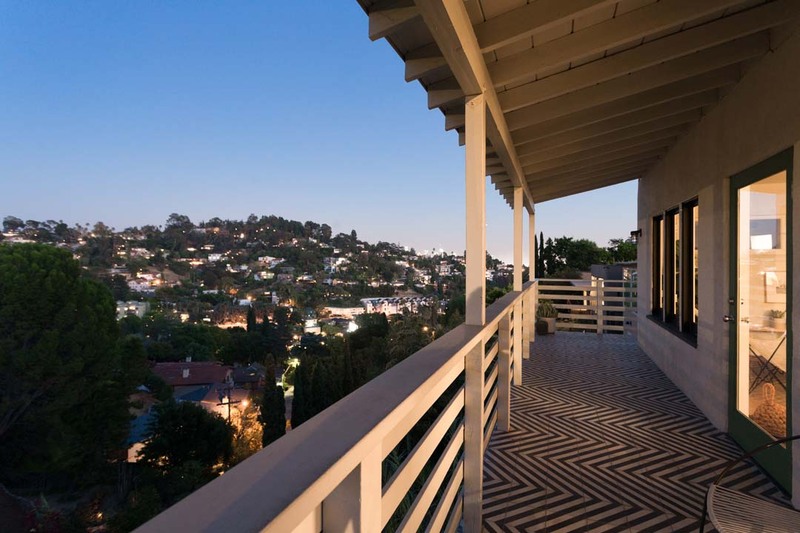 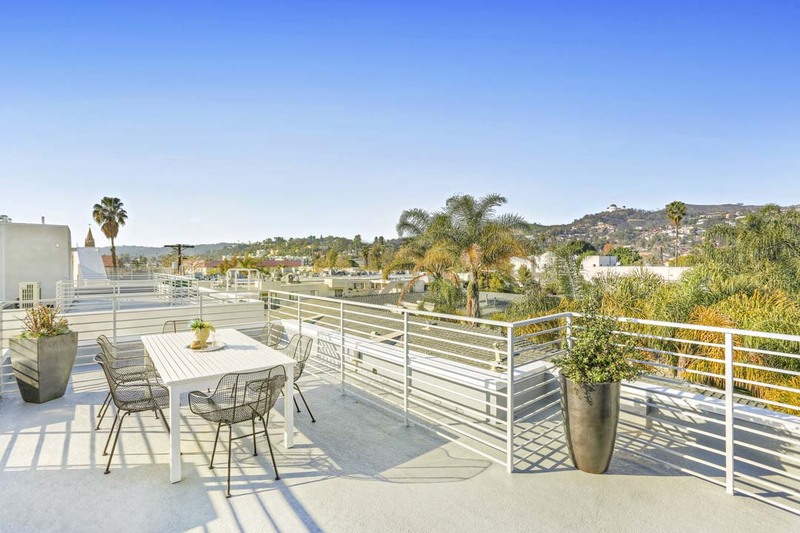 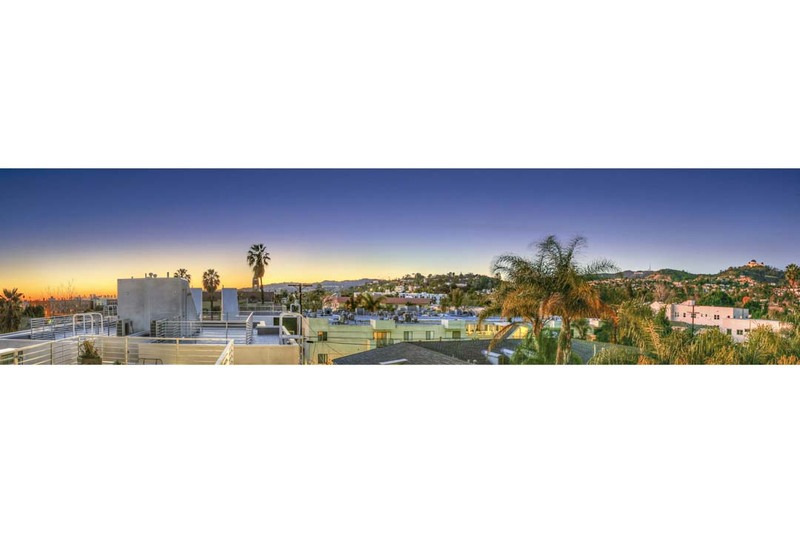 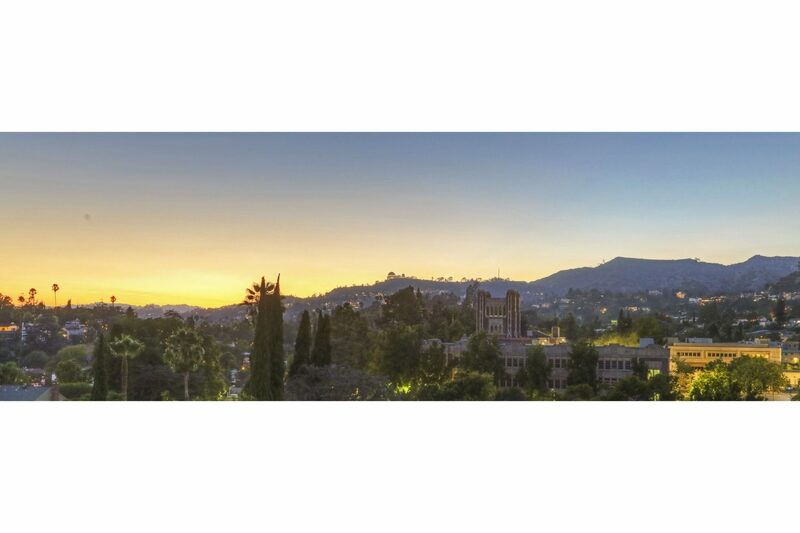 From your rooftop deck enjoy clear views of the Griffith Park Observatory, iconic palm trees and nightly sunsets. 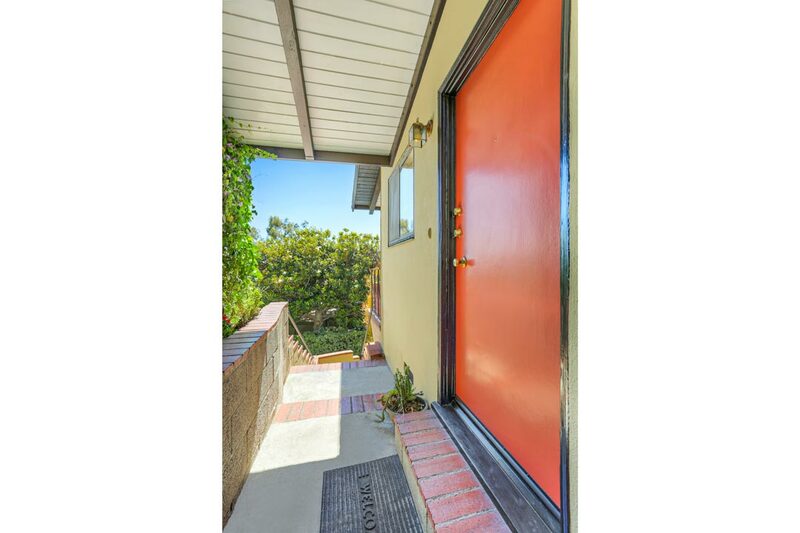 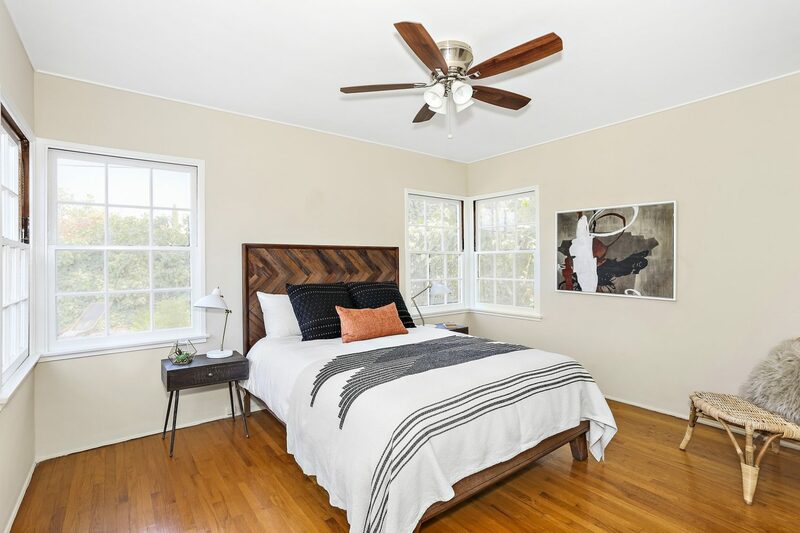 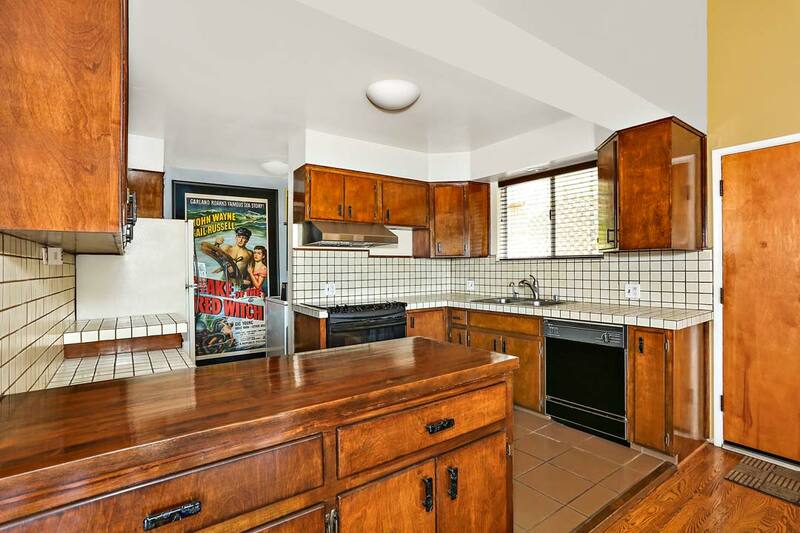 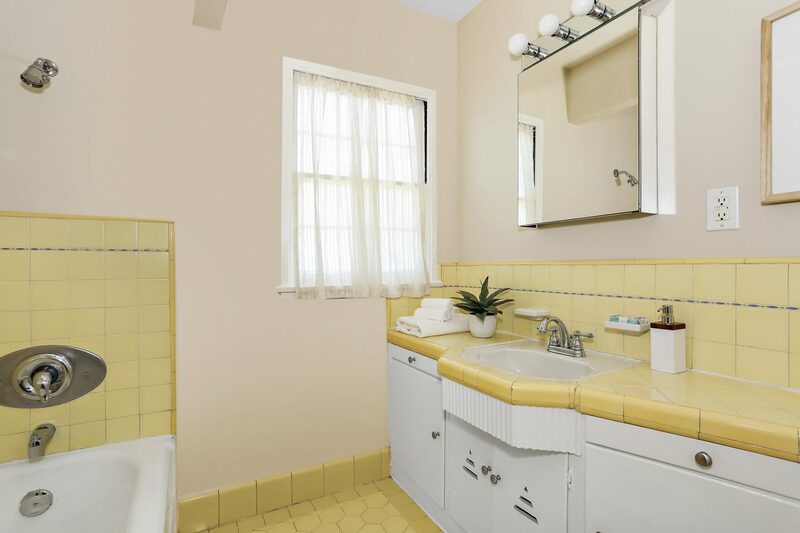 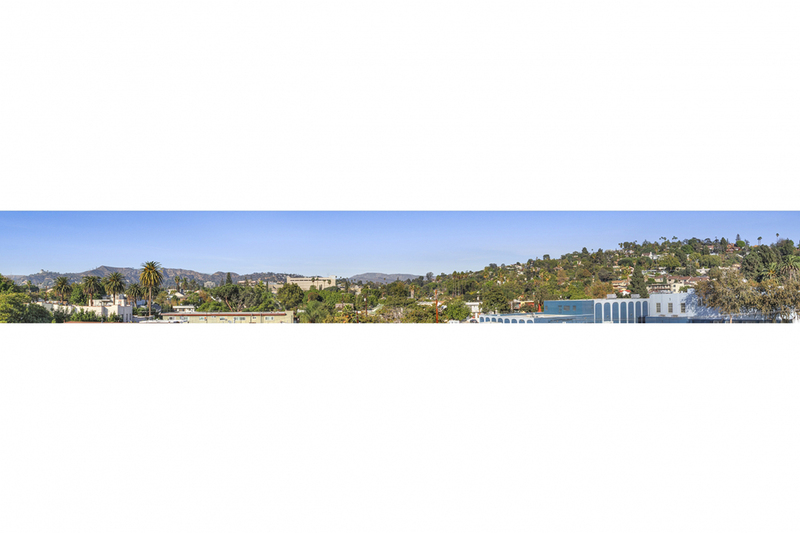 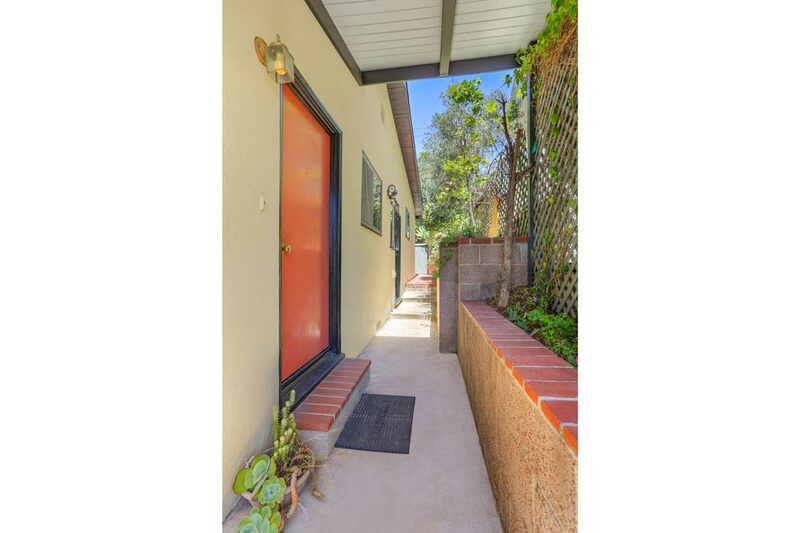 This great location between Los Feliz Village and Sunset Junction rates an 89 Walk Score (TM) placing you near Dinosaur Coffee, The Vista Theater, Griffith Park hiking trails, The Silver Lake Reservoir and two farmer’s markets. 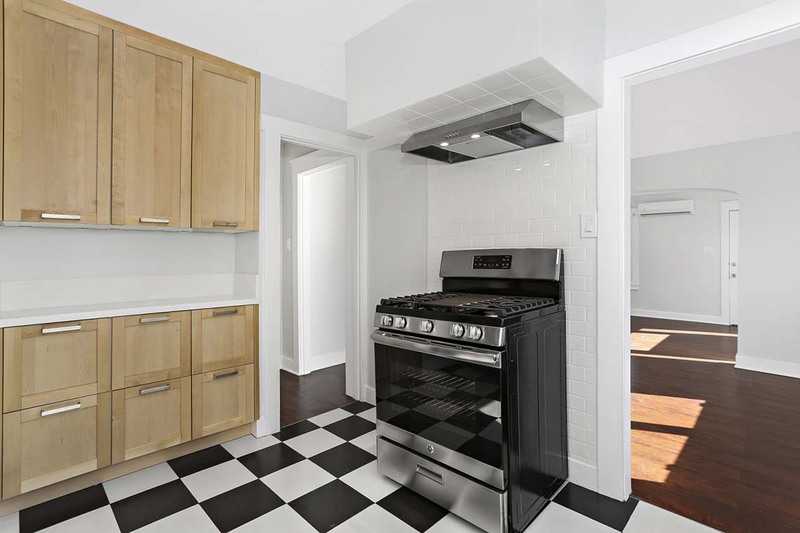 Local dining and nightlife options include The Black Cat, Malo, Bowery Bungalow, The Sit Down and many more. 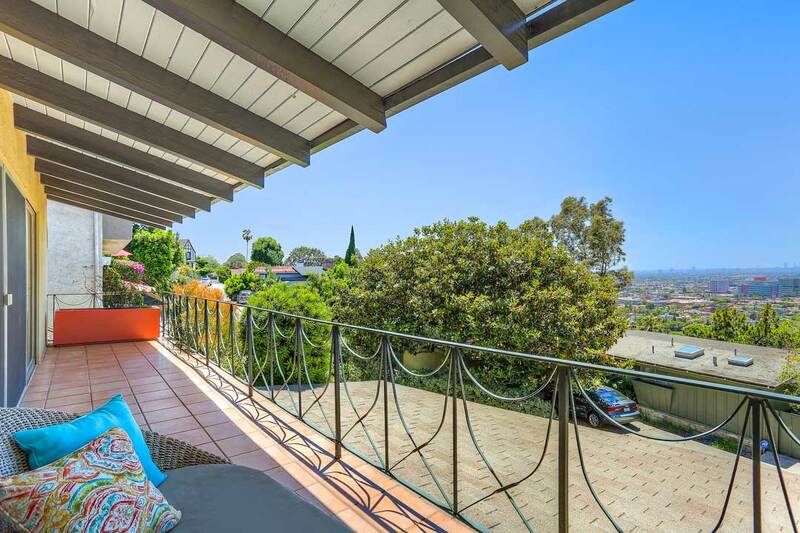 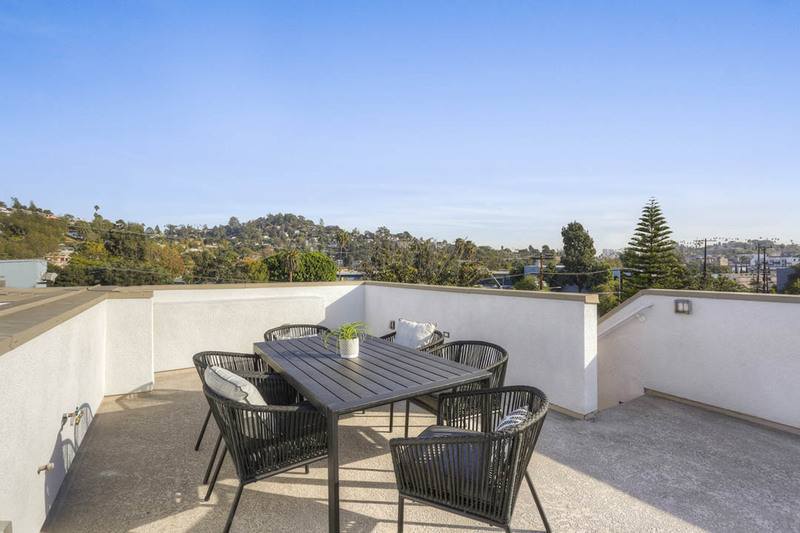 This light-filled home in the coveted Franklin Hills of Los Feliz enjoys soaring, unobstructed vistas of the Griffith Park Observatory and surrounding hillsides. 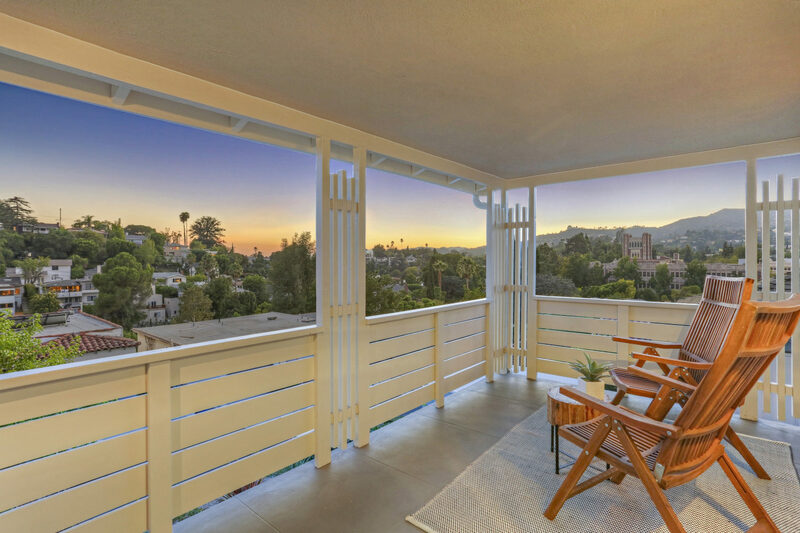 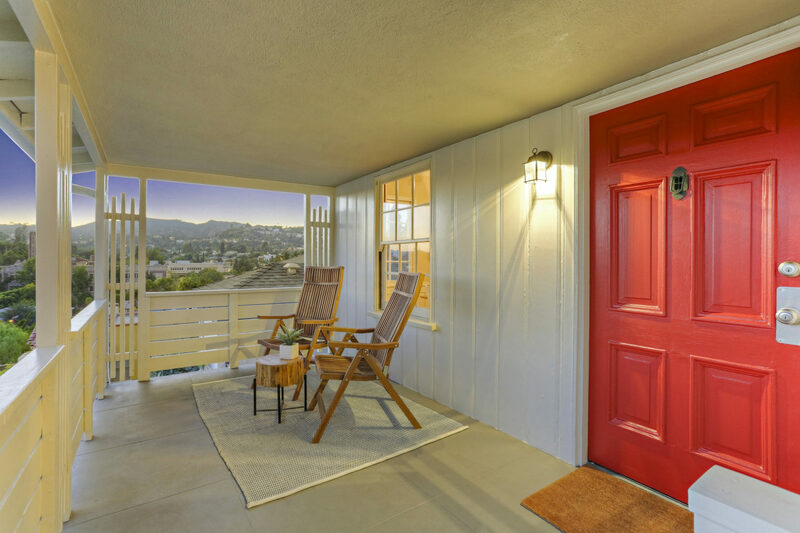 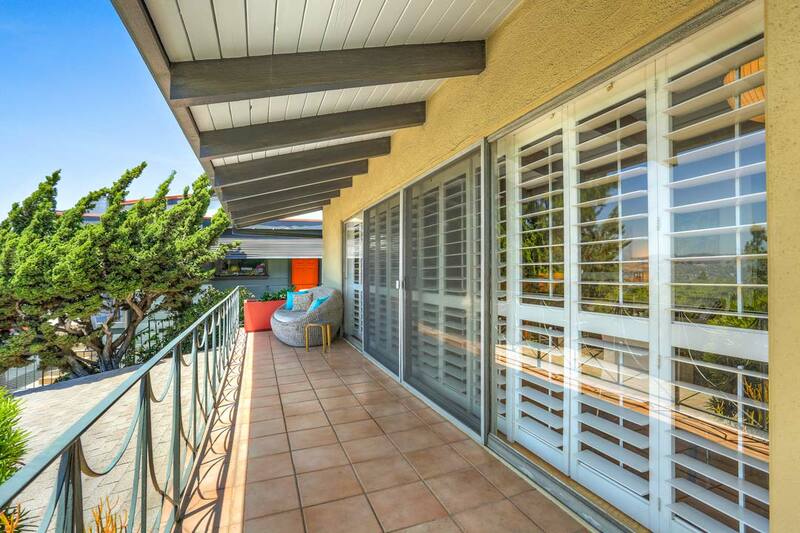 Elevated above the street, the residence welcomes you with a sitting porch where you will relish every sunset. 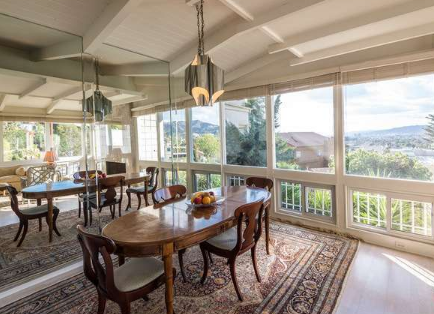 Inside find a traditional layout featuring wood flooring and plenty of windows that gather daylight and soak up the views. 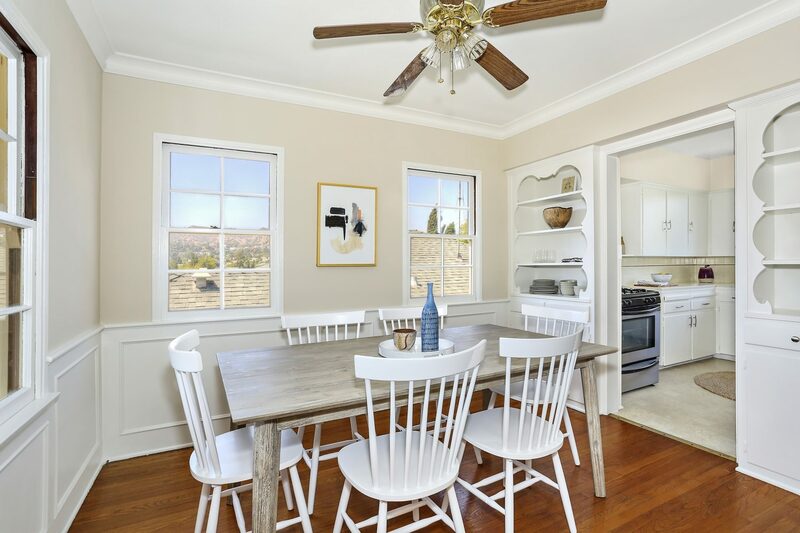 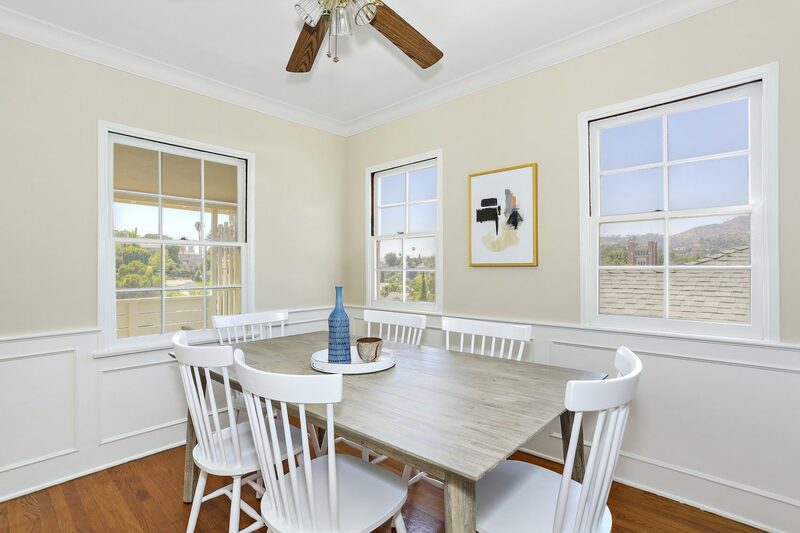 Period accents include built-ins and French Doors opening to a lovely patio and large, flat yard — a rare find in this neighborhood, and the ideal spot to relax and entertain while taking in painterly landscapes all around. 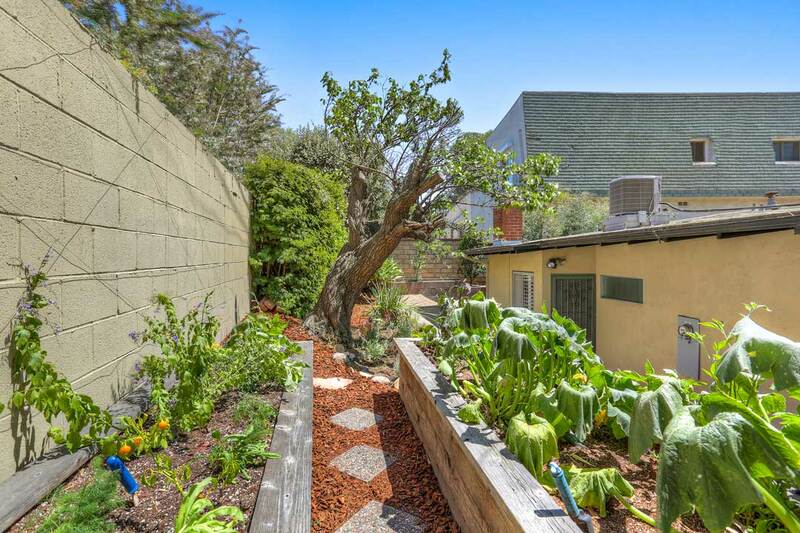 There’s a two-car garage and front yard planted with lavender, succulents, and a plum tree. 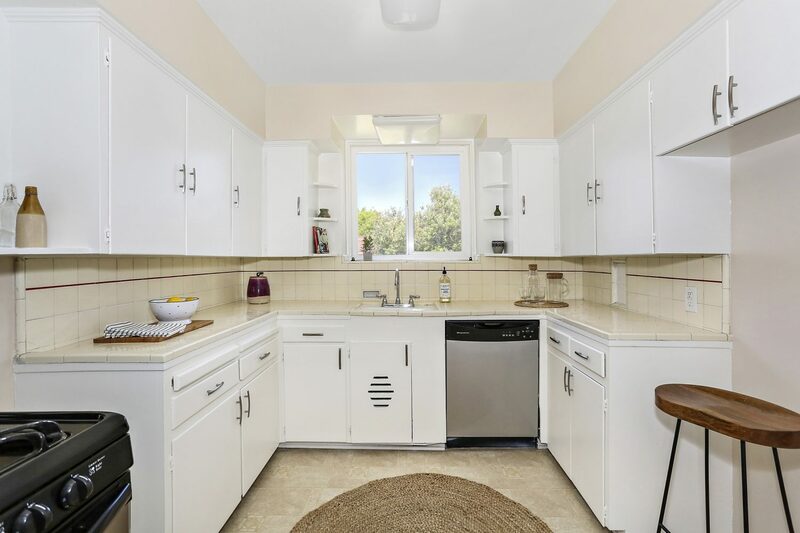 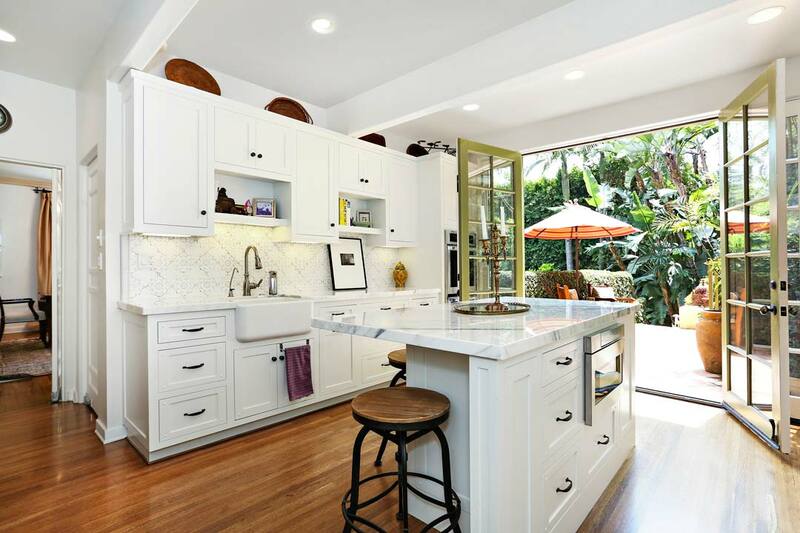 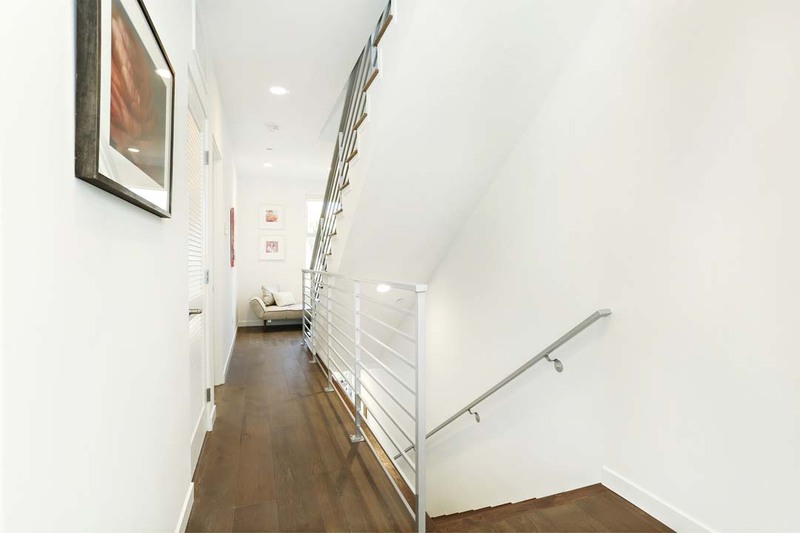 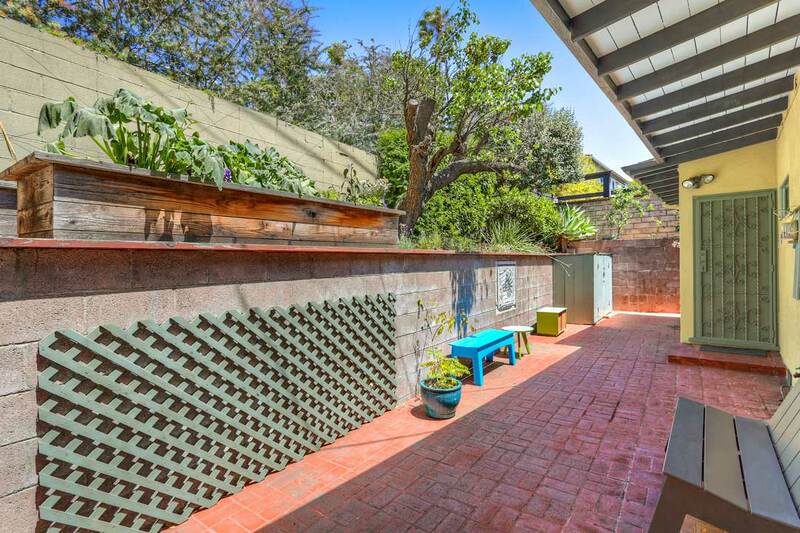 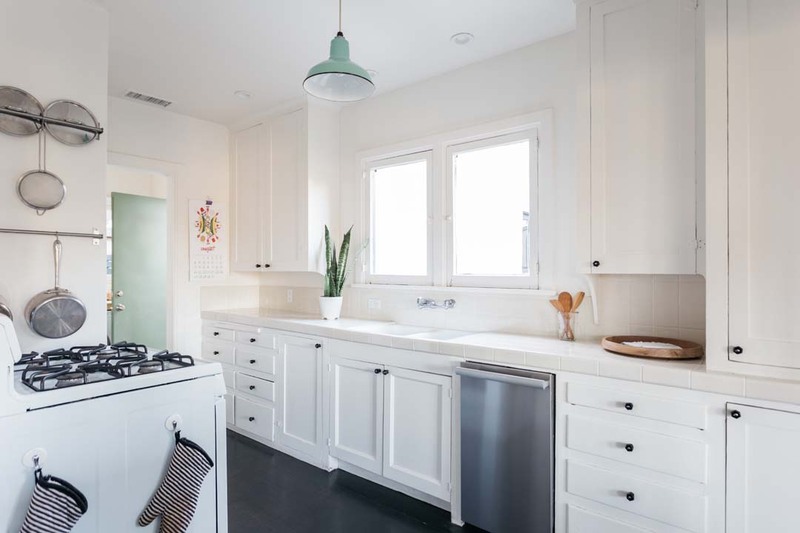 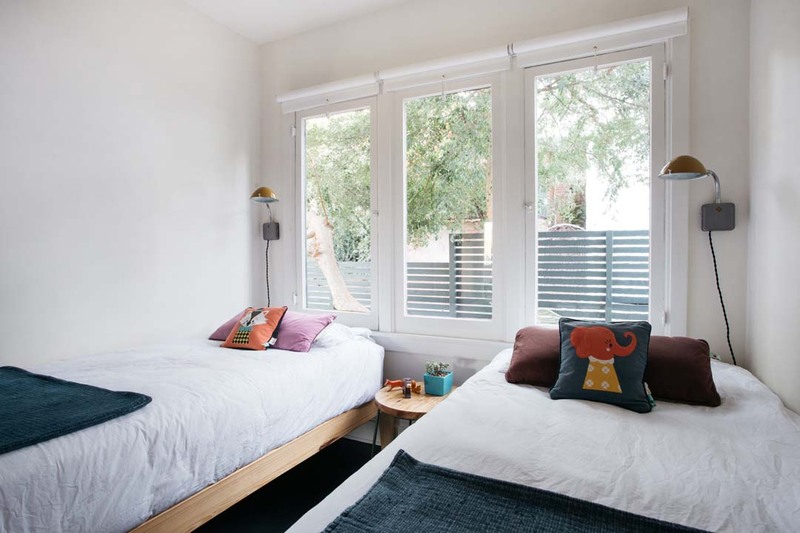 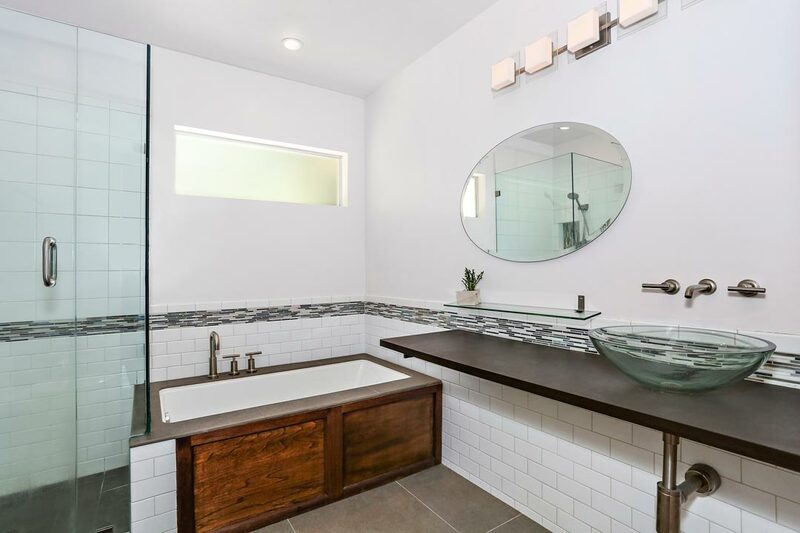 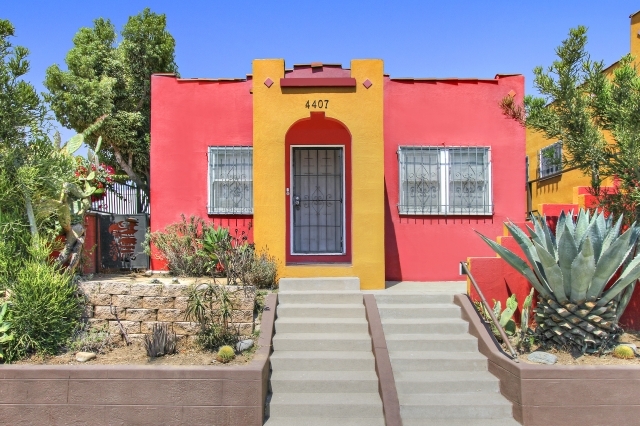 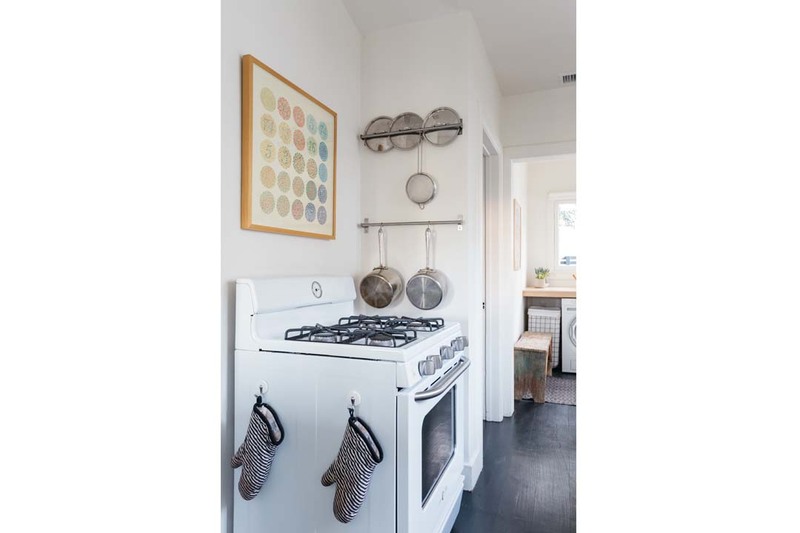 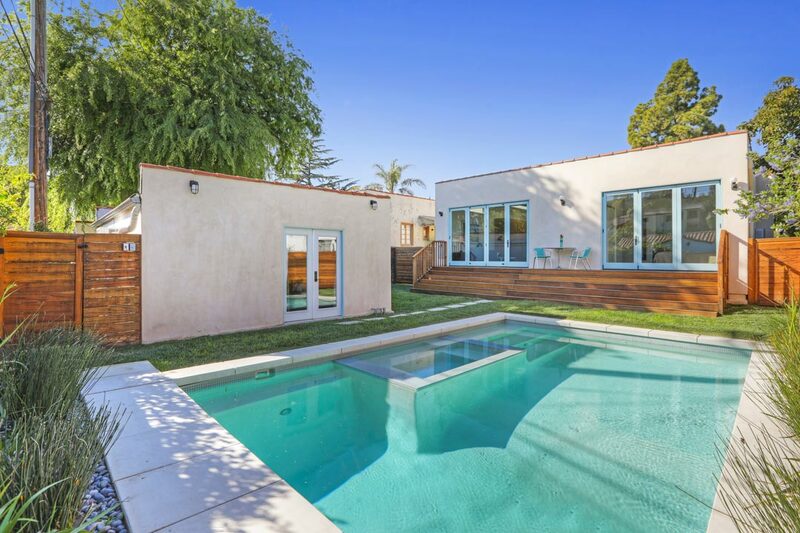 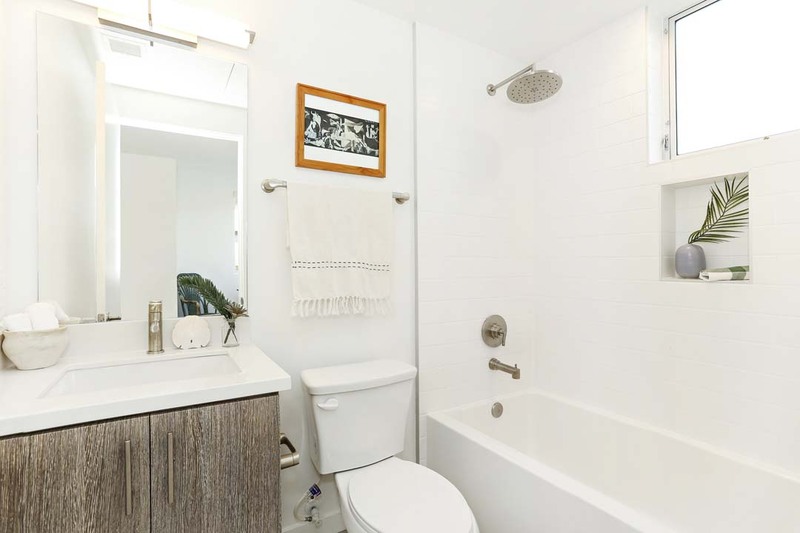 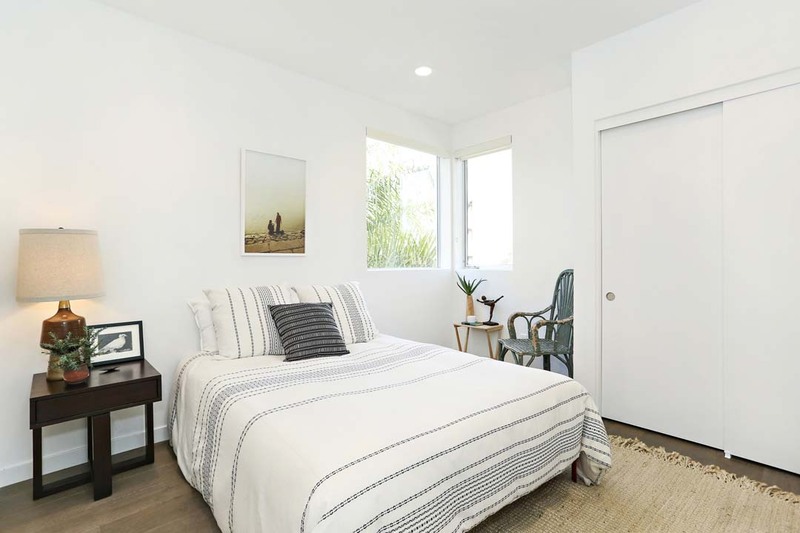 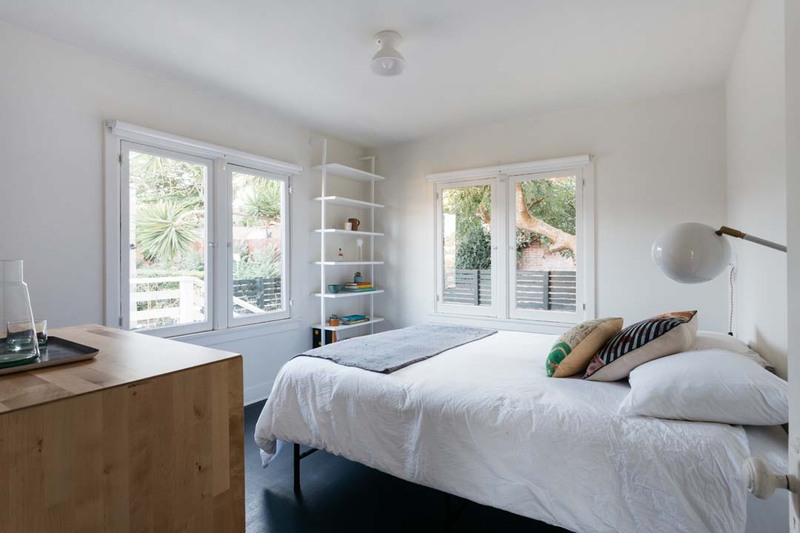 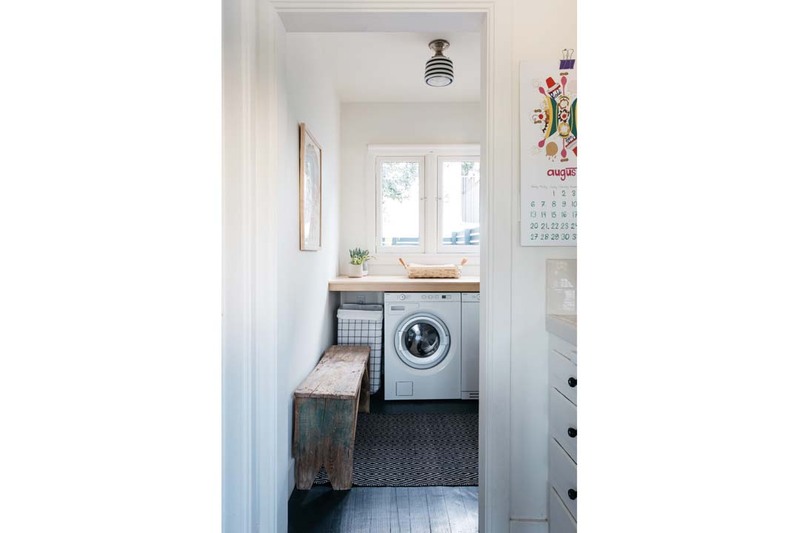 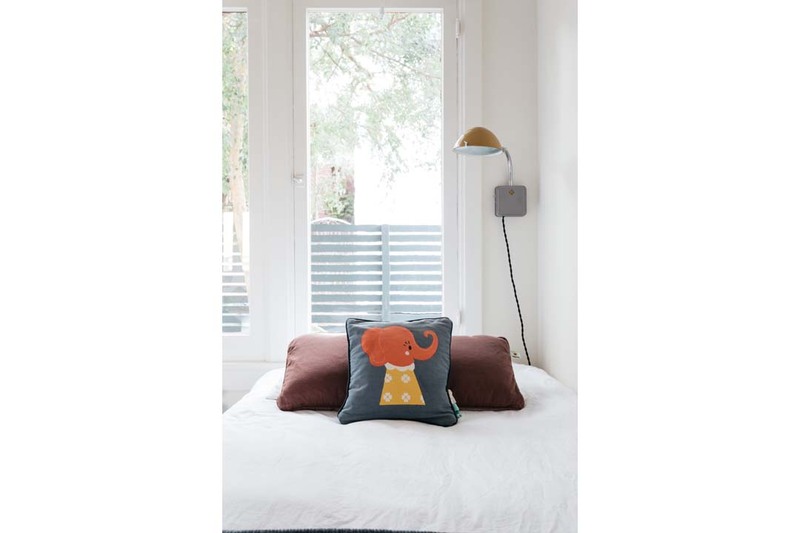 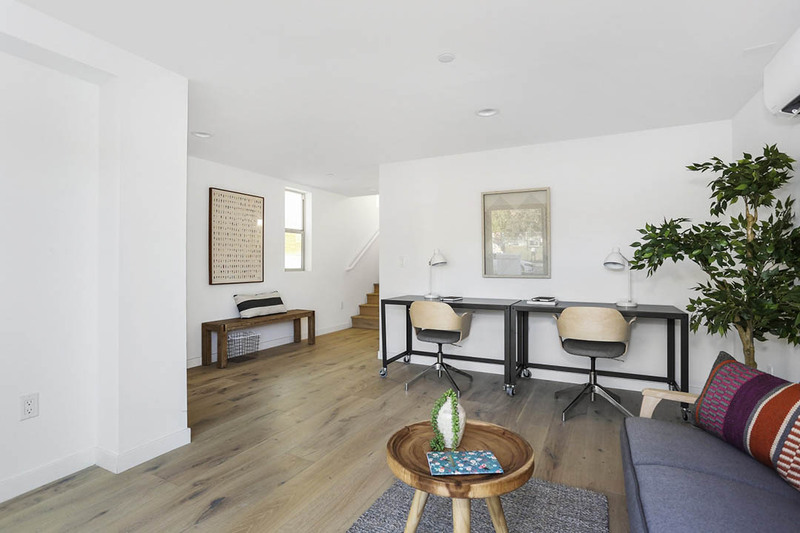 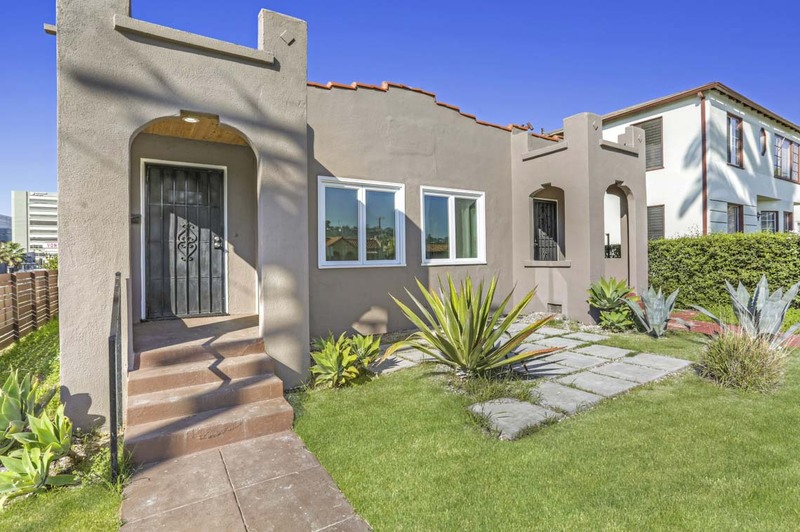 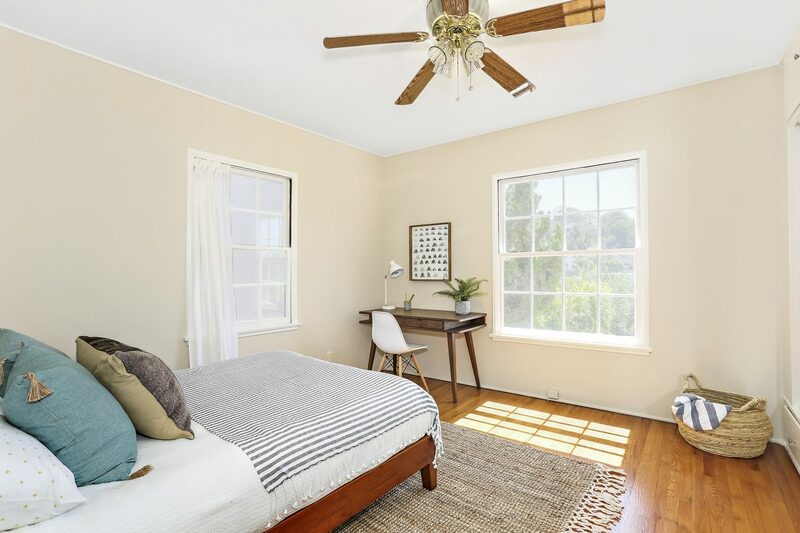 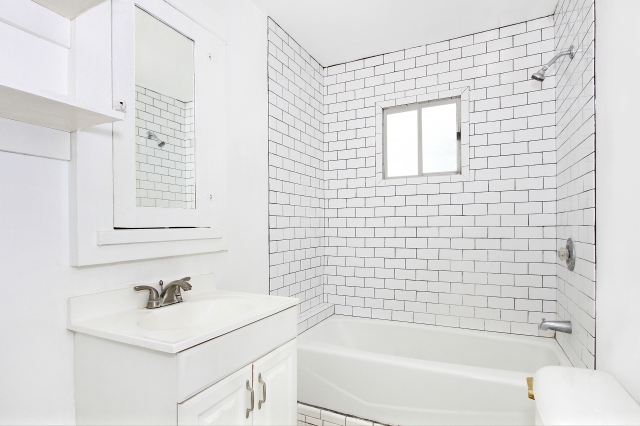 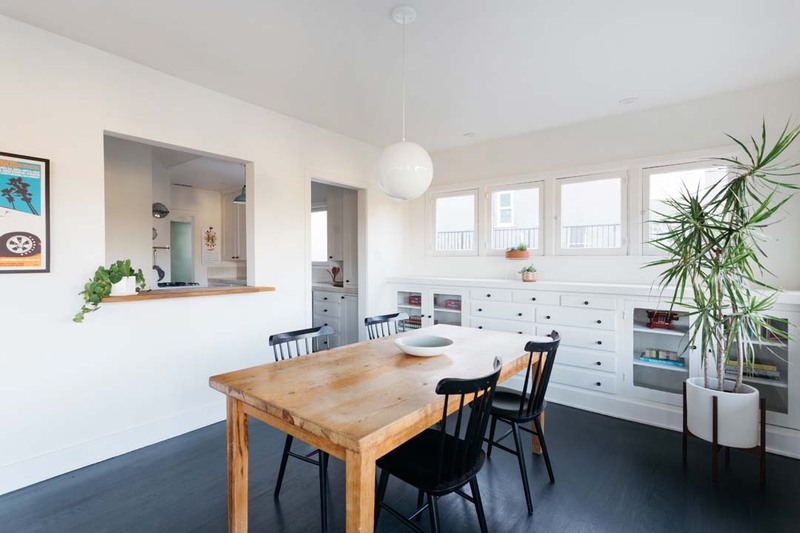 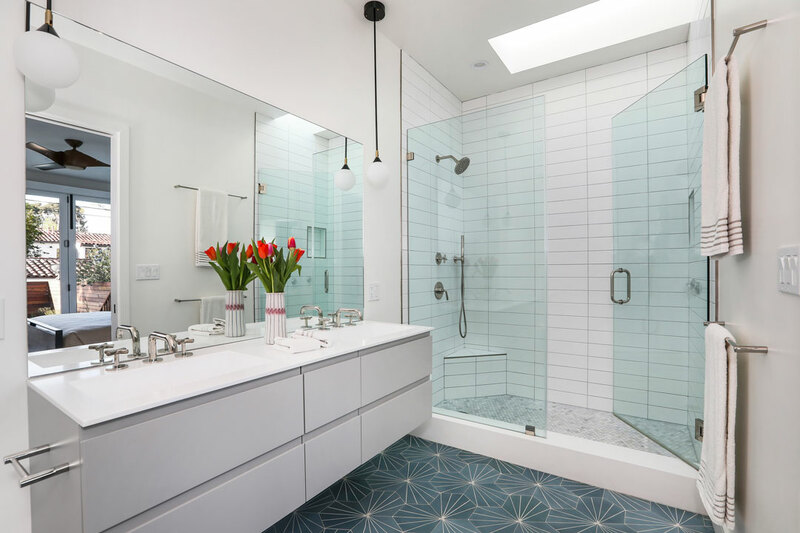 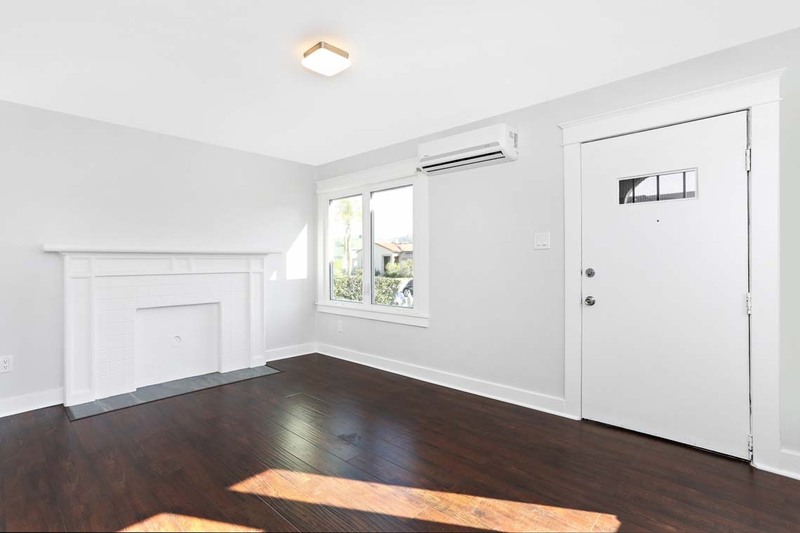 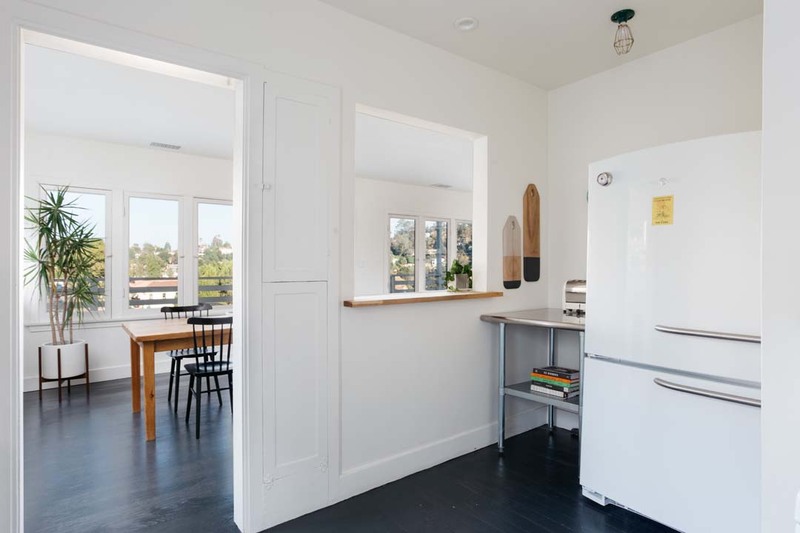 This desirable location in the prestigious Franklin Elementary school district puts you near local favorites in both Los Feliz and Silver Lake including Little Dom’s, Speranza, Trader Joe’s, Lassens Market and more. 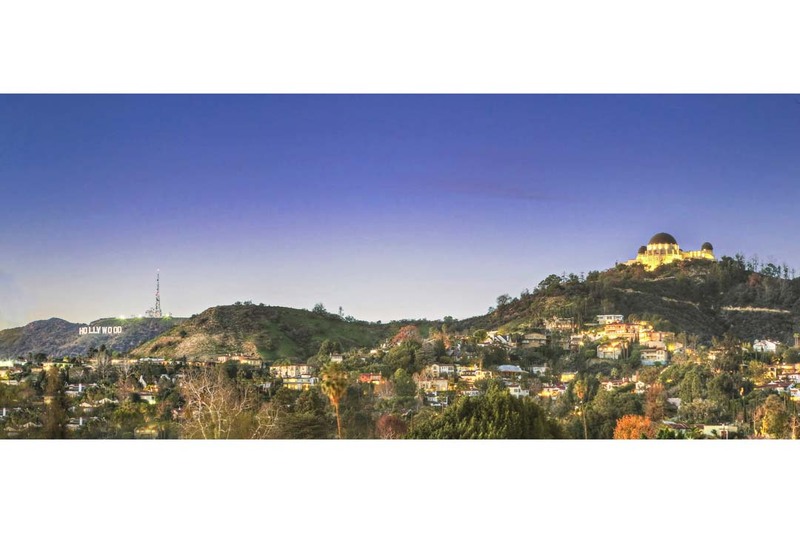 Griffith Park and The Silver Lake Reservoir are within easy reach. 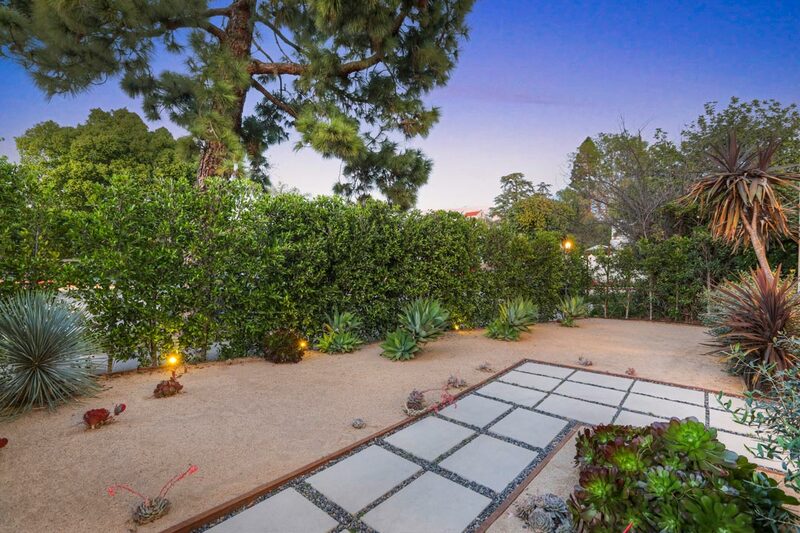 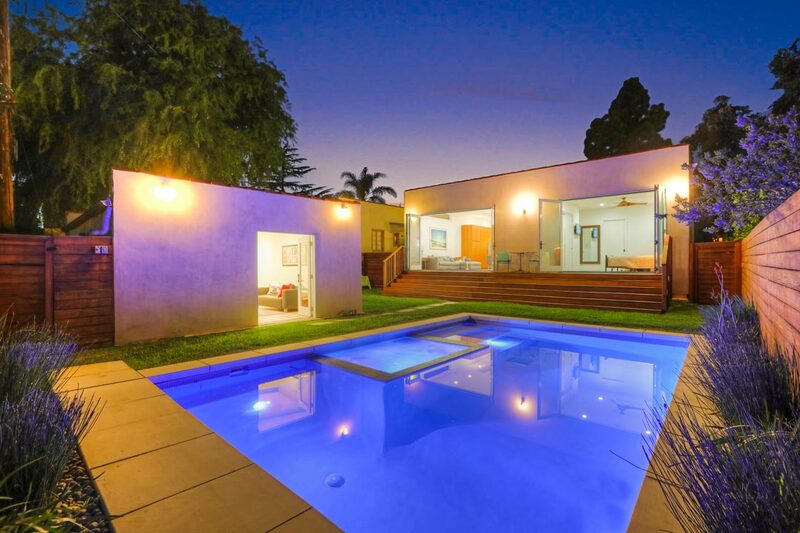 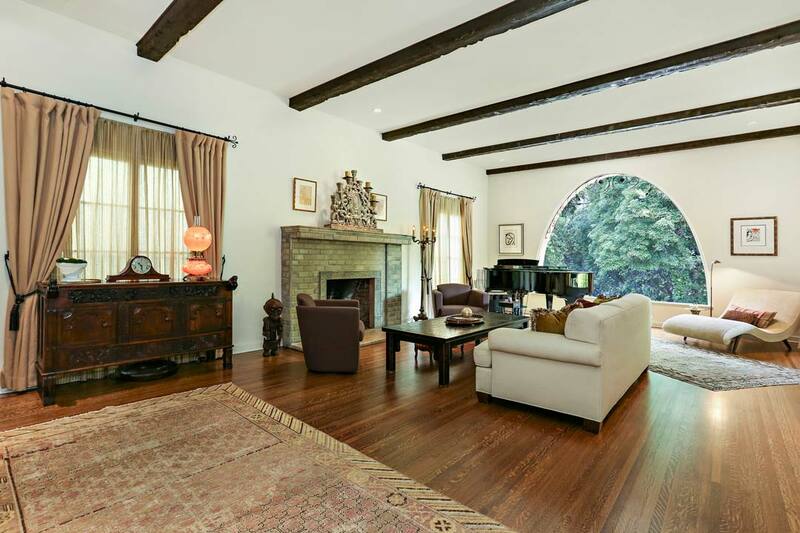 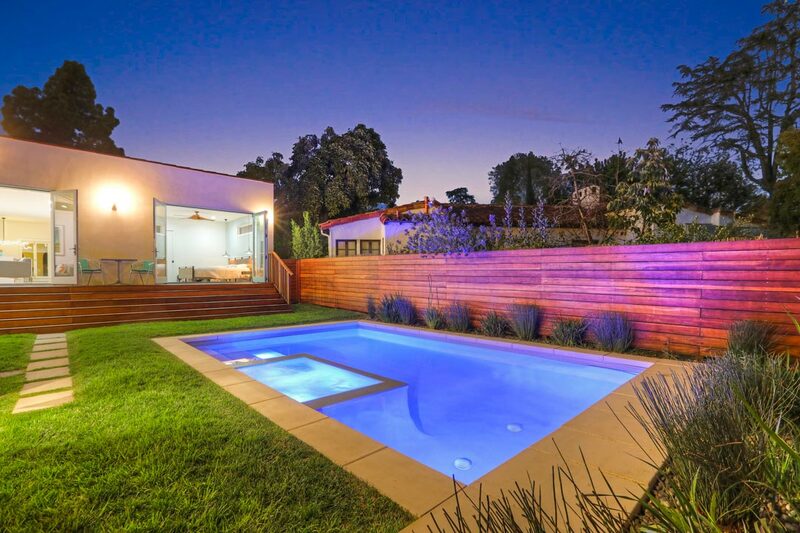 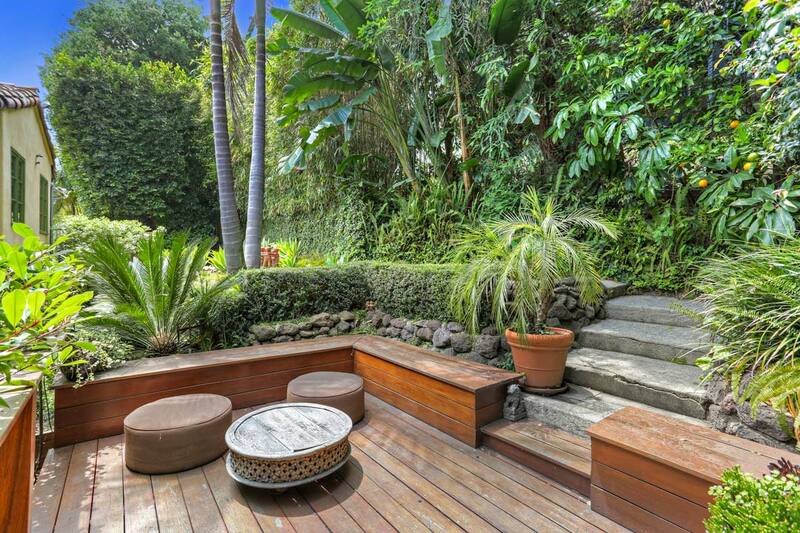 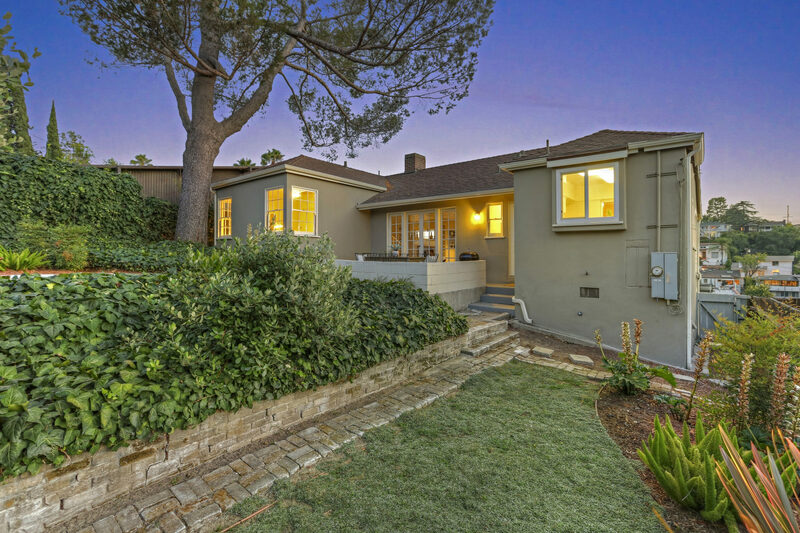 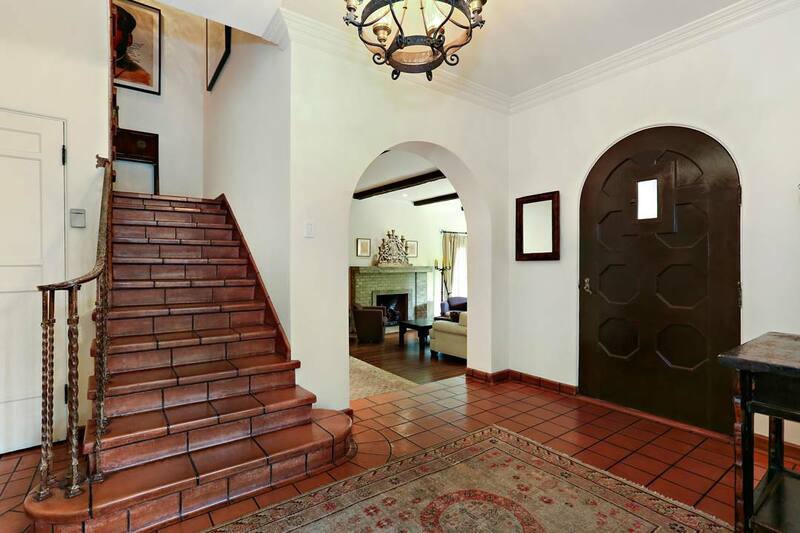 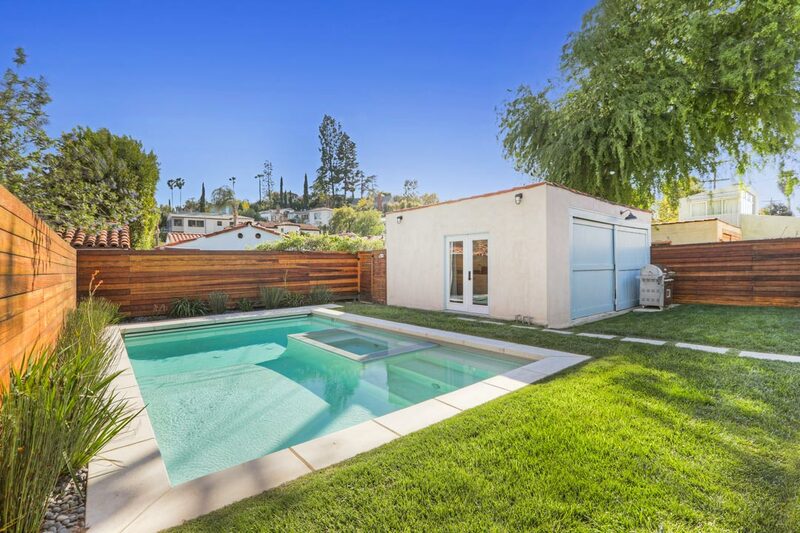 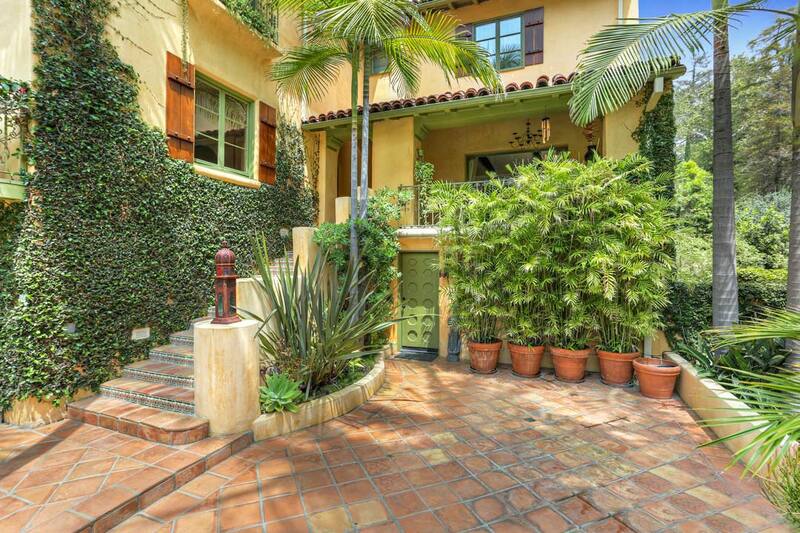 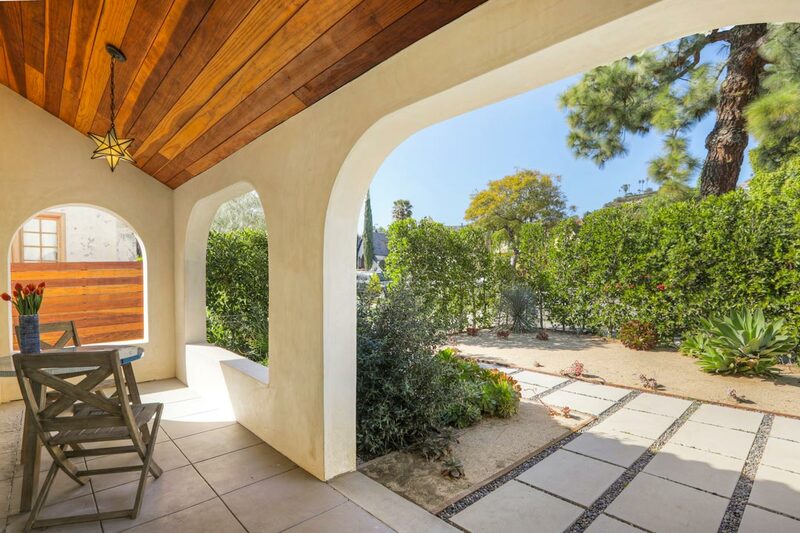 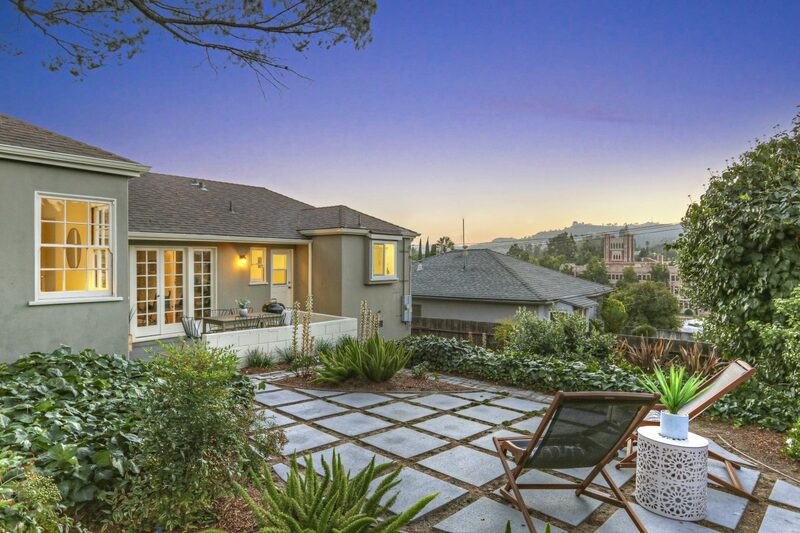 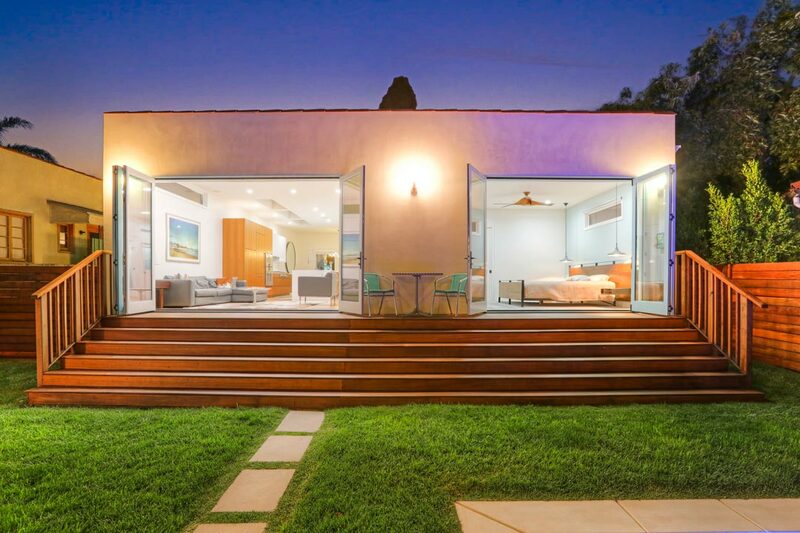 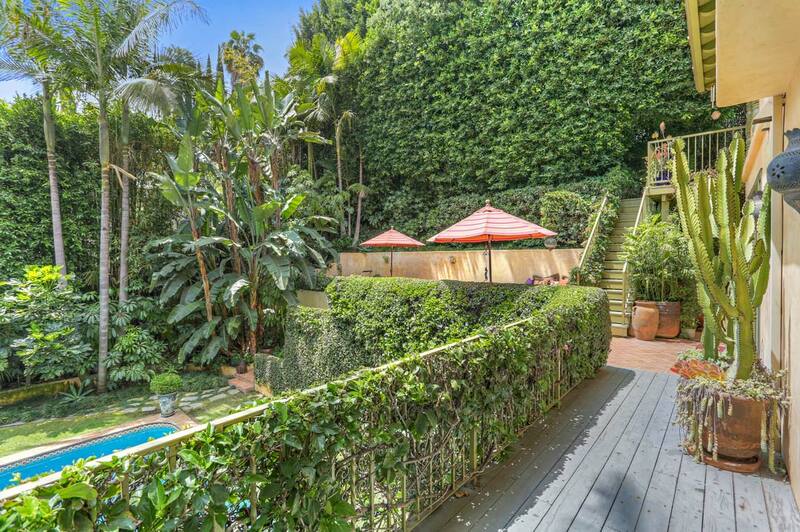 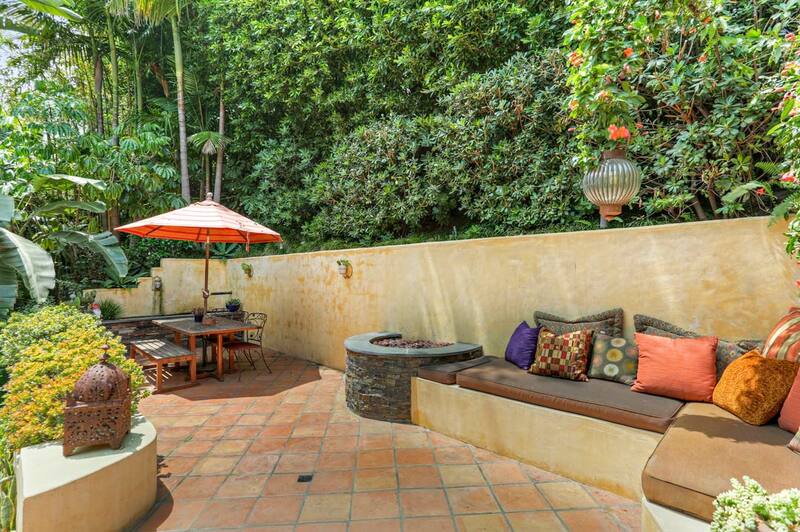 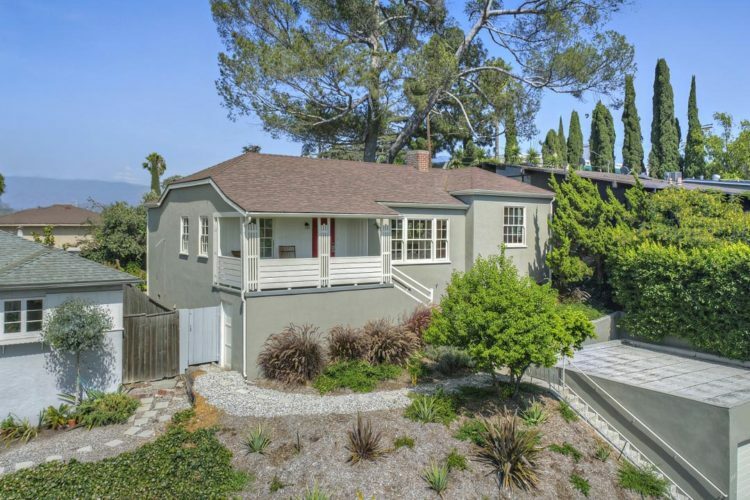 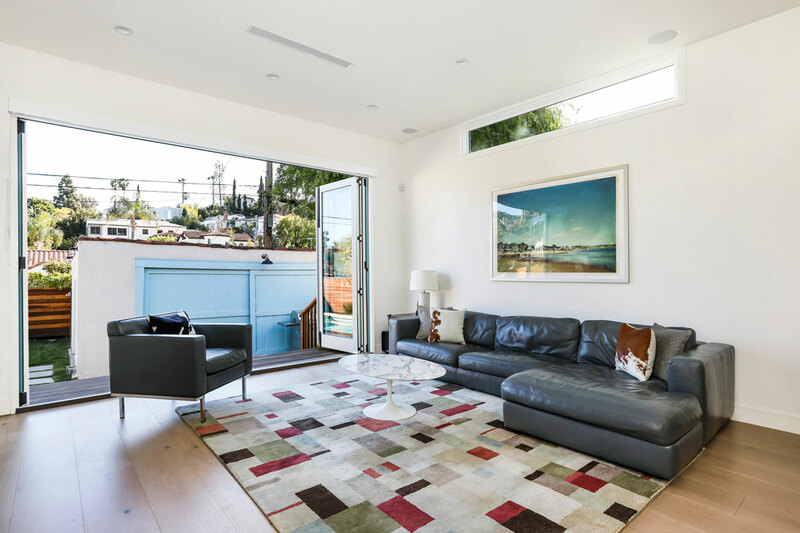 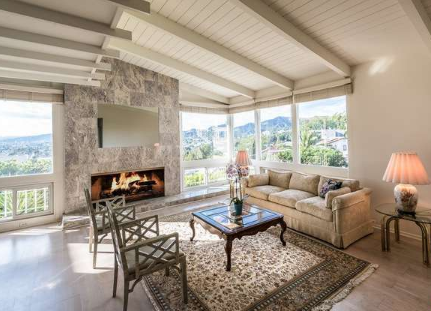 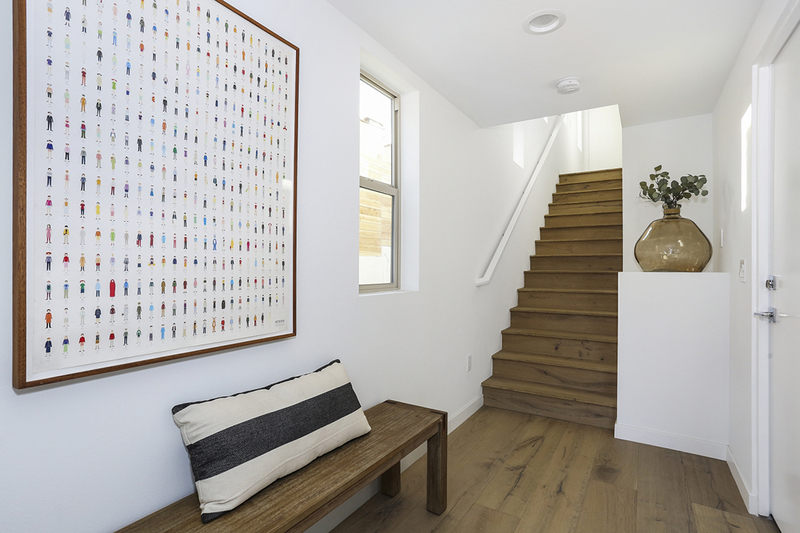 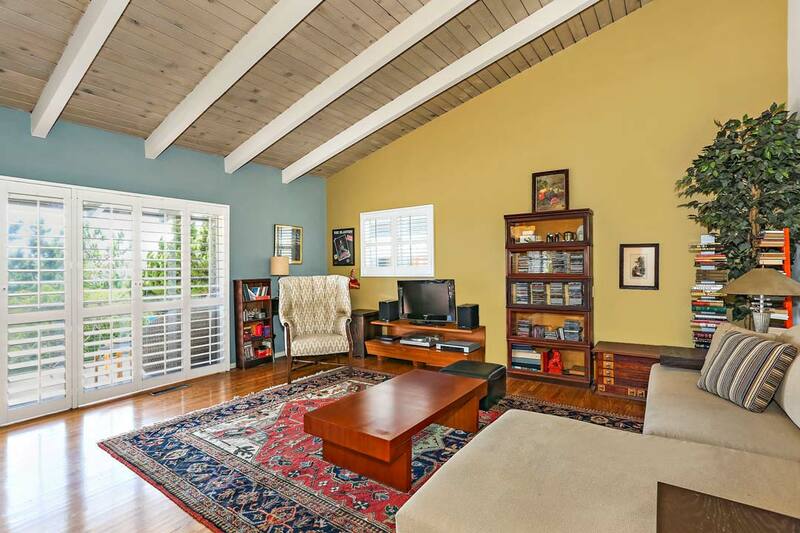 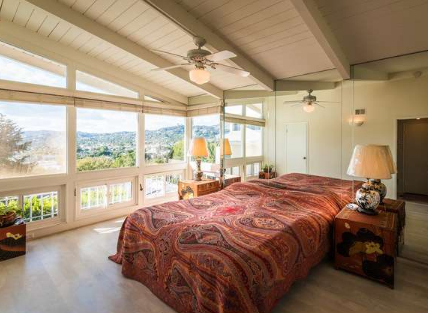 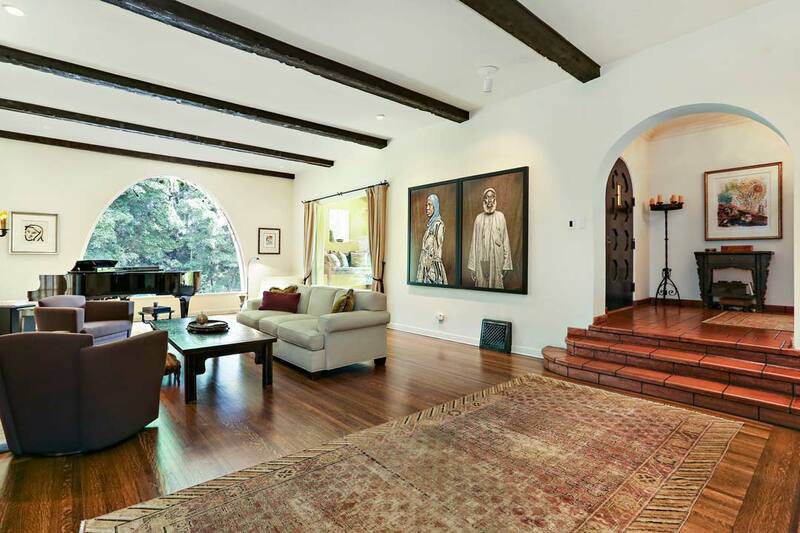 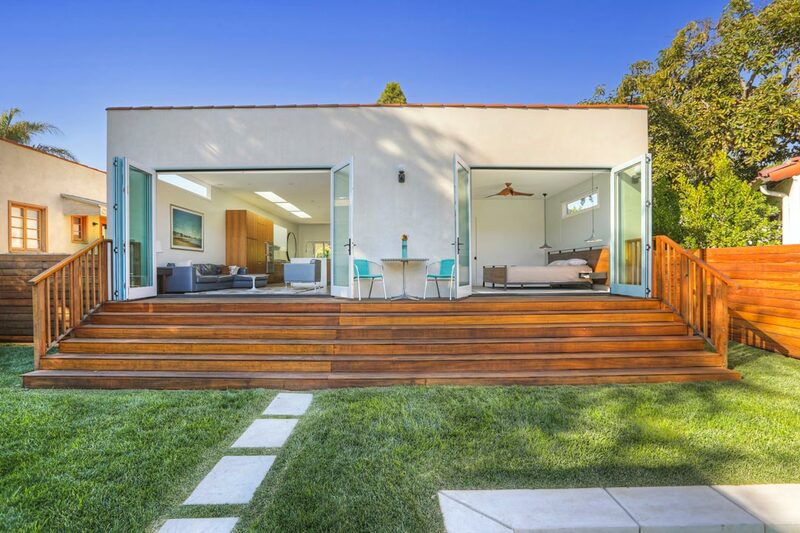 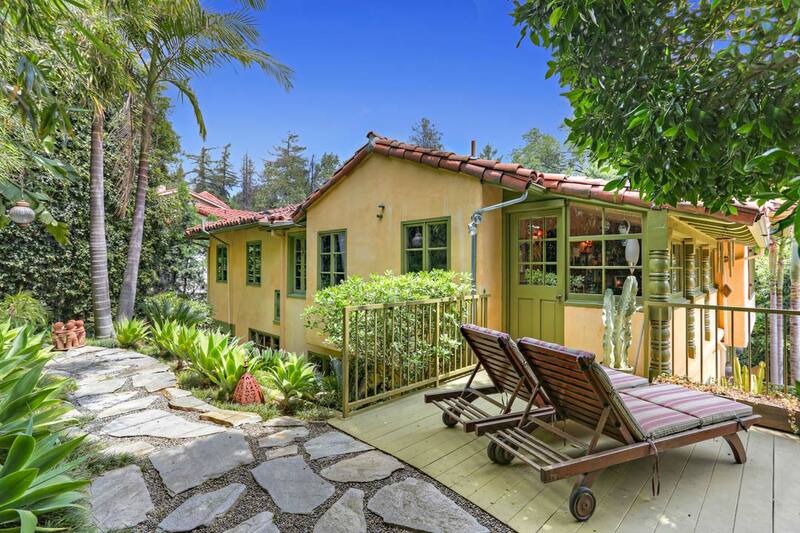 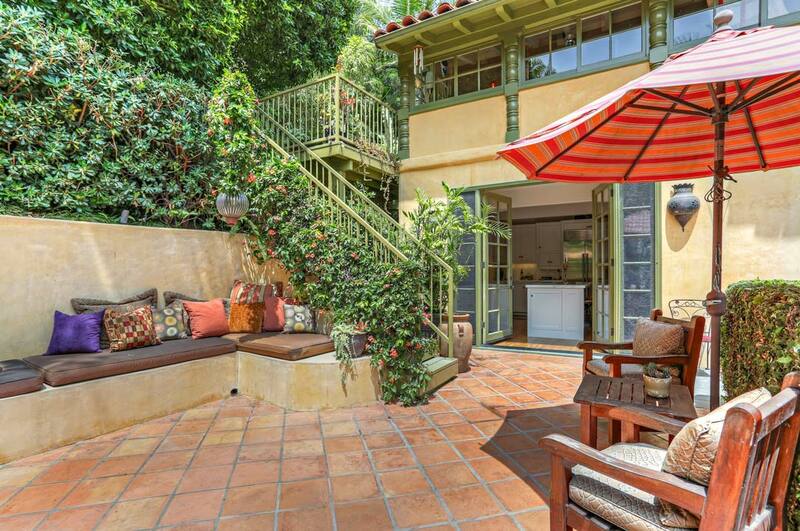 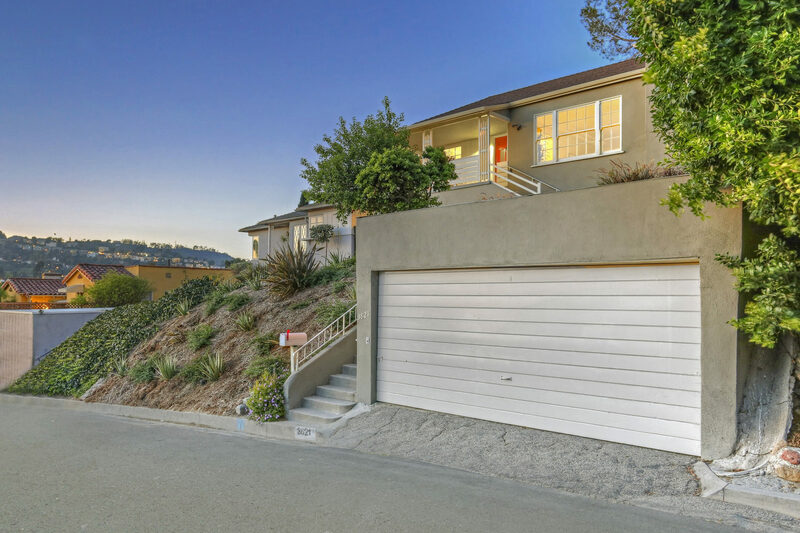 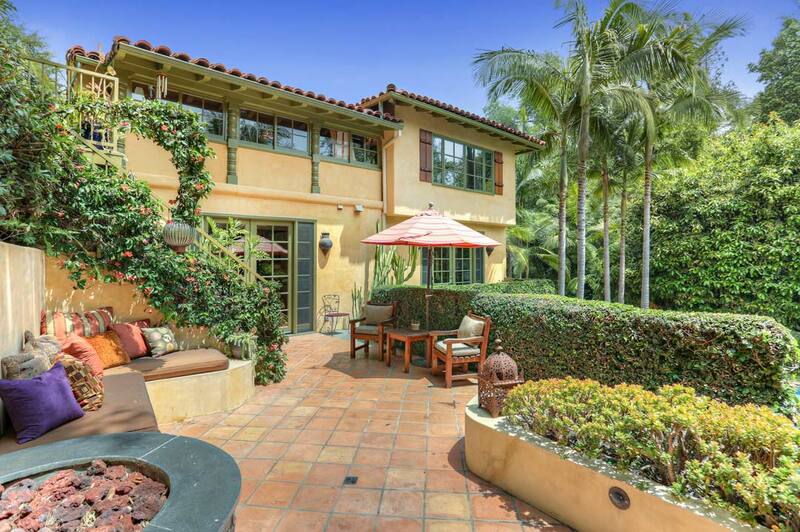 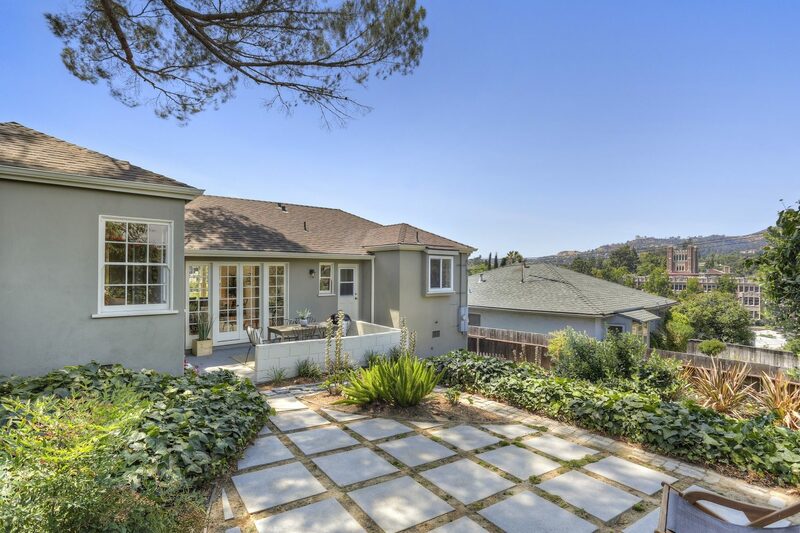 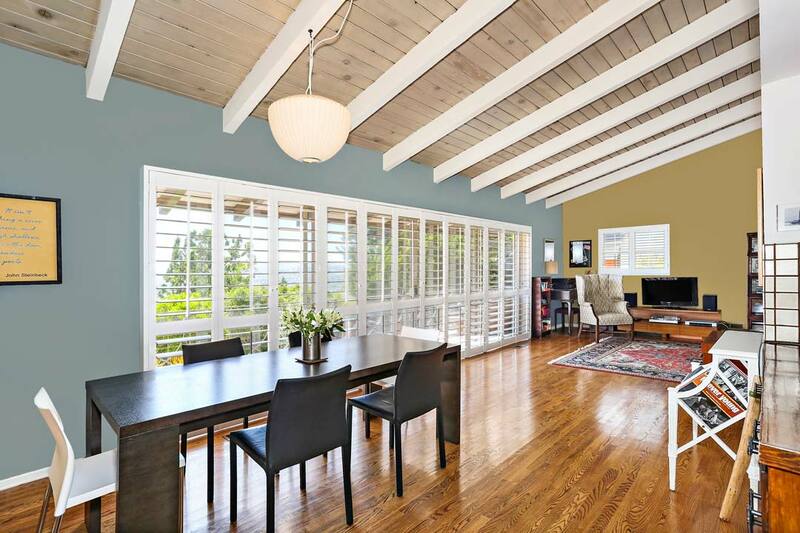 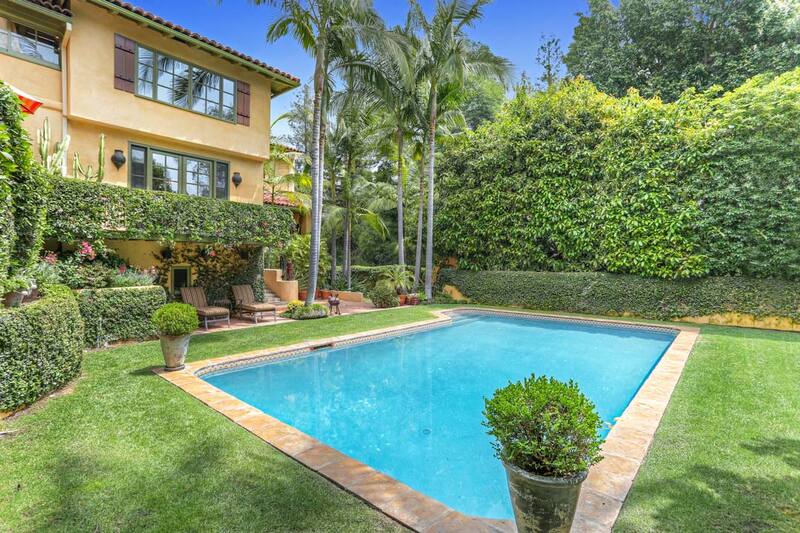 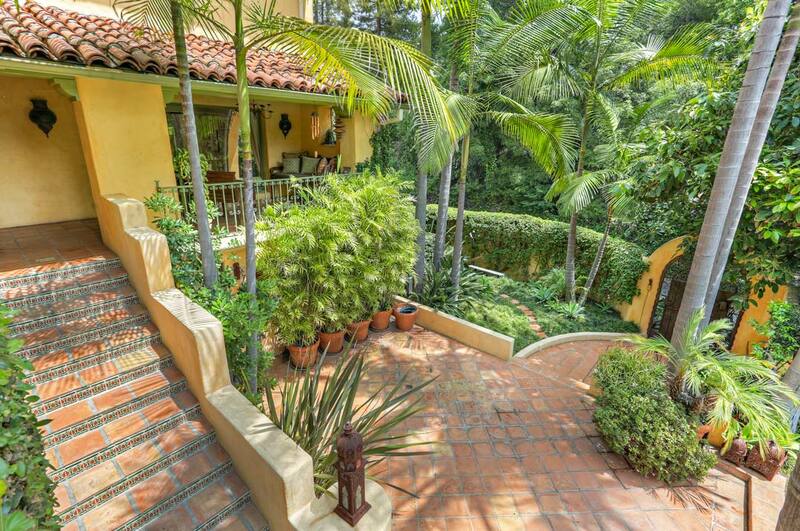 An exquisite, light-filled view home nestled in the Franklin Hills of Los Feliz. 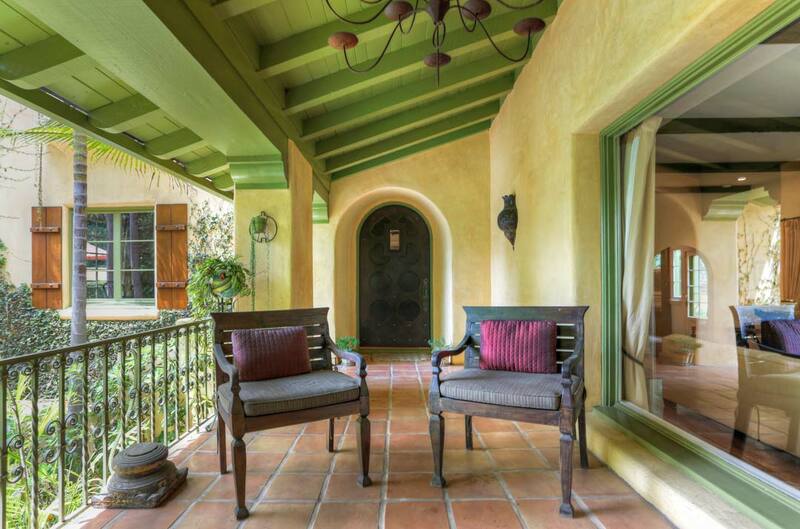 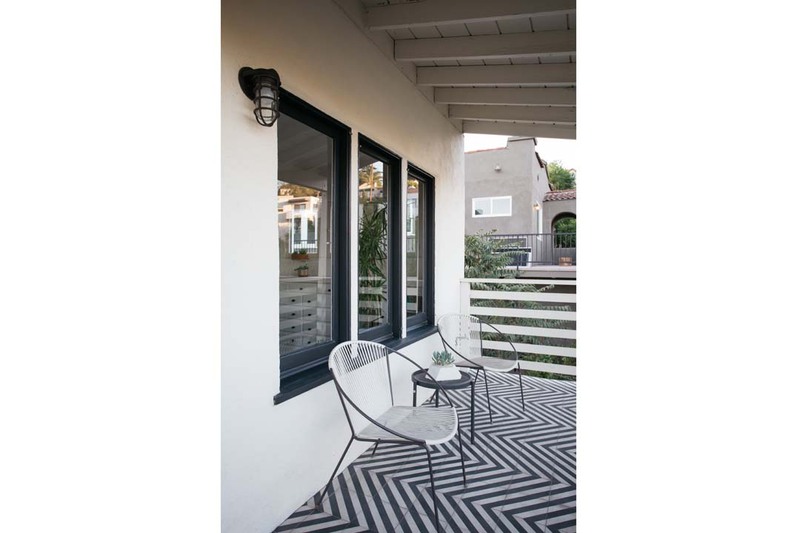 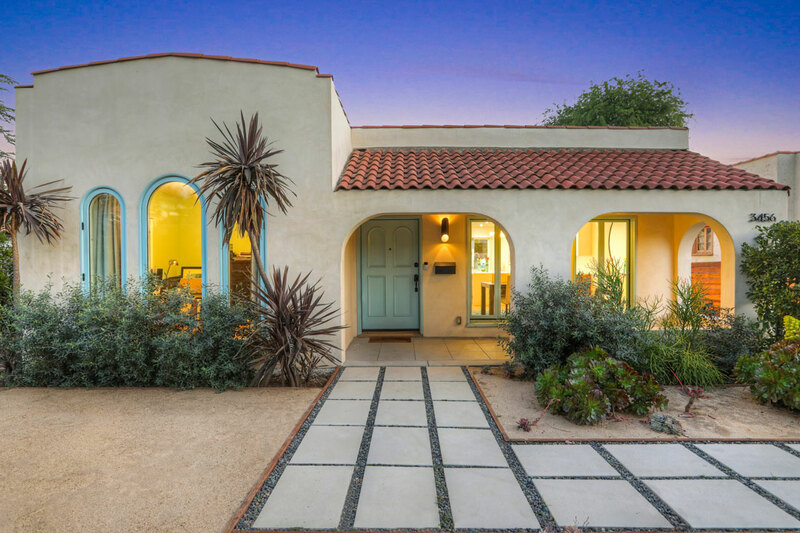 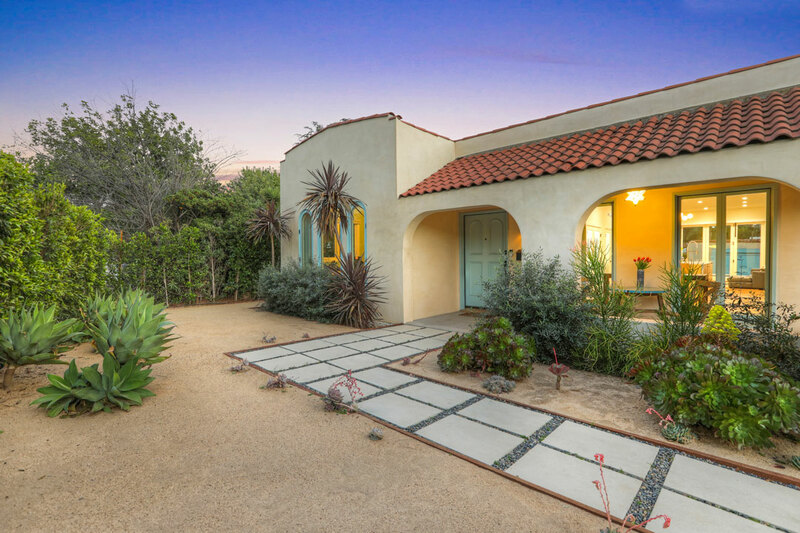 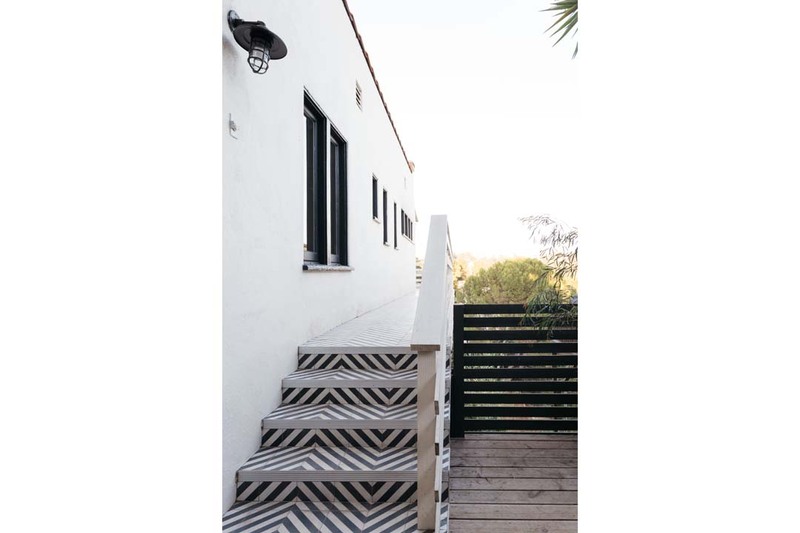 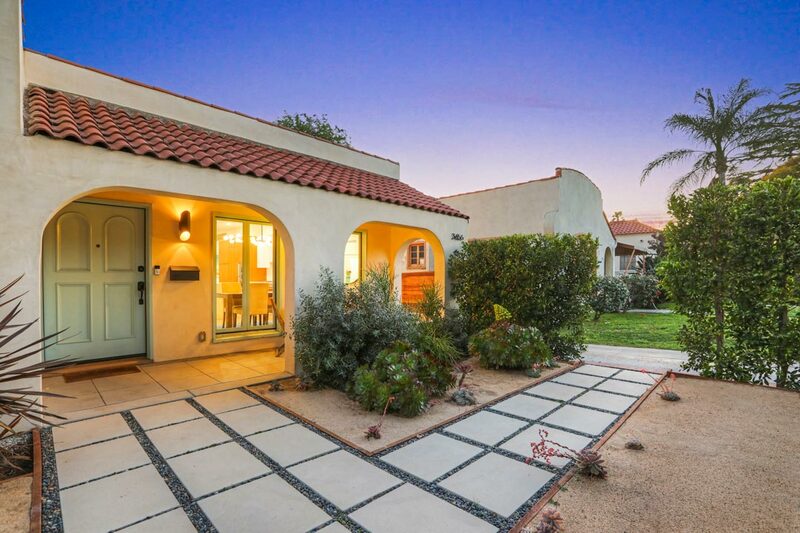 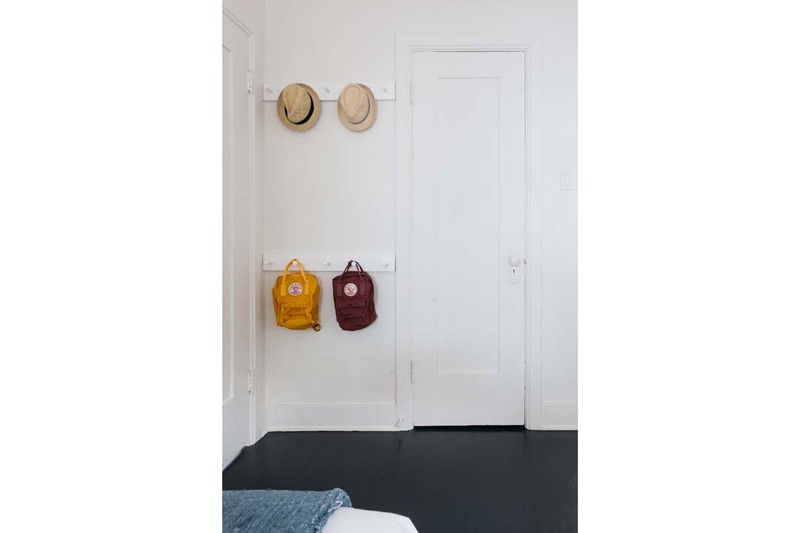 The Spanish-style bungalow circa 1925 has been painstakingly restored, its vintage elements harmonized with tasteful modern updates. 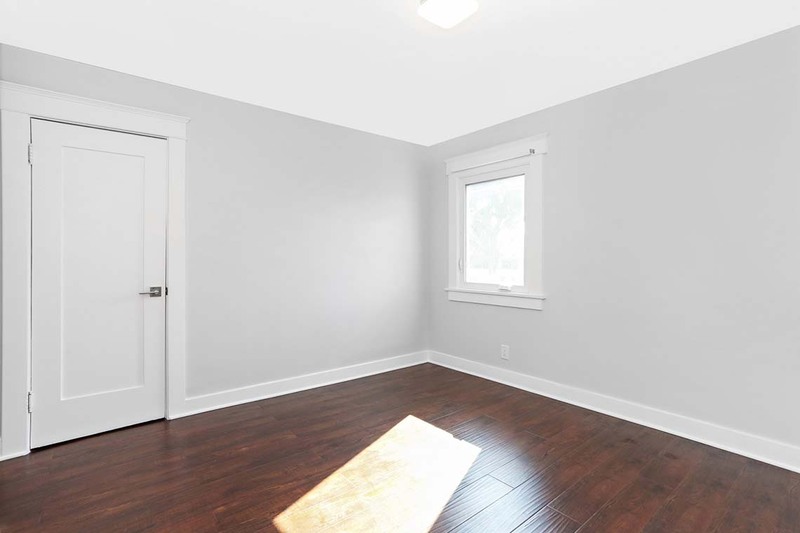 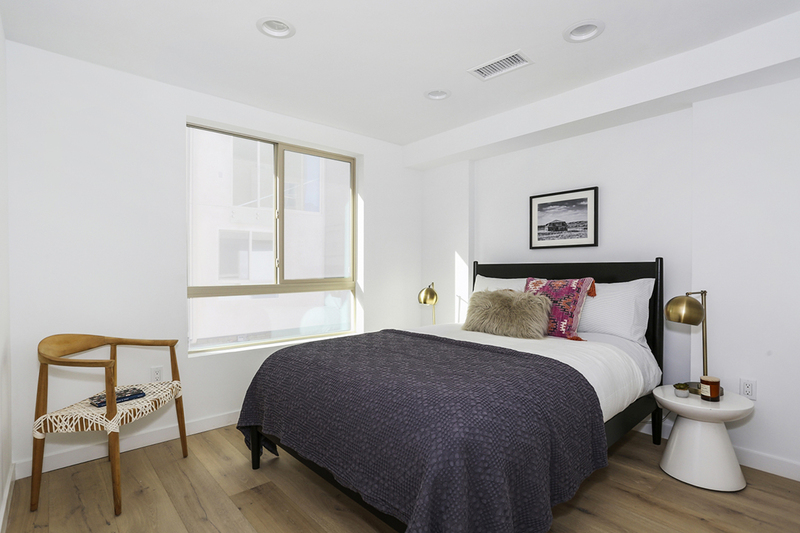 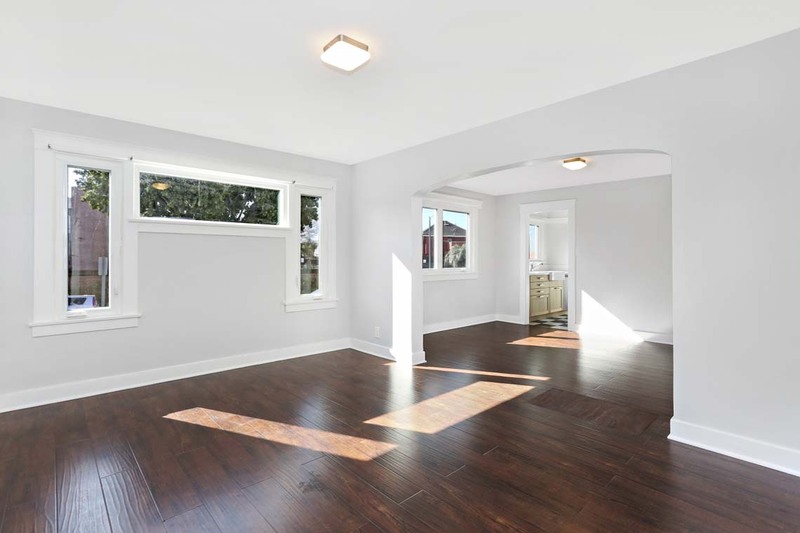 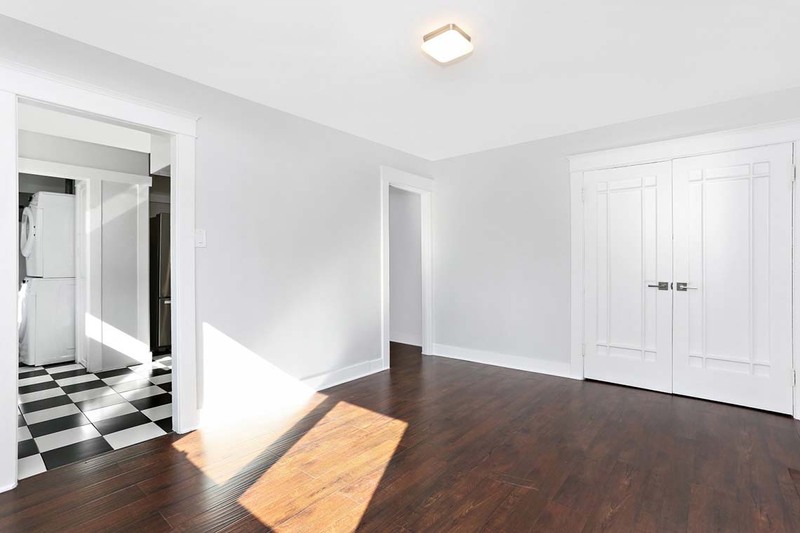 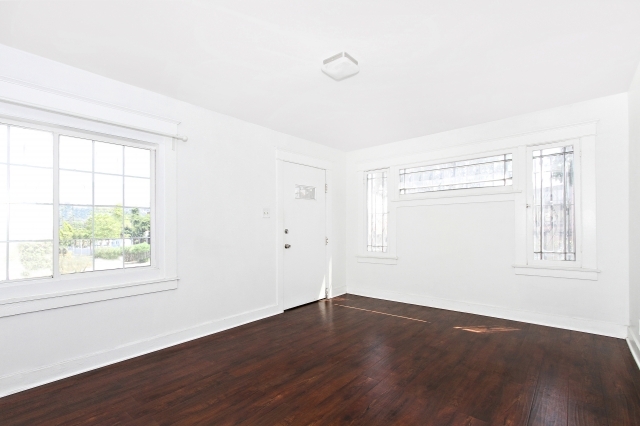 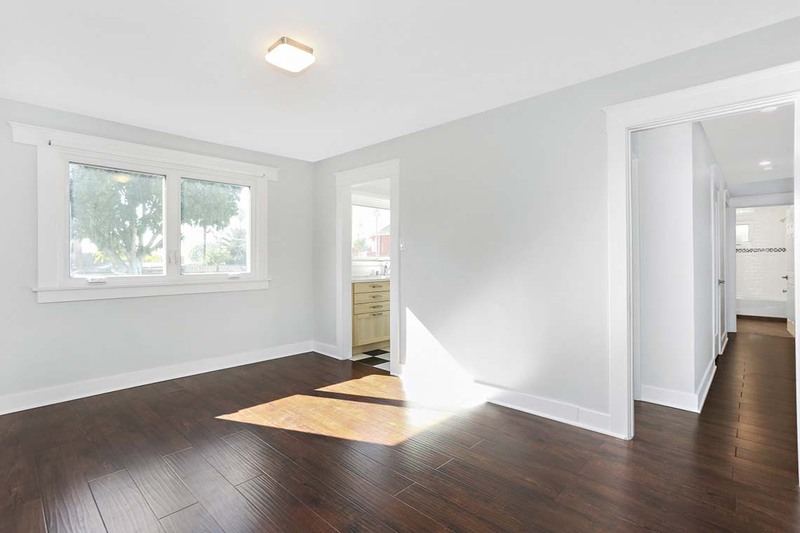 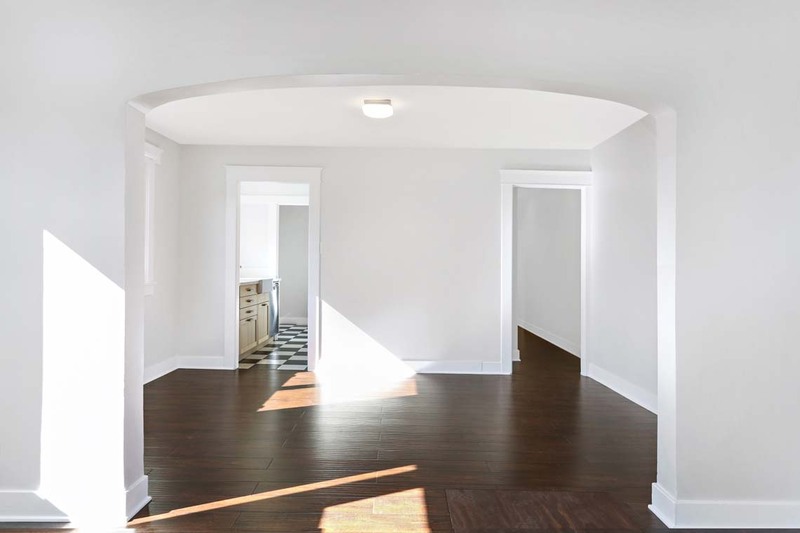 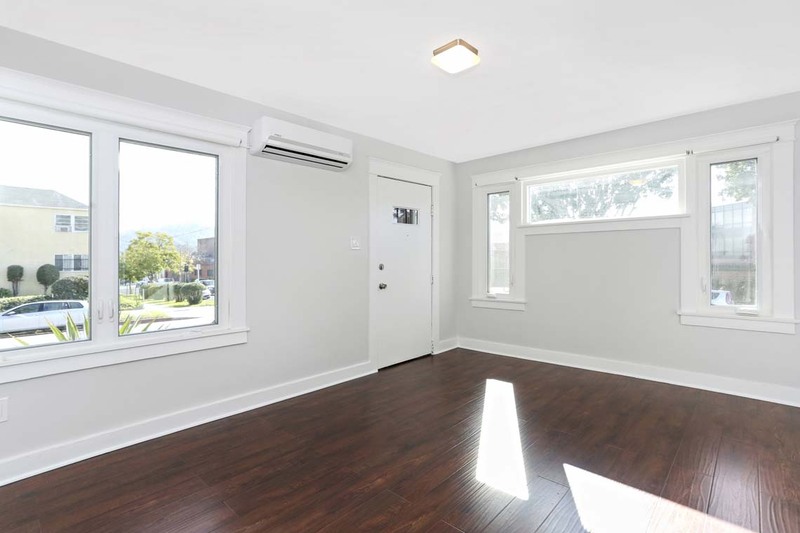 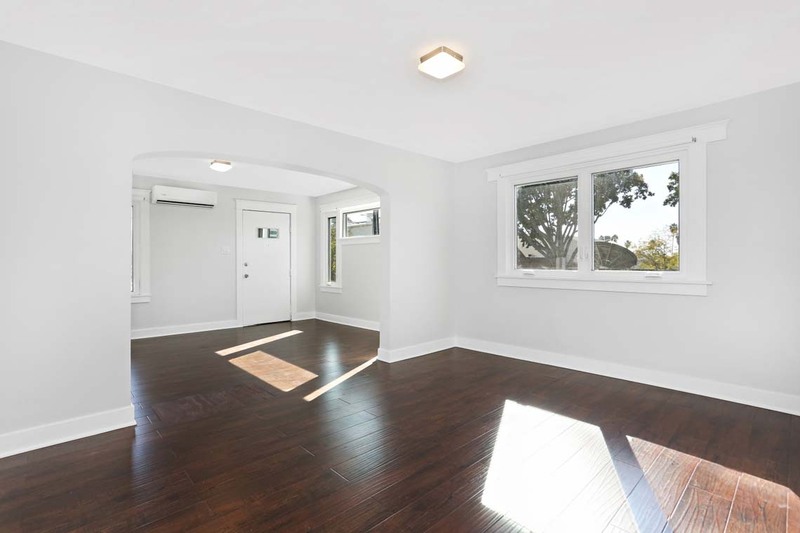 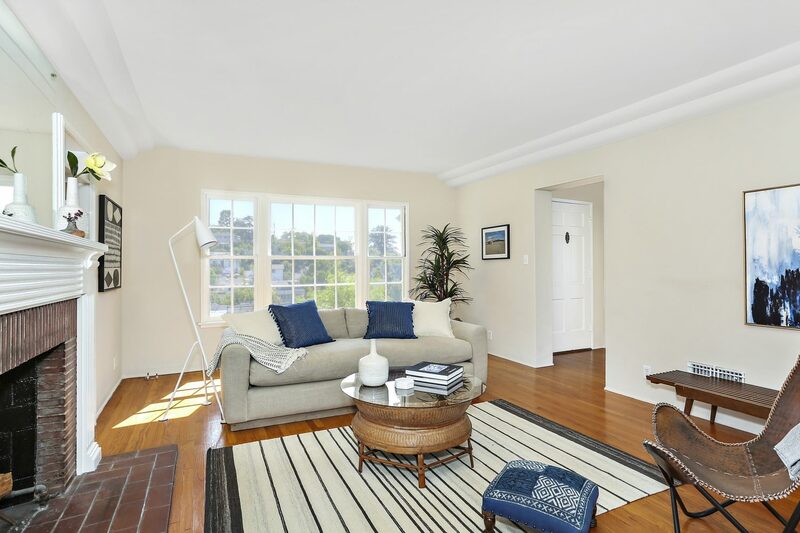 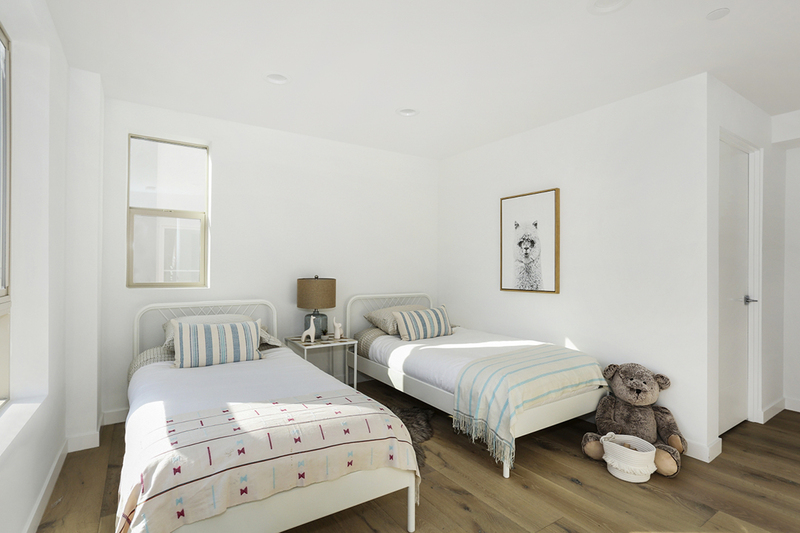 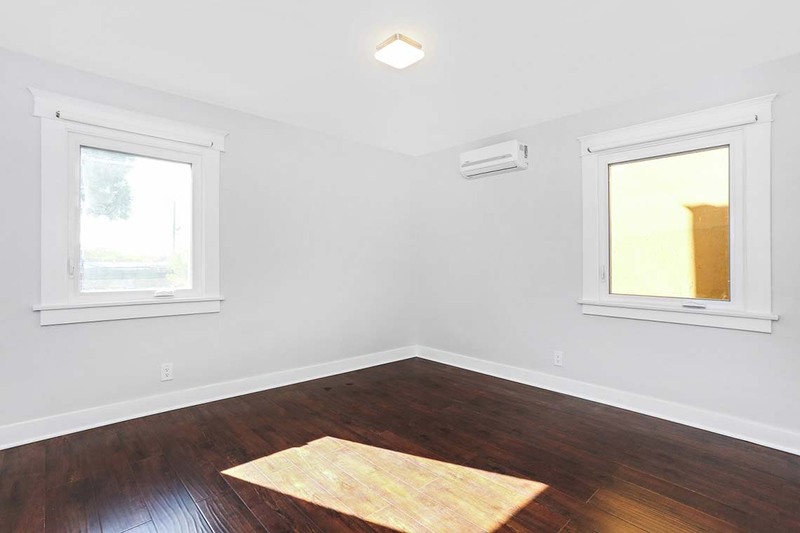 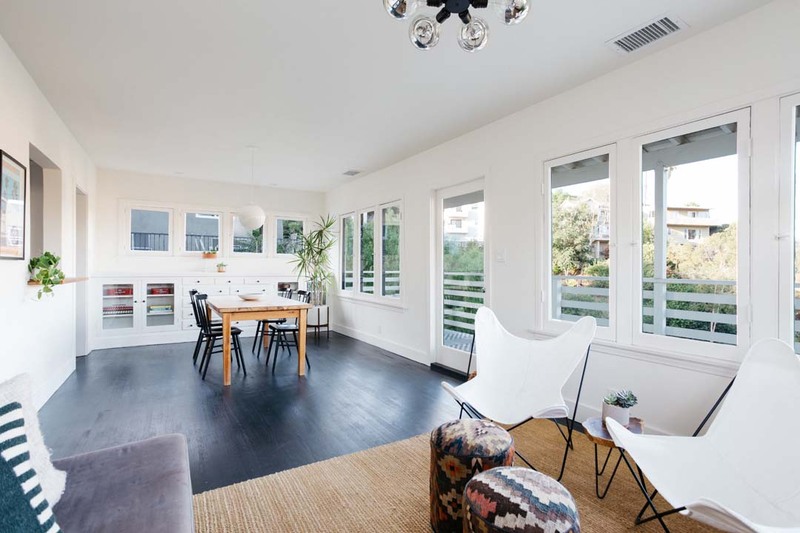 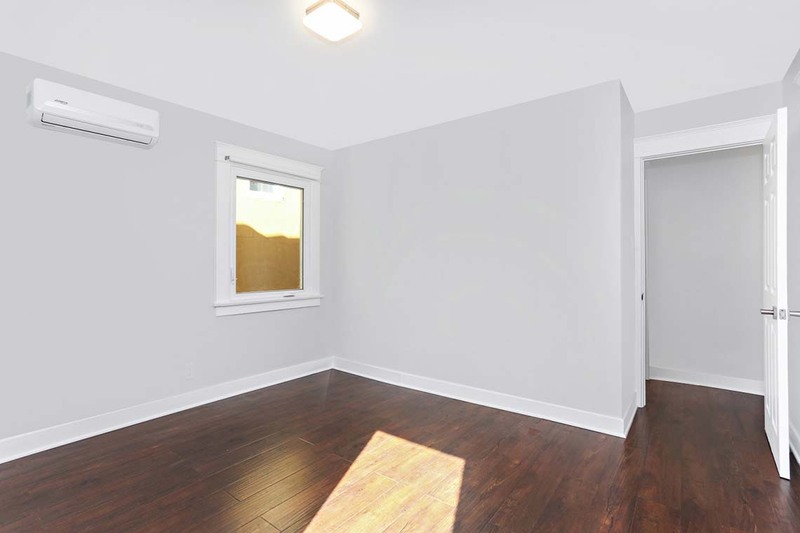 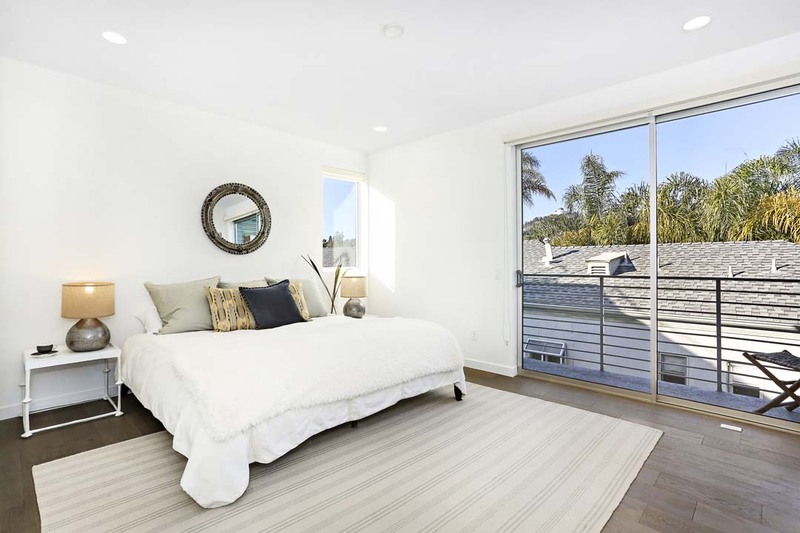 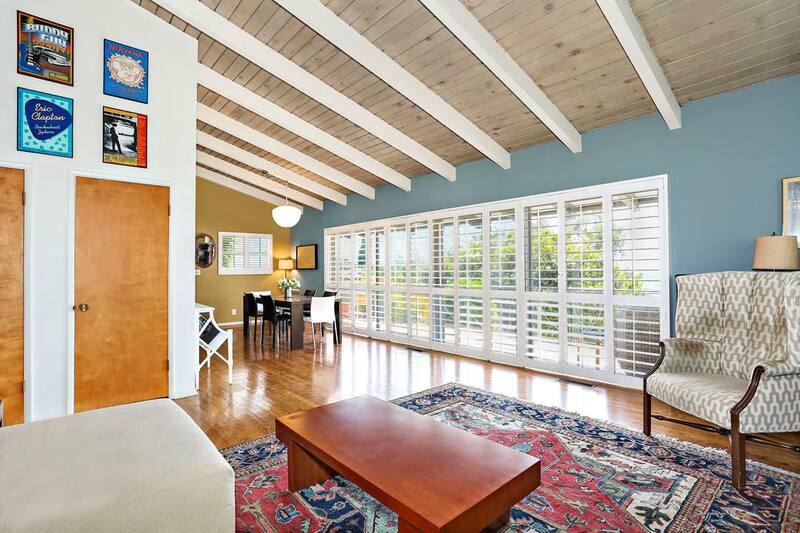 In the airy layout find an expanse of windows welcoming the sunshine, and beautiful wood flooring. 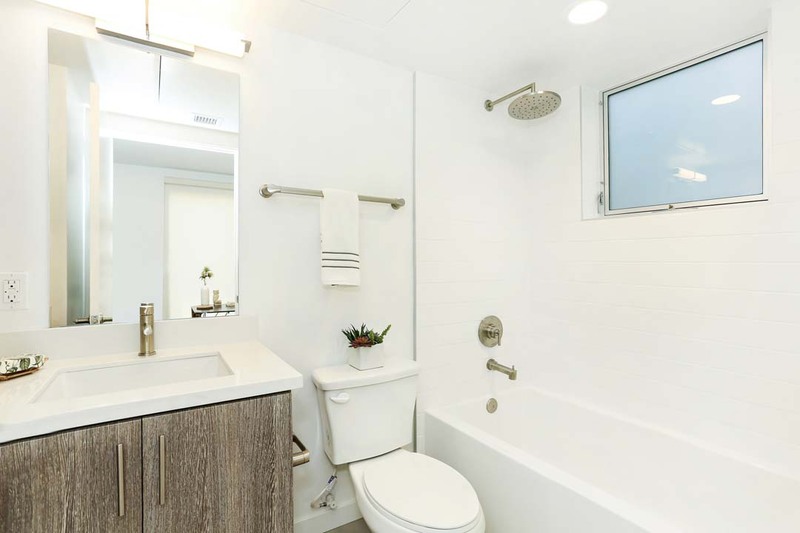 Premium finishes include designer fixtures by Duravit and Kallista, appliances by Miele and GE, hand-crafted clé cement tile and more. 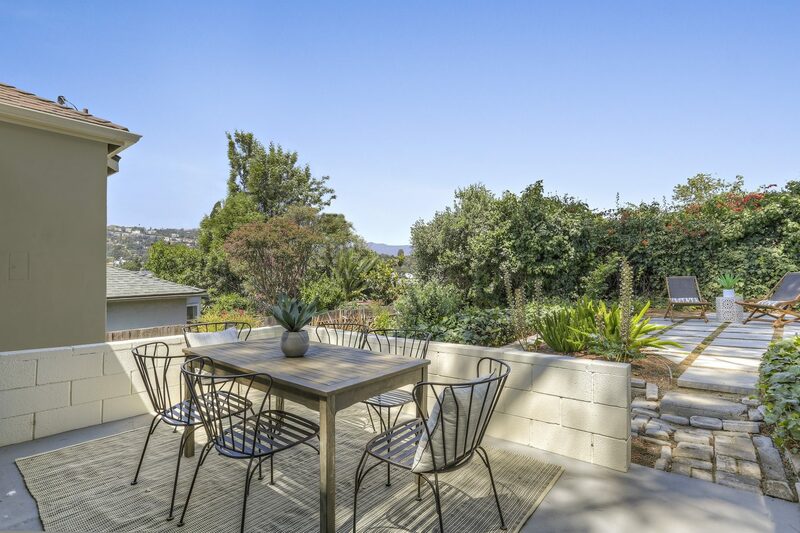 The wraparound deck floats above breathtaking vistas of Silver Lake hillsides; the shaded patio is your idyllic private retreat. 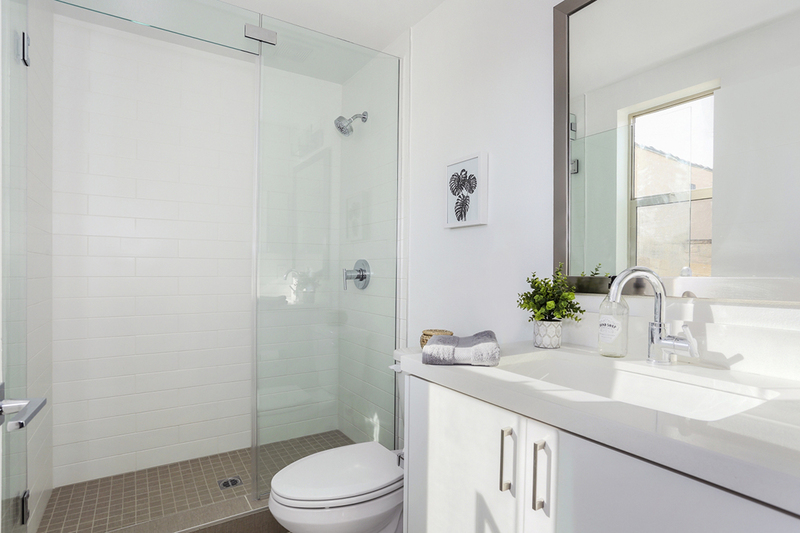 Among updated systems are electrical, plumbing, roof, foundation and central a/c with Nest thermostat. 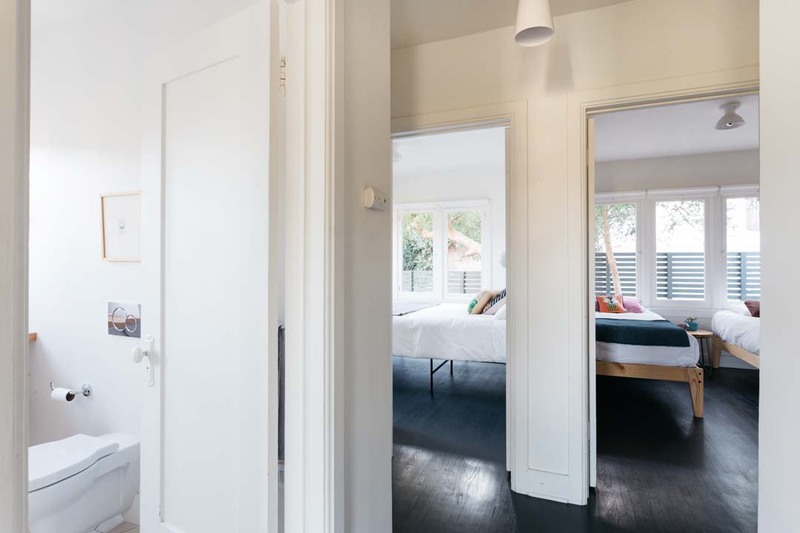 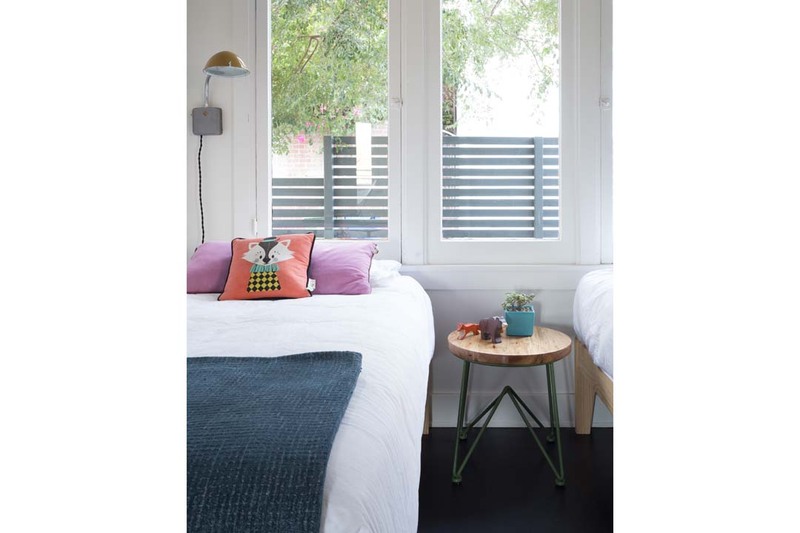 Included are architectural drawings for expansion by Graham Ferrier Architects. 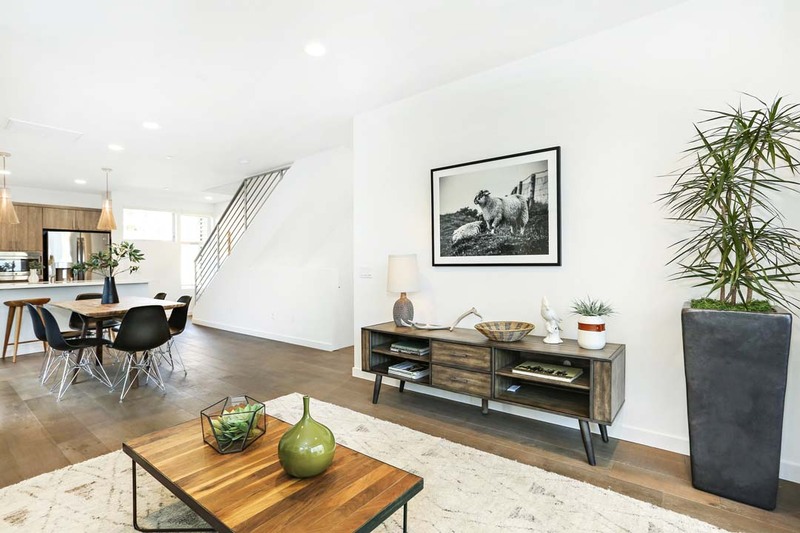 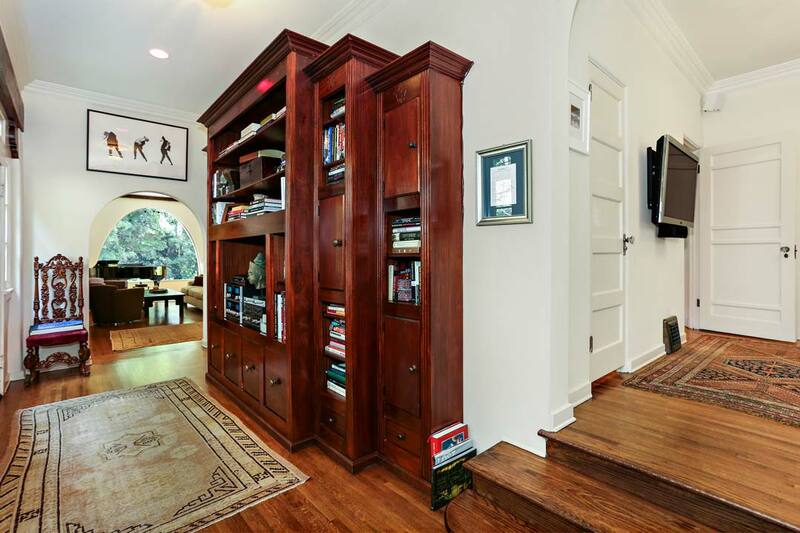 This ideal location in the coveted Franklin Elementary school district puts you near local favorites Speranza, Maré, Hyperion Public and Trader Joe’s. 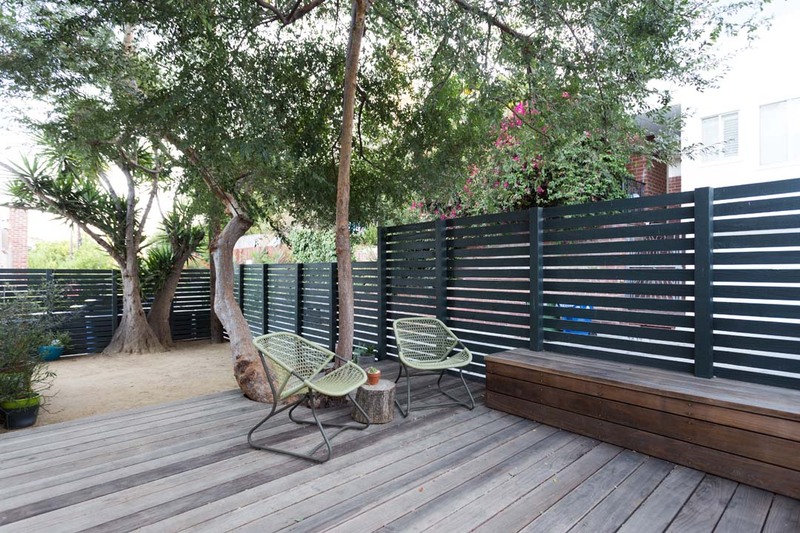 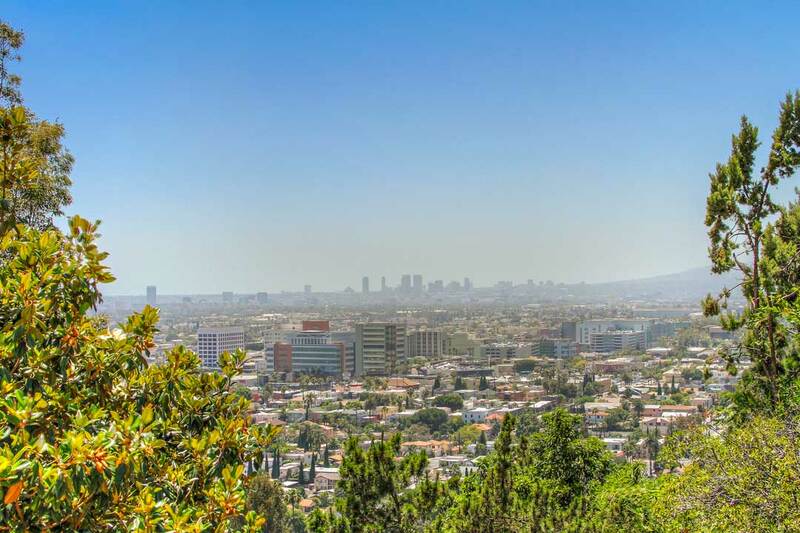 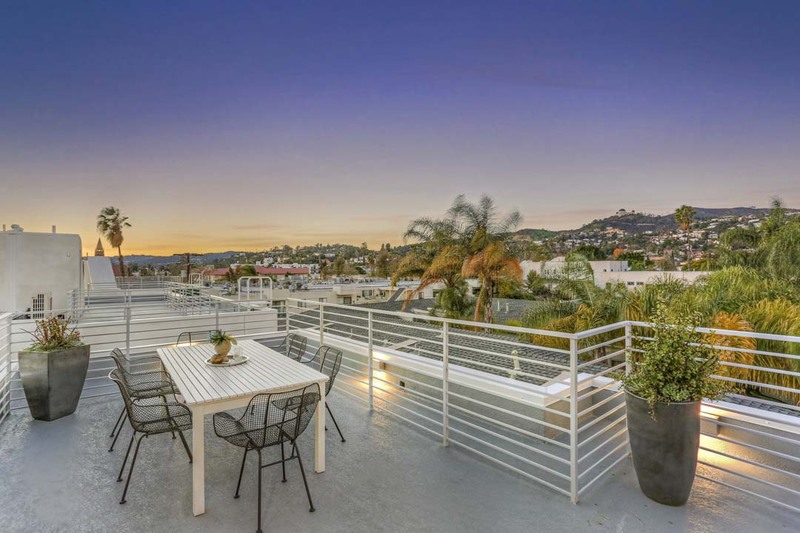 The Silver Lake Reservoir, Sunset Junction and Los Feliz Village are within easy reach. 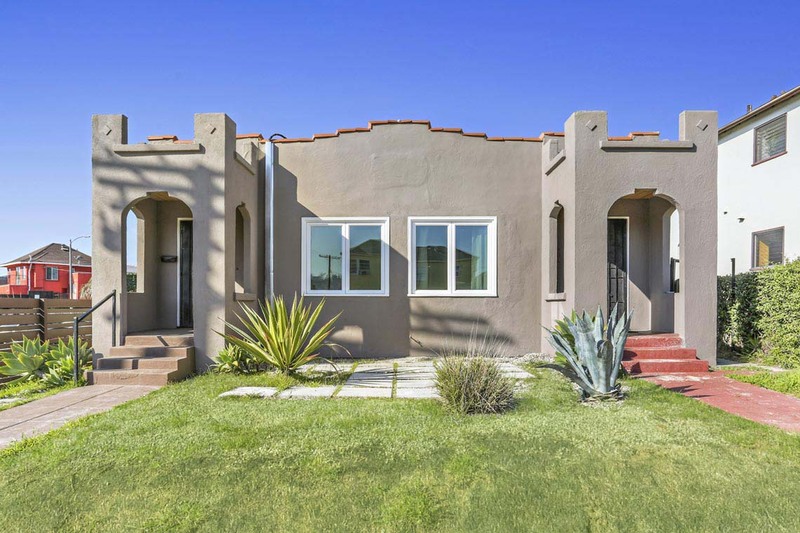 A statement home and glorious vestige of Old World LA. 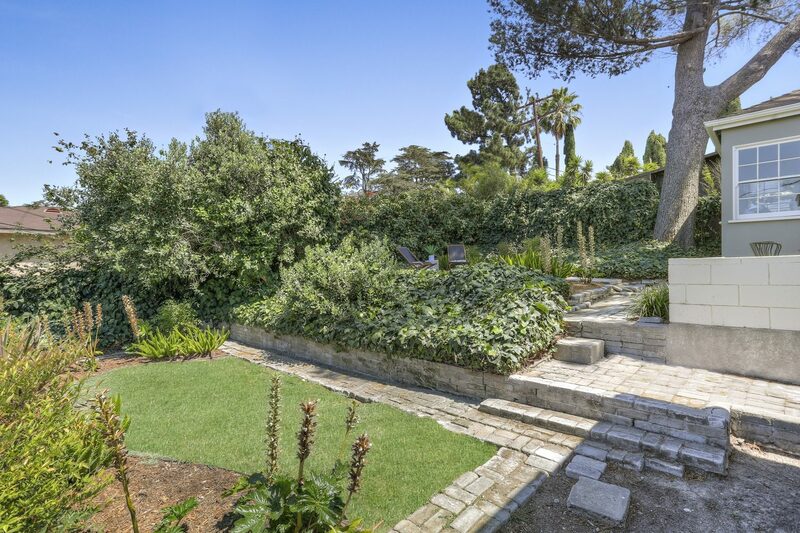 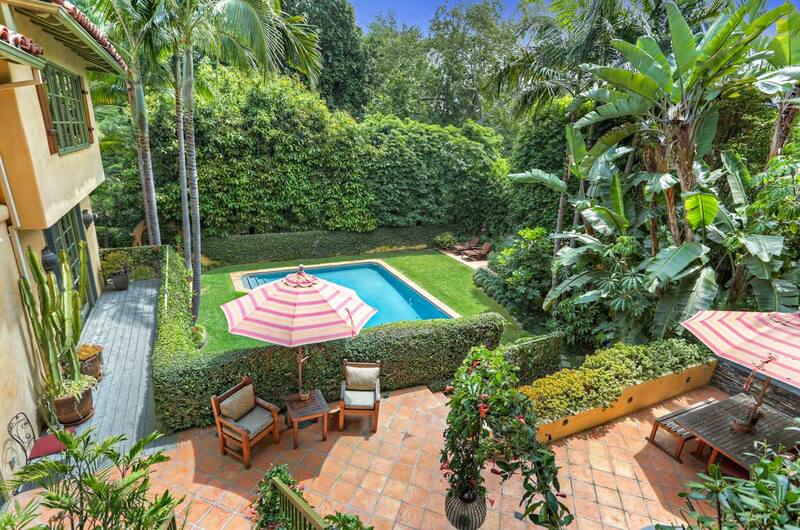 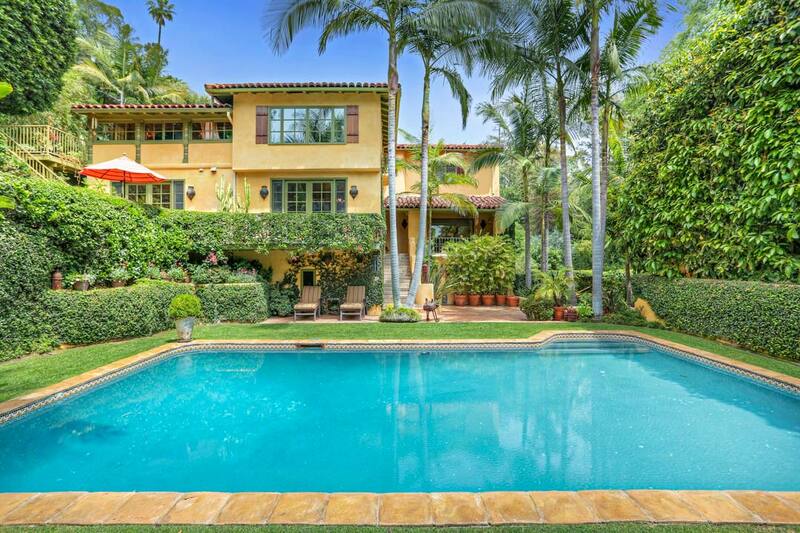 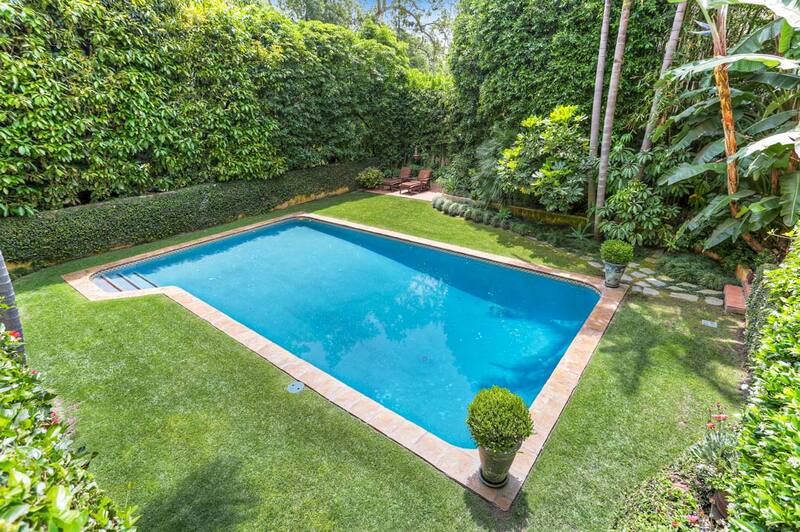 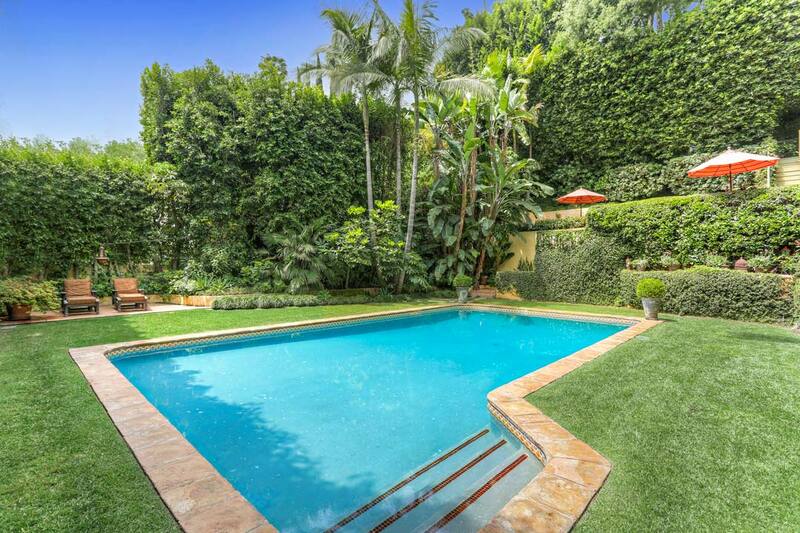 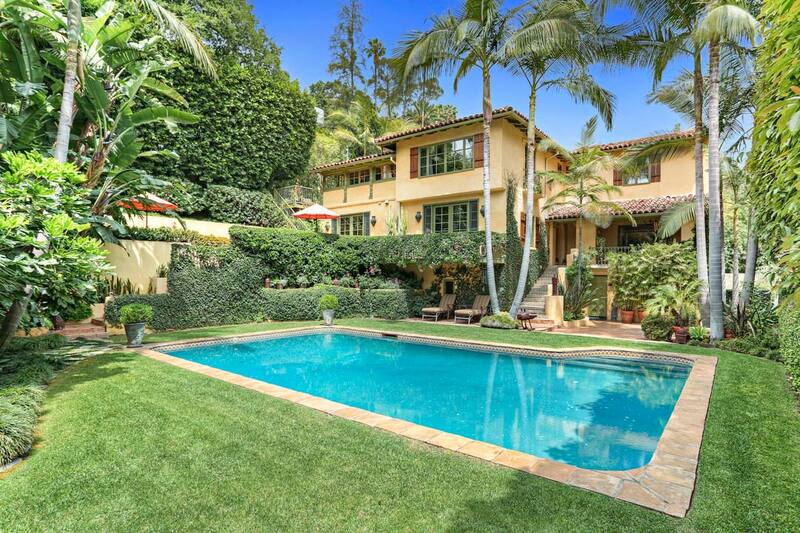 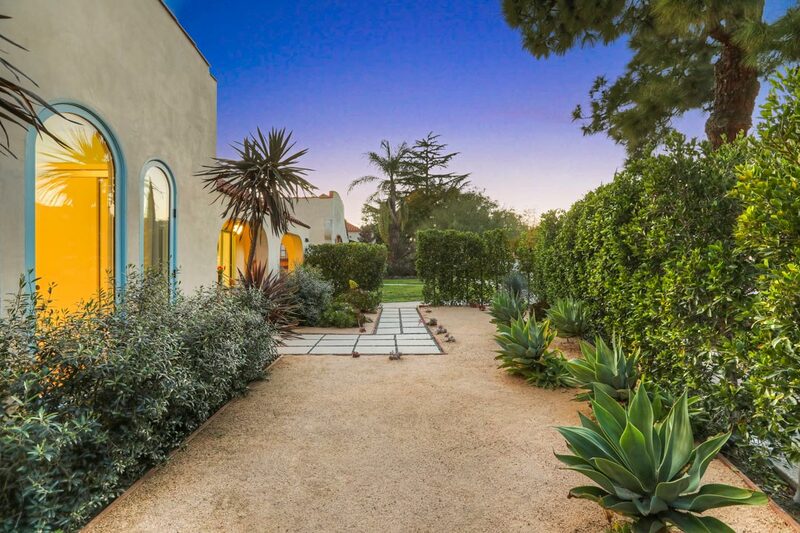 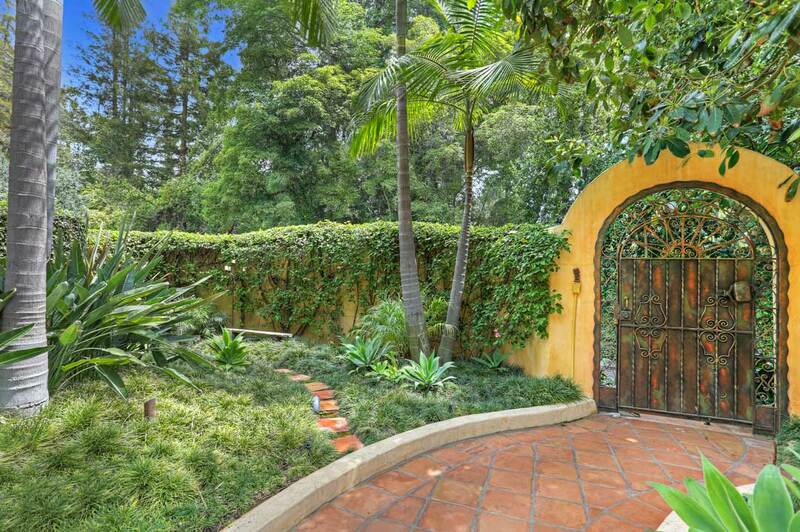 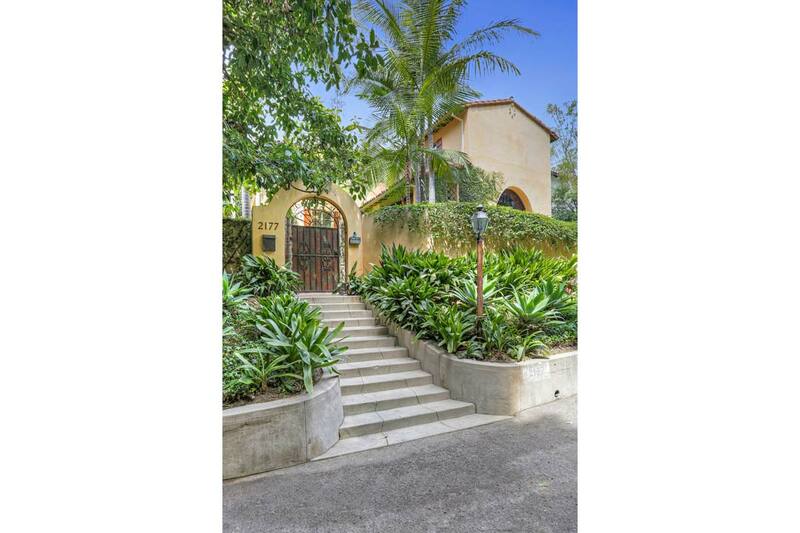 This stunning Mediterranean compound in the coveted Oaks neighborhood of Los Feliz is tucked away from the city yet close to it, a private haven exuding the romanticism and glamor of Hollywood’s Silent Era. 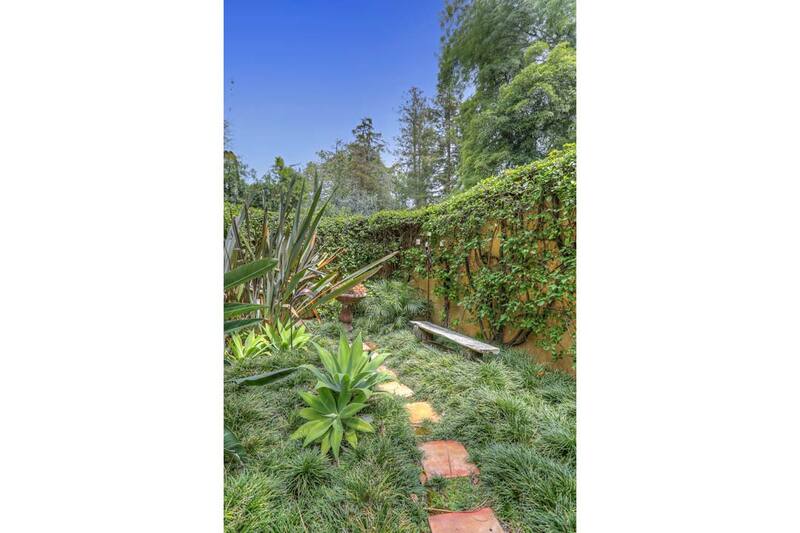 Lush with colorful flora and mature trees, the sprawling urban retreat on nearly 1/3 of an acre is surrounded by walls, providing a sense of seclusion and tranquility. 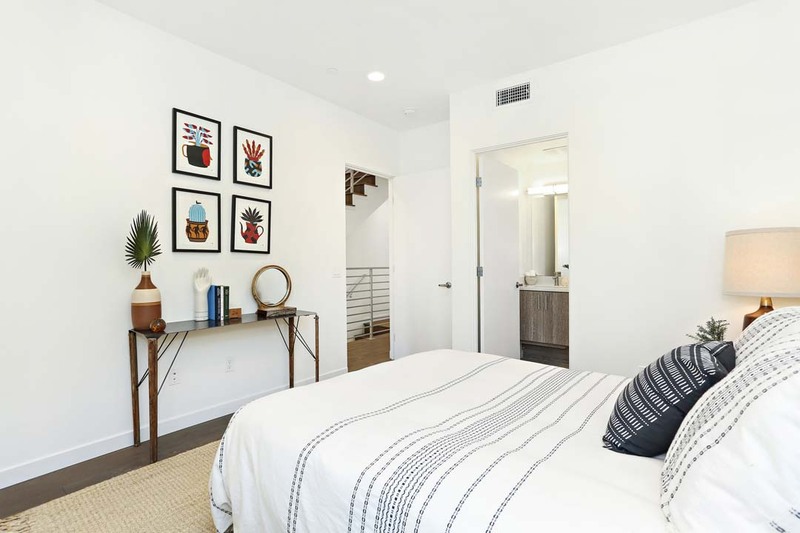 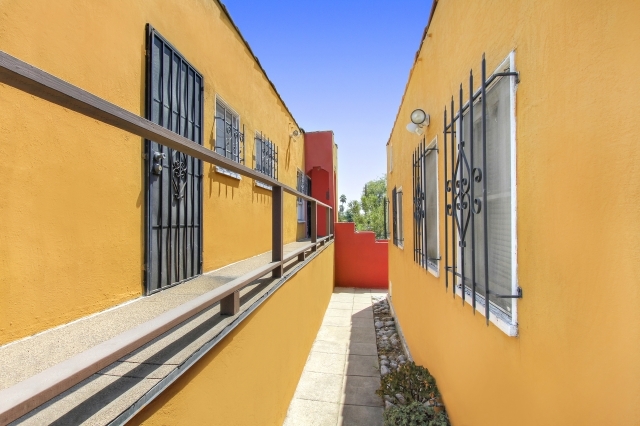 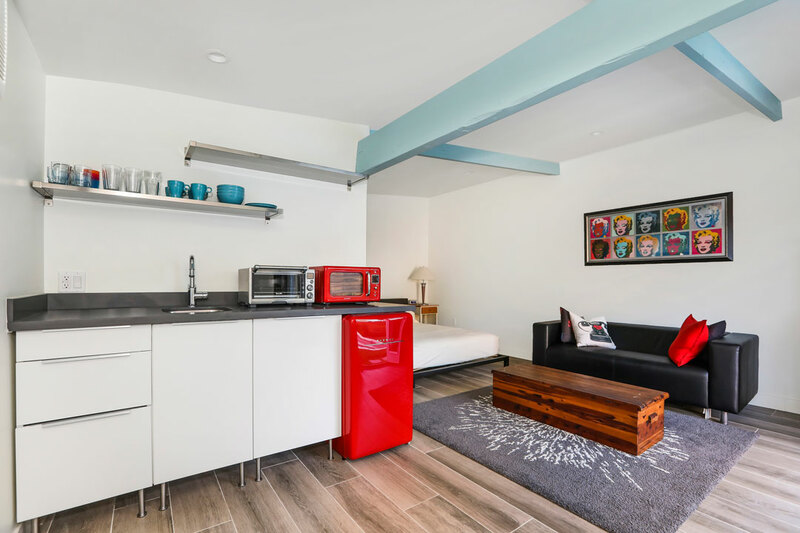 Remarkably, it is only blocks away from the convenience of shopping, dining and nightlife in nearby Los Feliz Village and Hollywood. 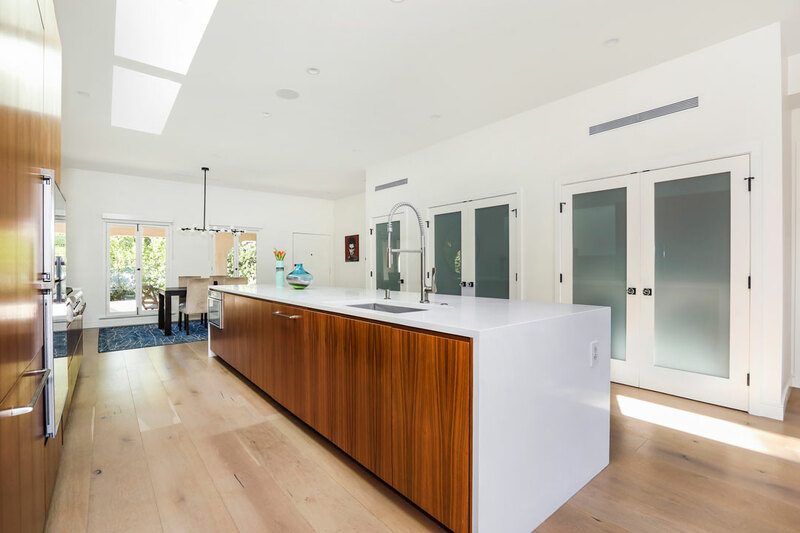 The graceful residence is located on a quiet street under a mature canopy of trees. 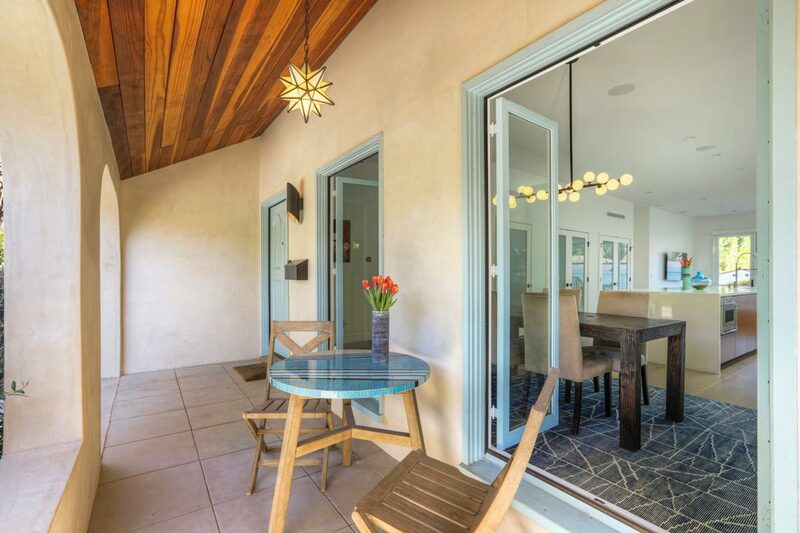 Enter through an arched gate to find palms, pathways and limitless options to relax and entertain; luxuriate by the sparkling pool, dine al-fresco on the terrace or drift to one of several patio areas to read and unwind. 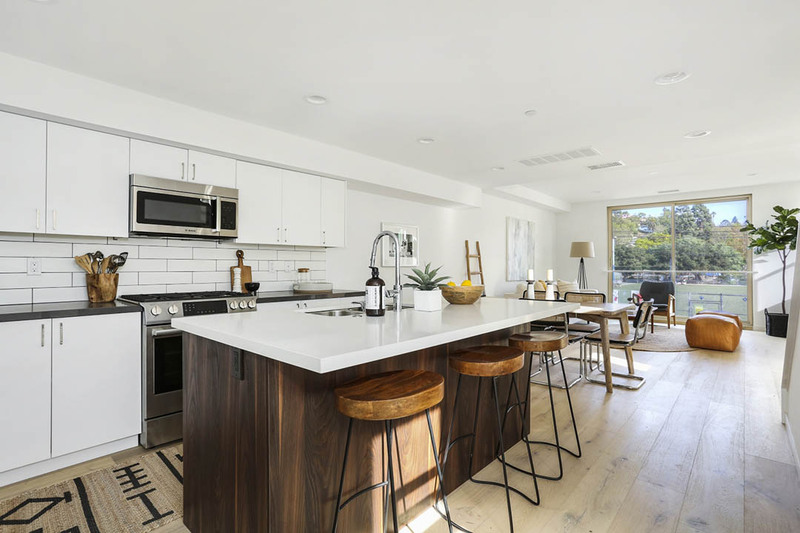 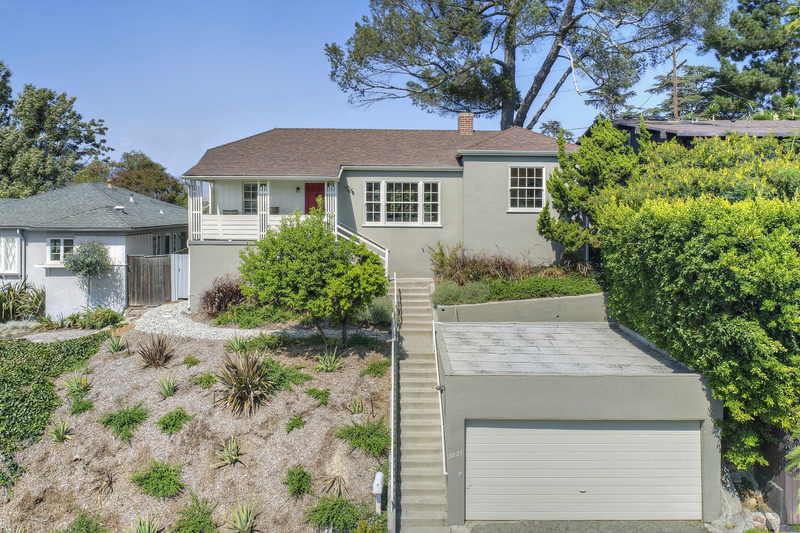 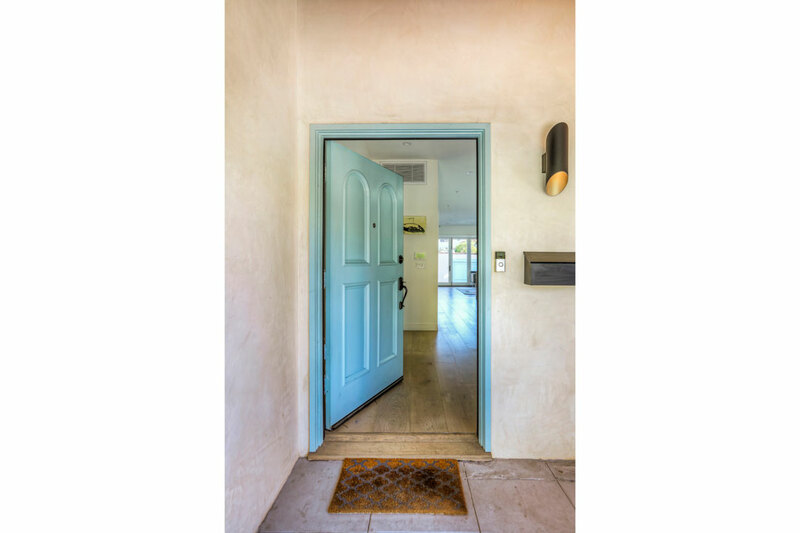 Inside find a light-filled two level home with over 4,000 square feet of living space that has been exquisitely rendered, tastefully updated and meticulously maintained. 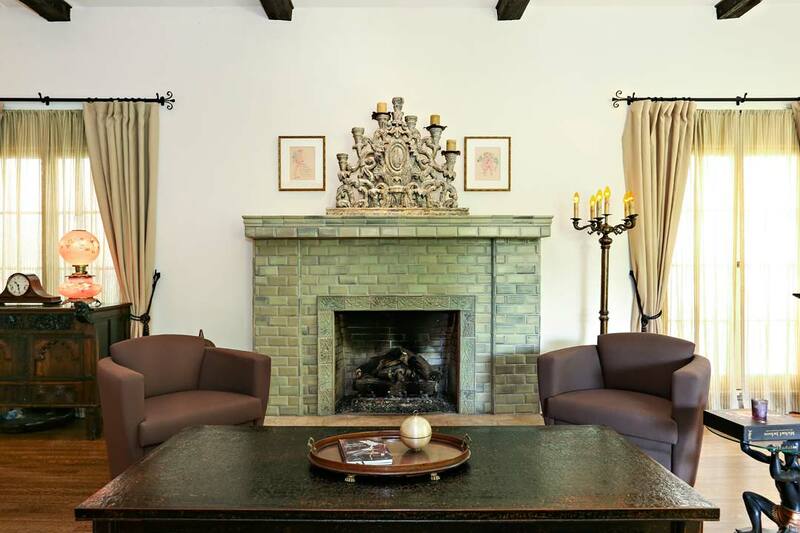 The centerpiece is the living room with floor-to-ceiling arched windows, exposed beams, a stunning tile hearth and gorgeous oak floors. 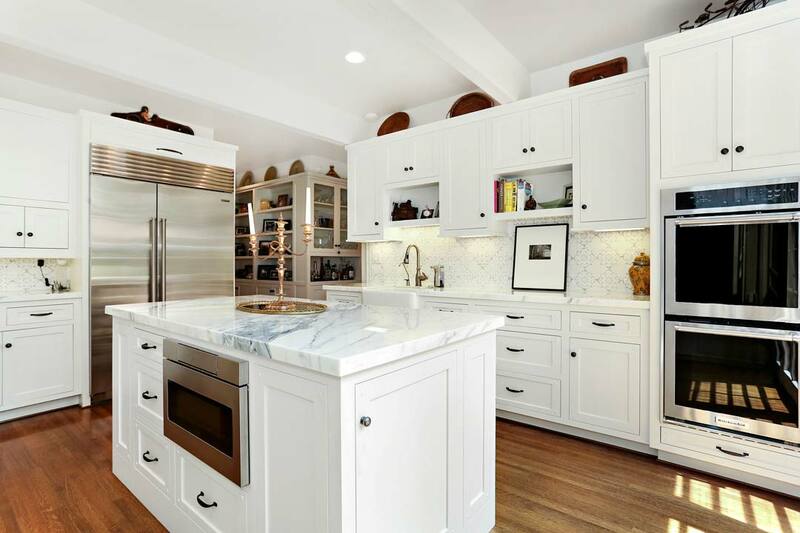 There is formal dining and a luminous white kitchen featuring a marble center island, hand-painted Italian tile backsplash and an appliance suite that includes a double wall oven, Subzero fridge and Viking range. 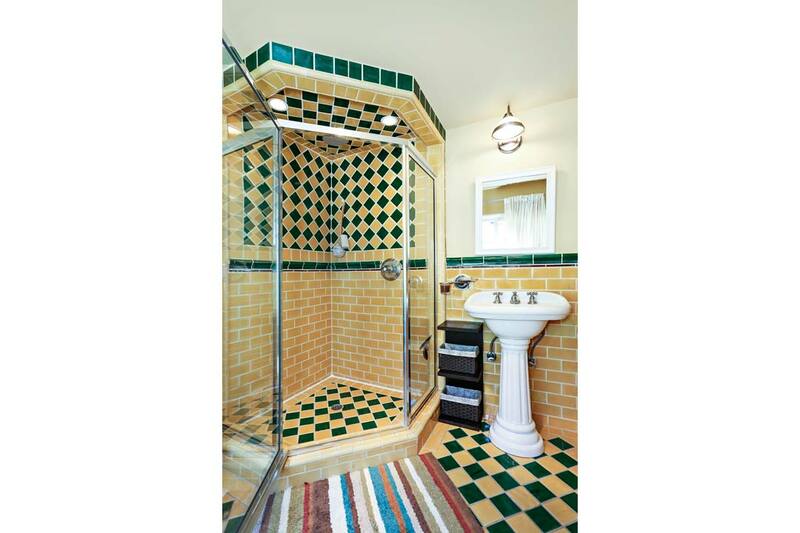 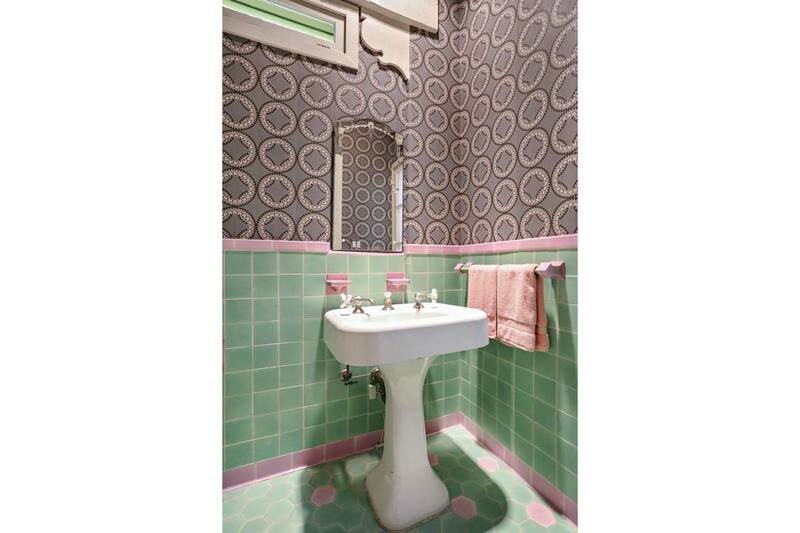 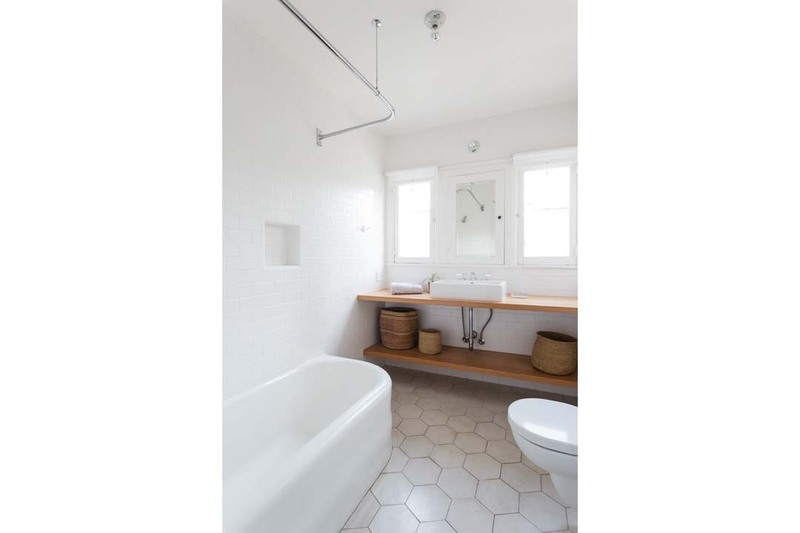 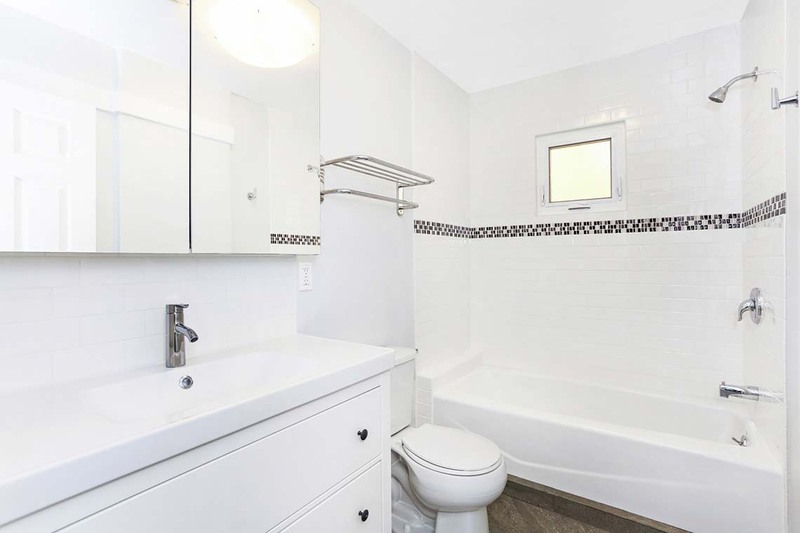 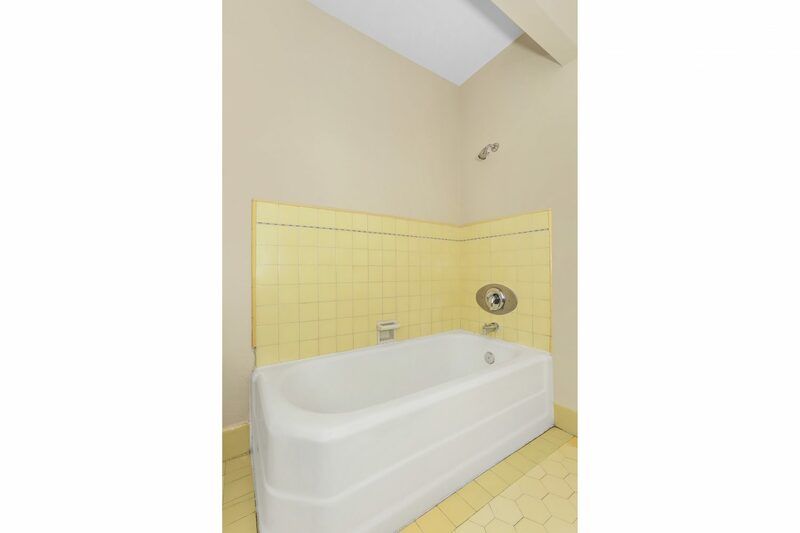 Upstairs bedrooms include the spacious Master, and in the Master bathroom there’s a large shower and clawfoot tub. 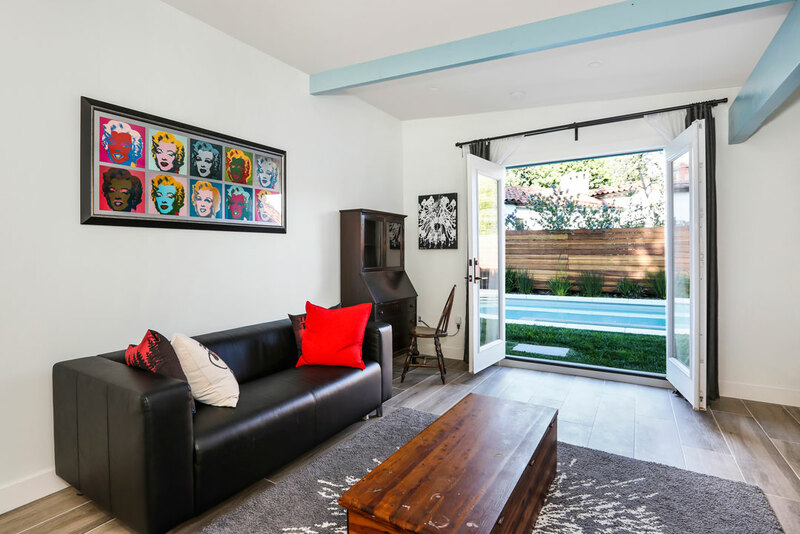 Choice amenities are found in the screening room, wine cellar, pool room, steam room and a concealed, professionally designed sound system. 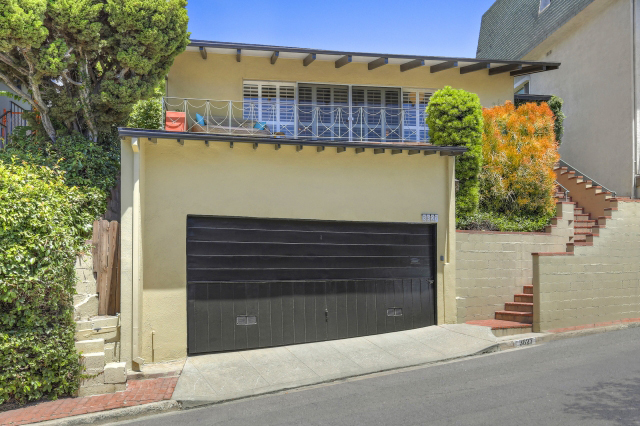 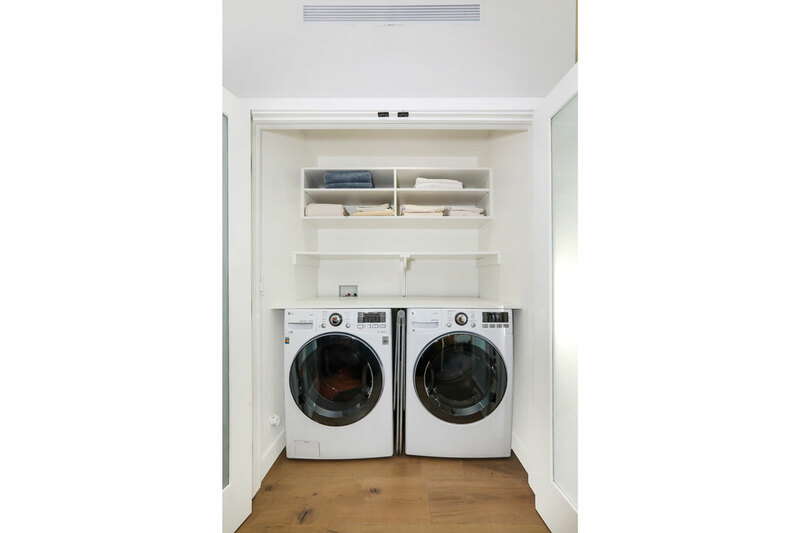 The attached two-car garage provides direct access to and from the home. 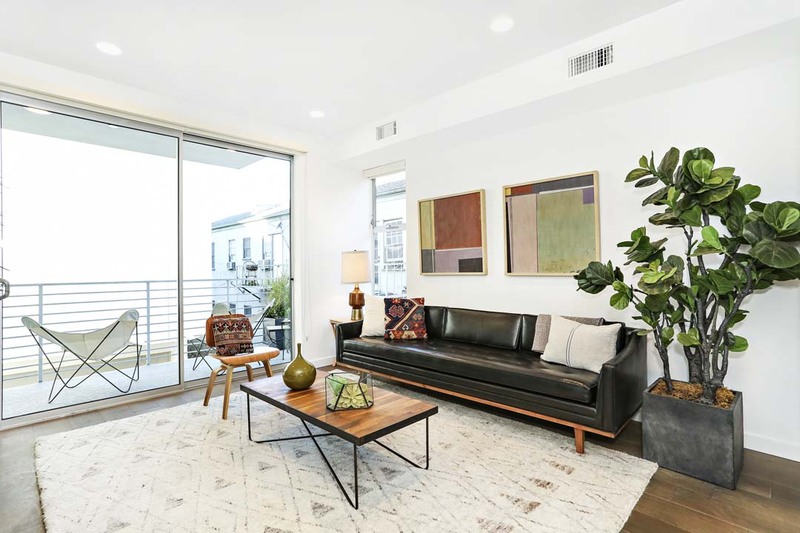 This ideal location puts you near trendy Franklin Village offerings including The Oaks Gourmet and La Poubelle, along with Los Feliz Village hot spots Little Dom’s, Alcove and more. 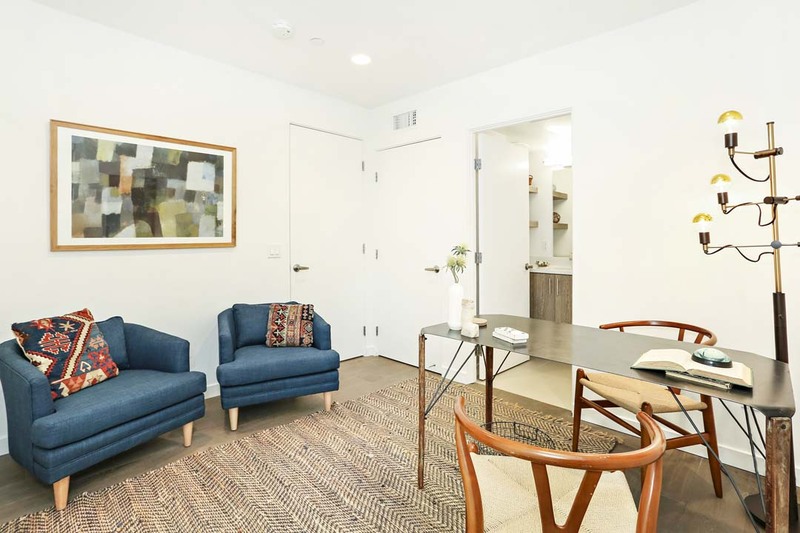 You are at the very doorstep of Griffith Park and enjoy commuter-friendly proximity to workplace hubs in Hollywood, Burbank, Studio City and Downtown LA. 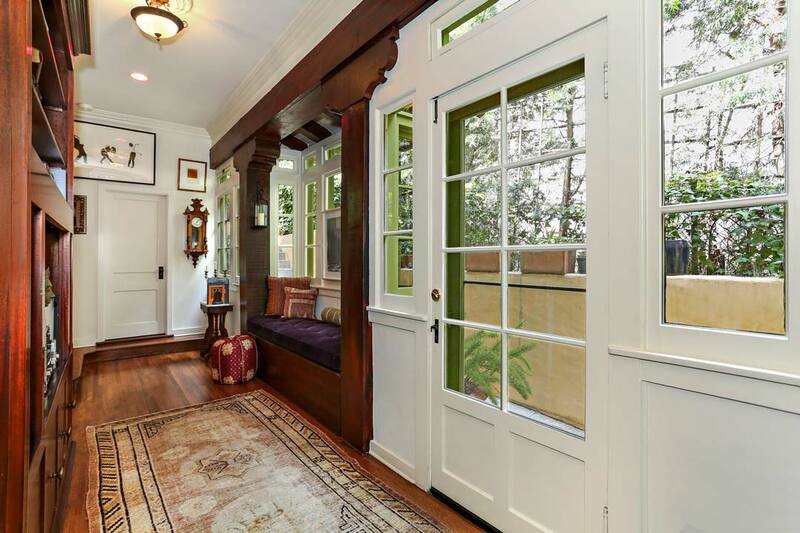 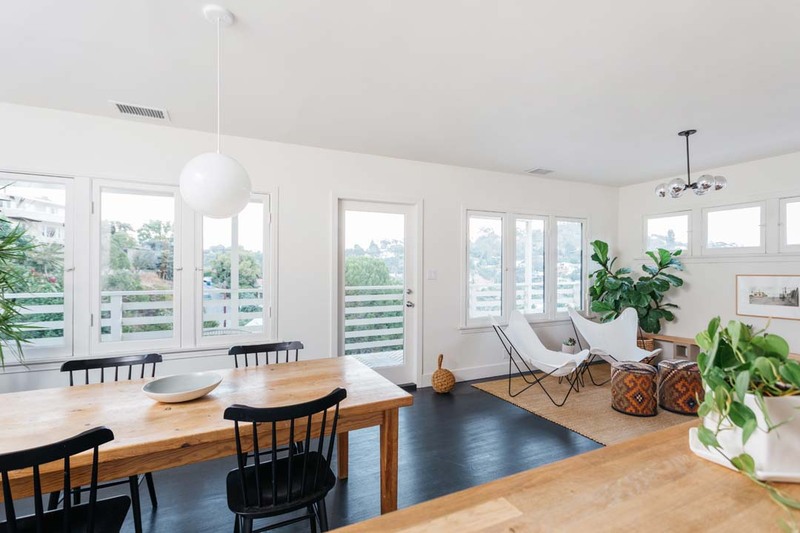 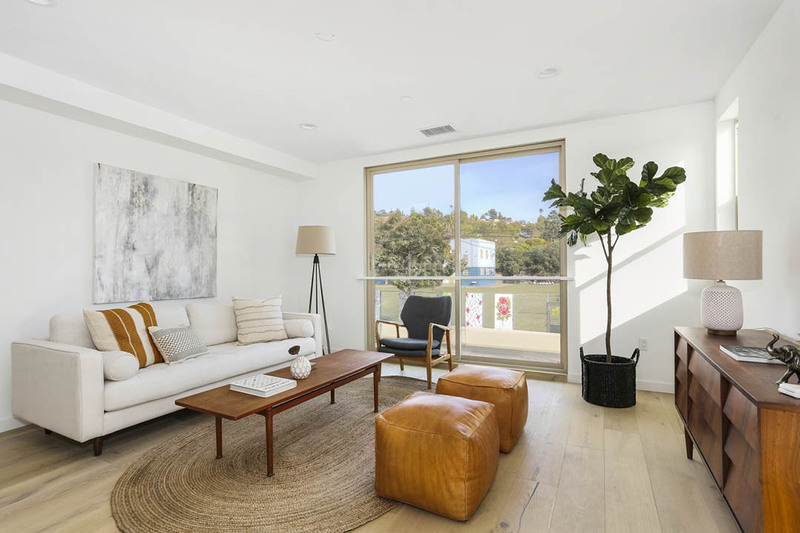 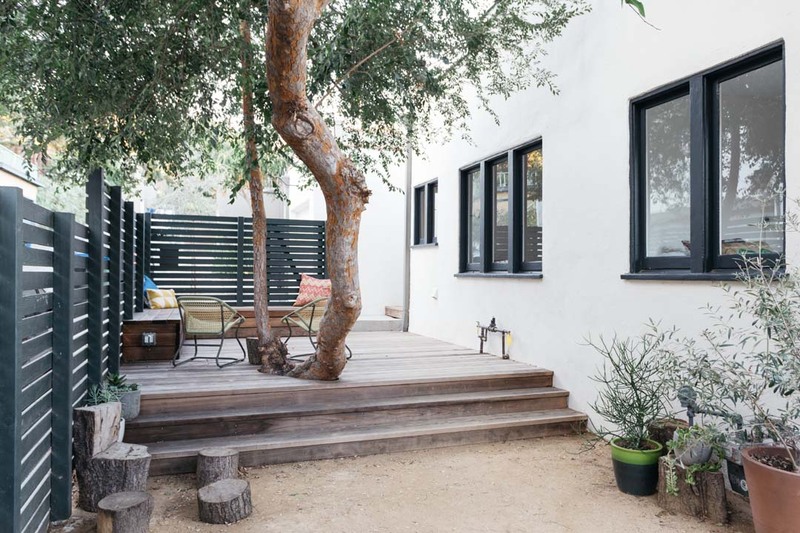 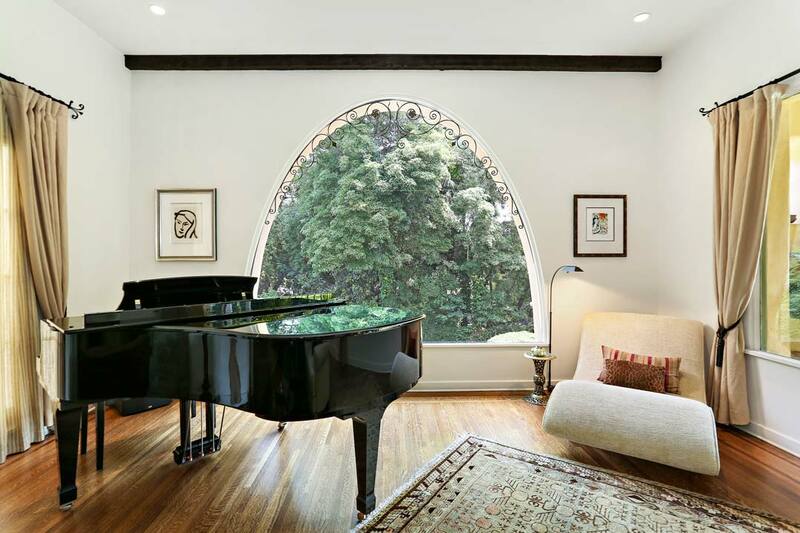 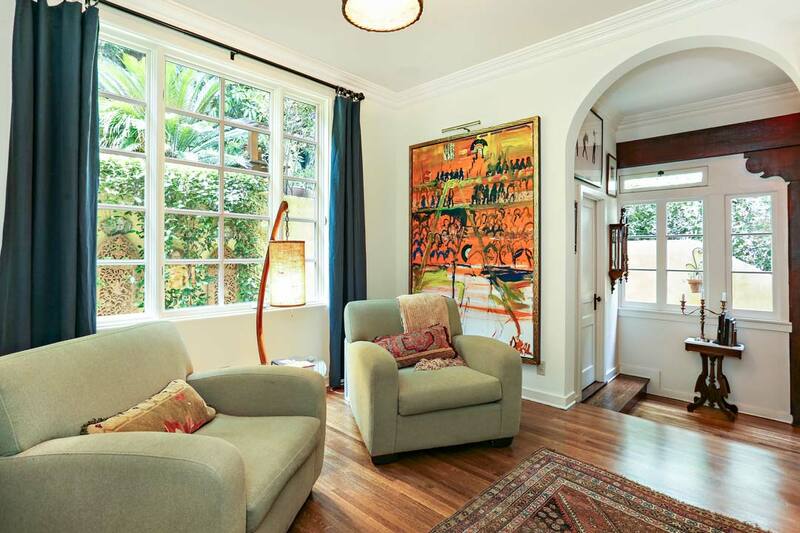 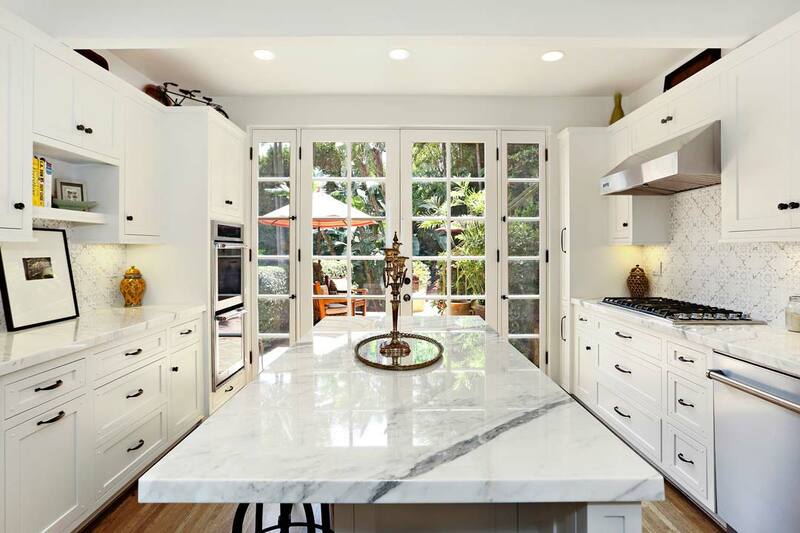 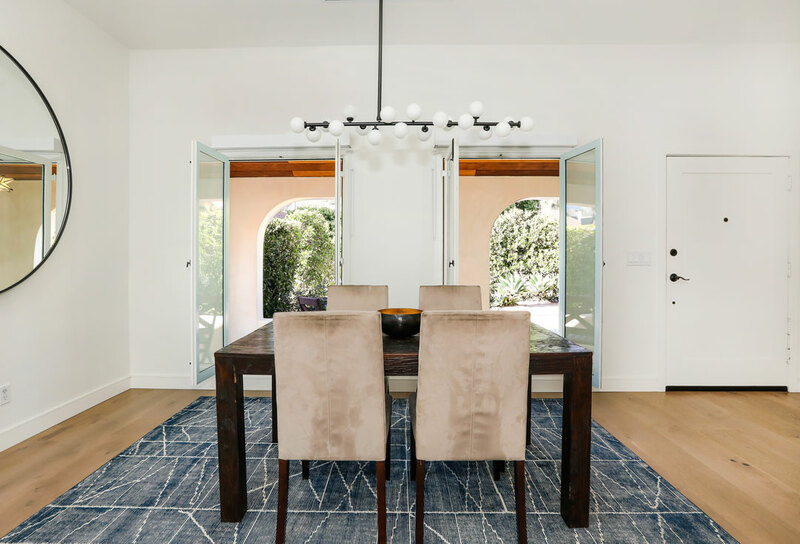 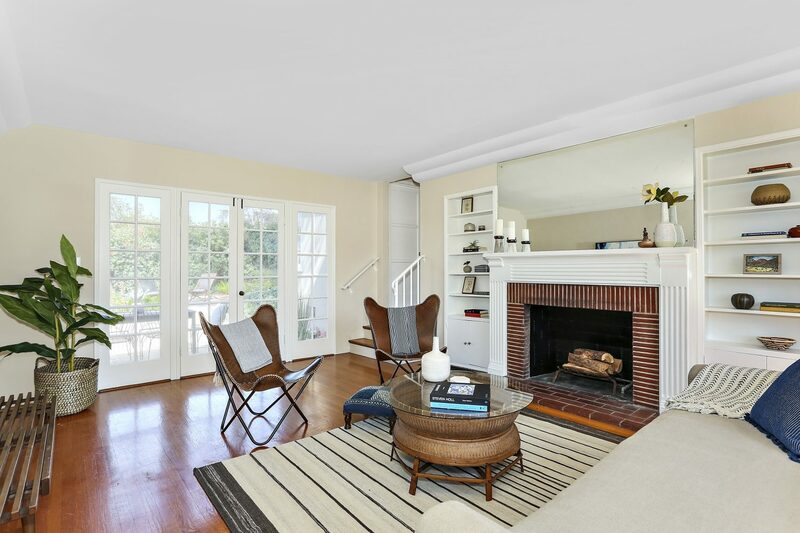 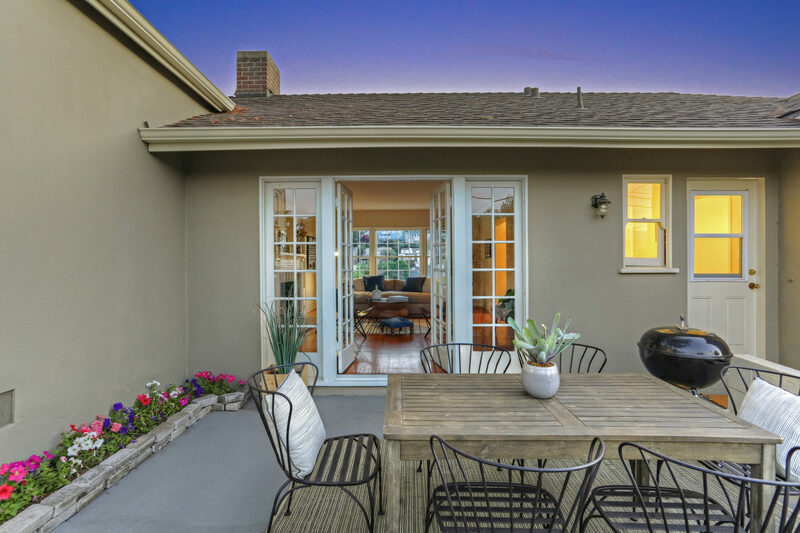 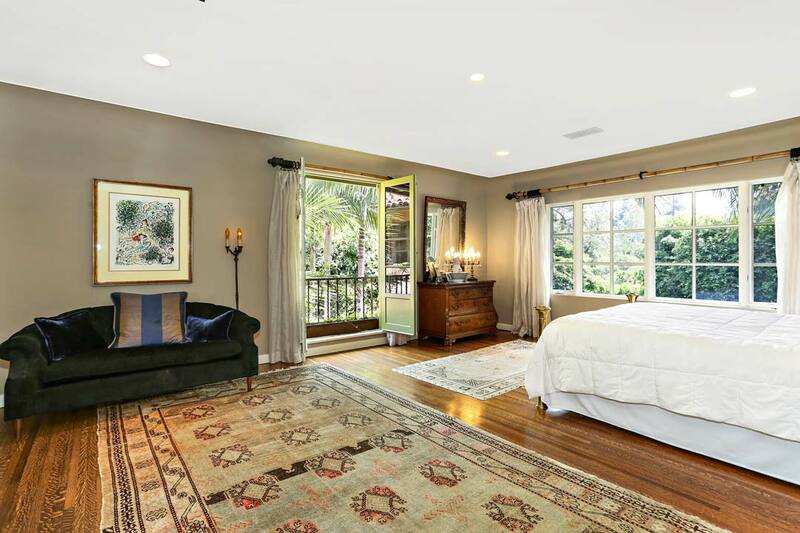 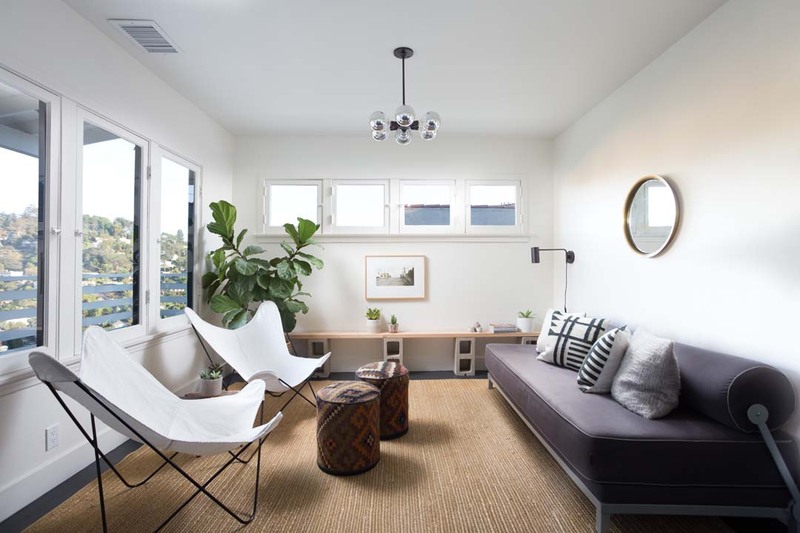 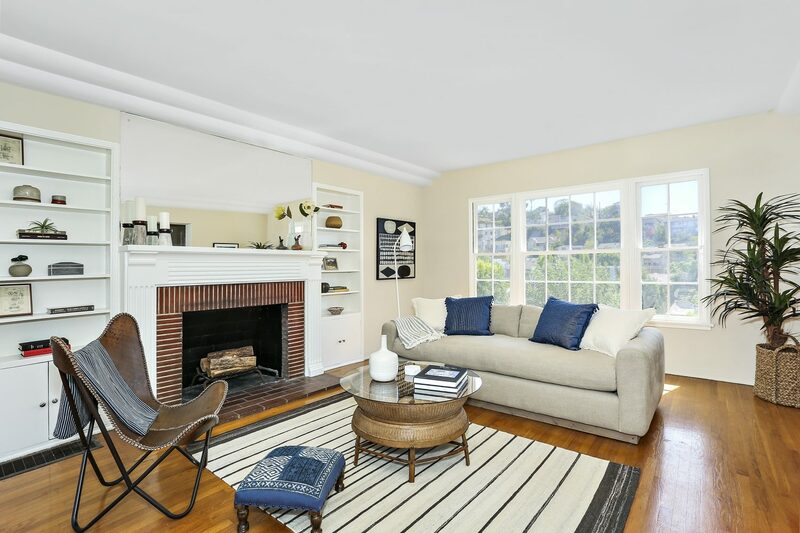 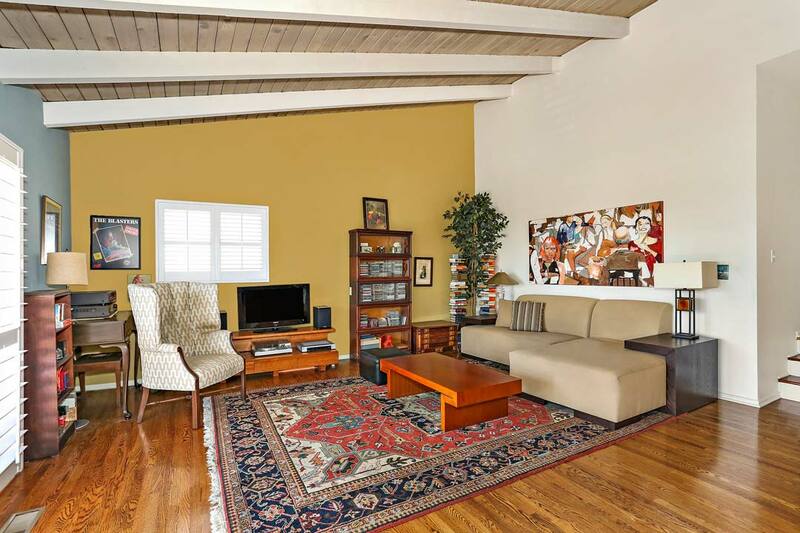 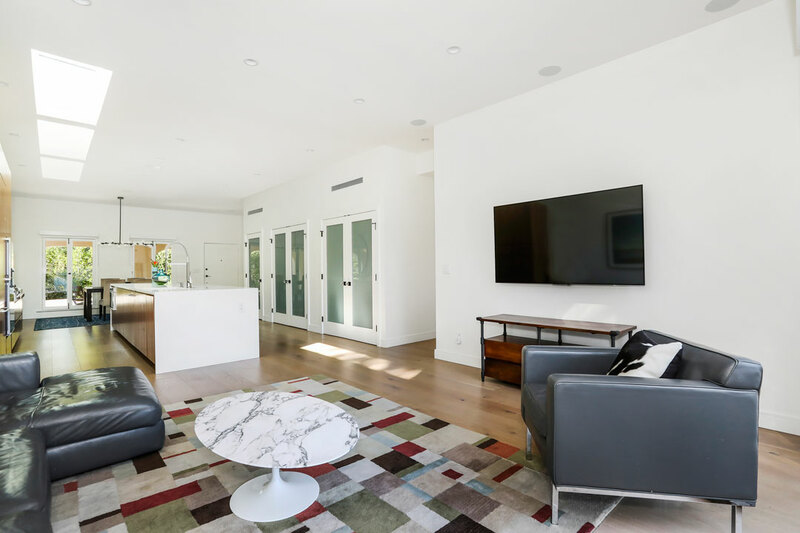 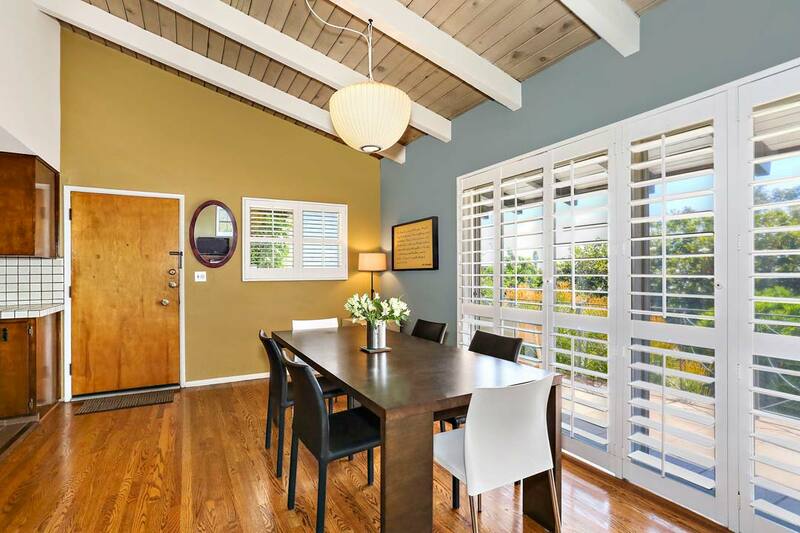 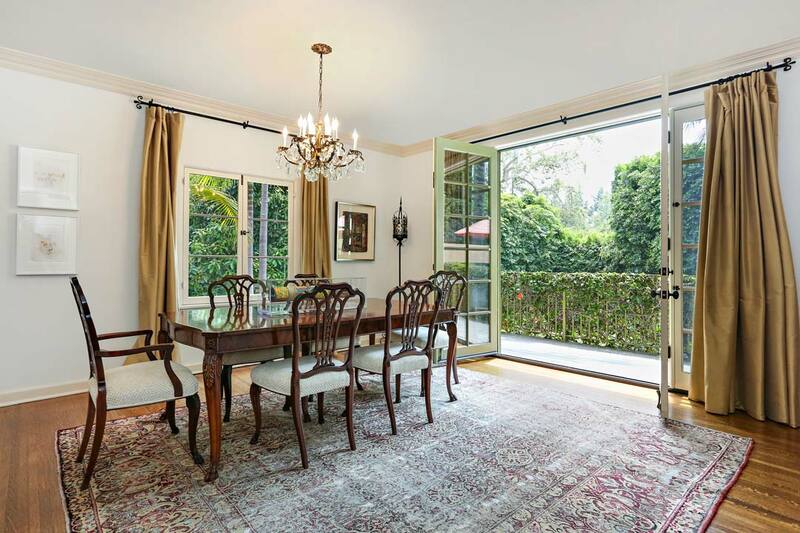 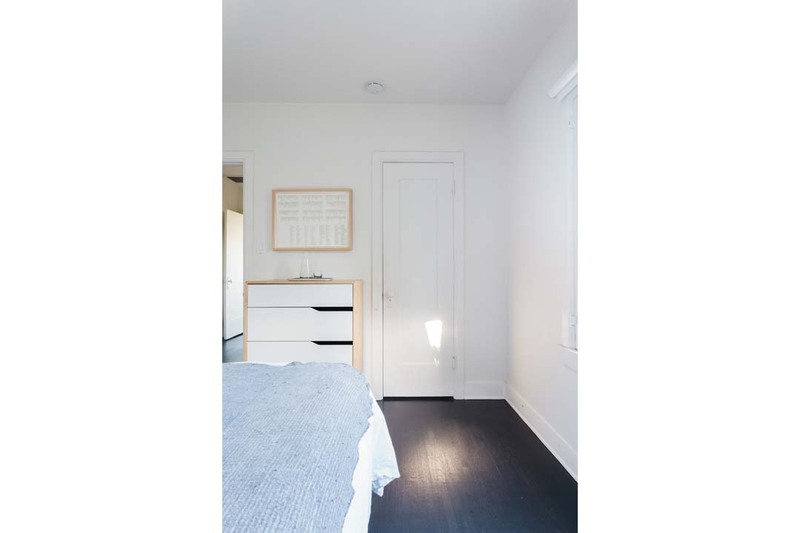 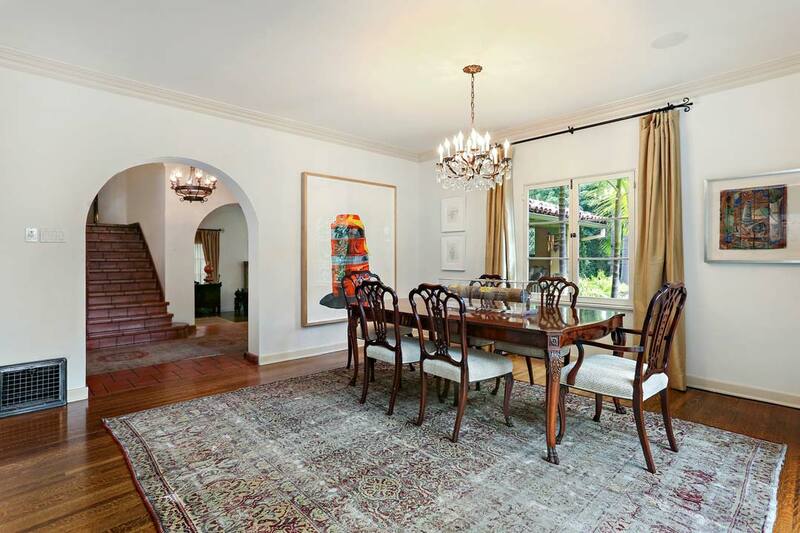 Airy, elegant, filled with light, this home enjoys a prime location in the Franklin Hills of Los Feliz. 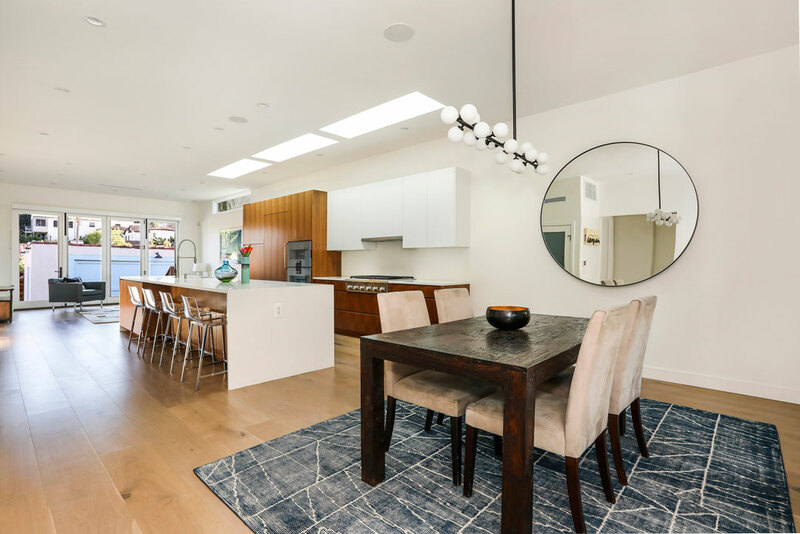 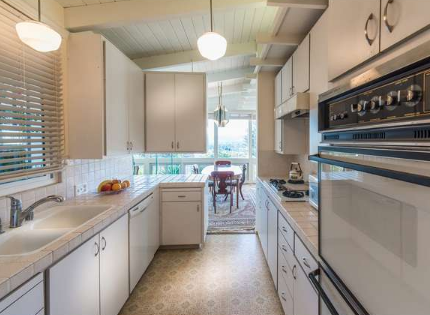 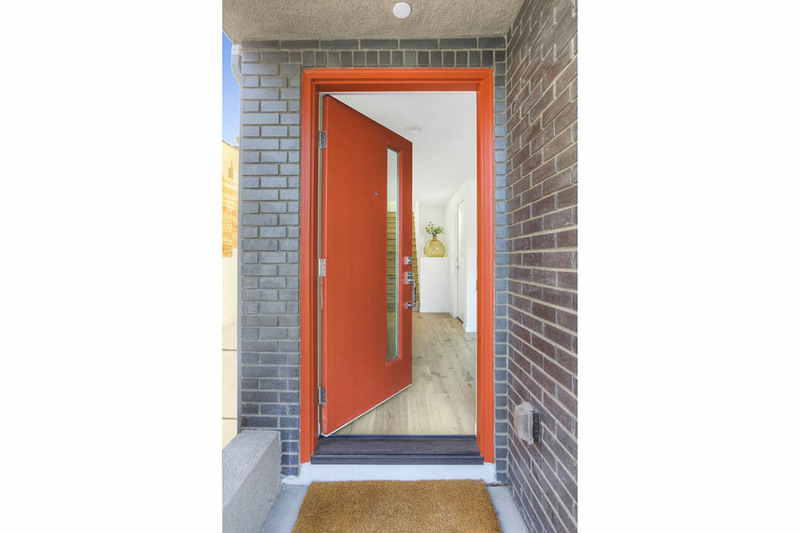 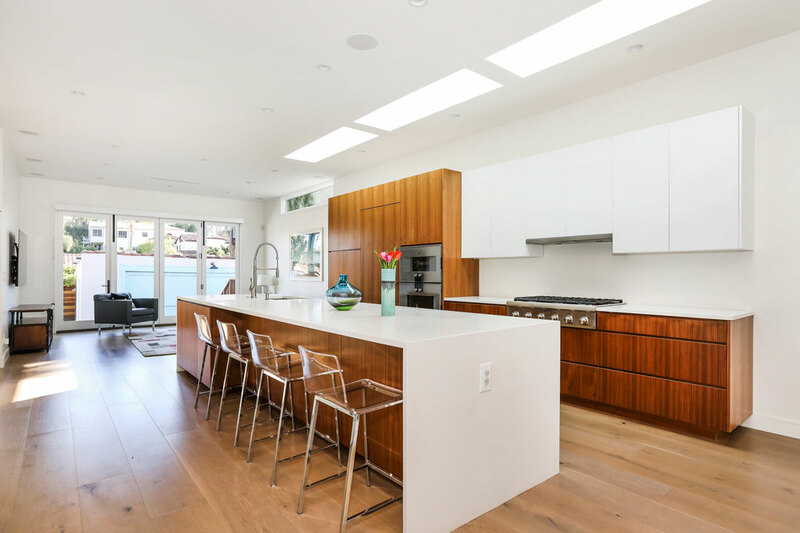 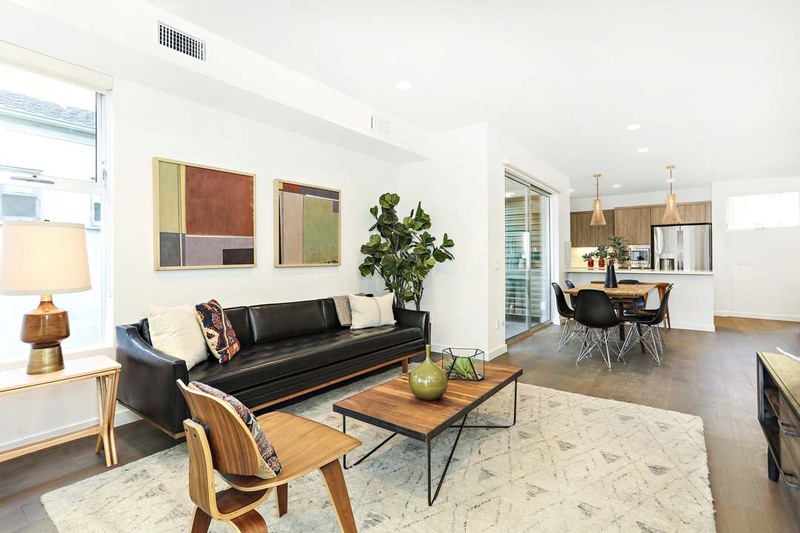 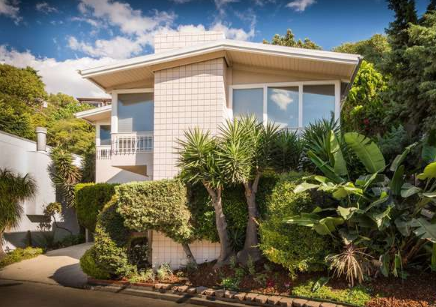 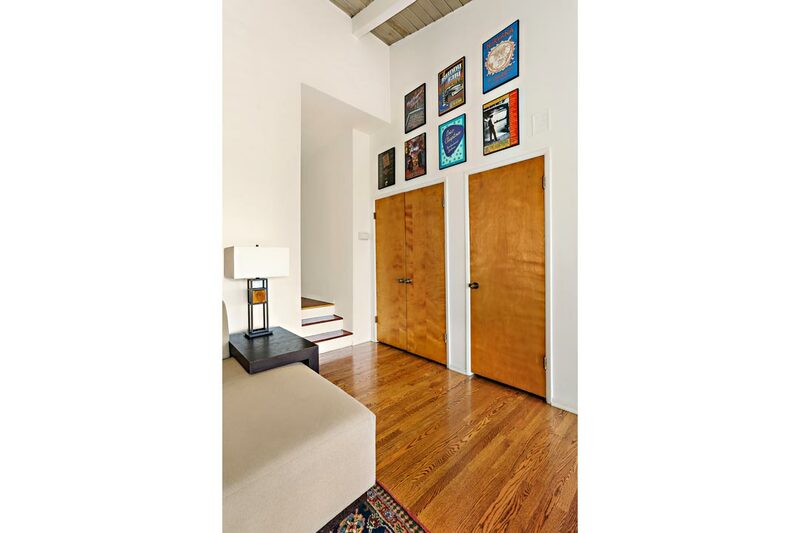 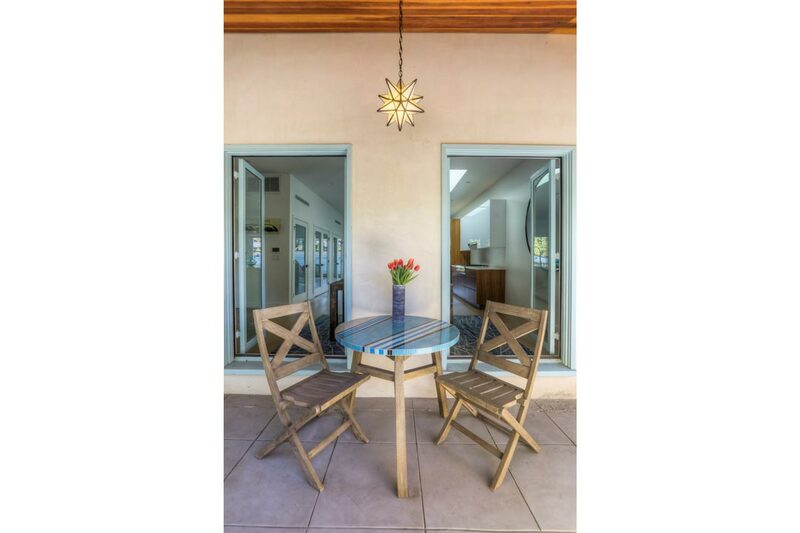 Mid-century modern design hallmarks include a free-flowing layout, gorgeous hardwood floors, an open-beam ceiling and a wall of glass framing striking westward views. 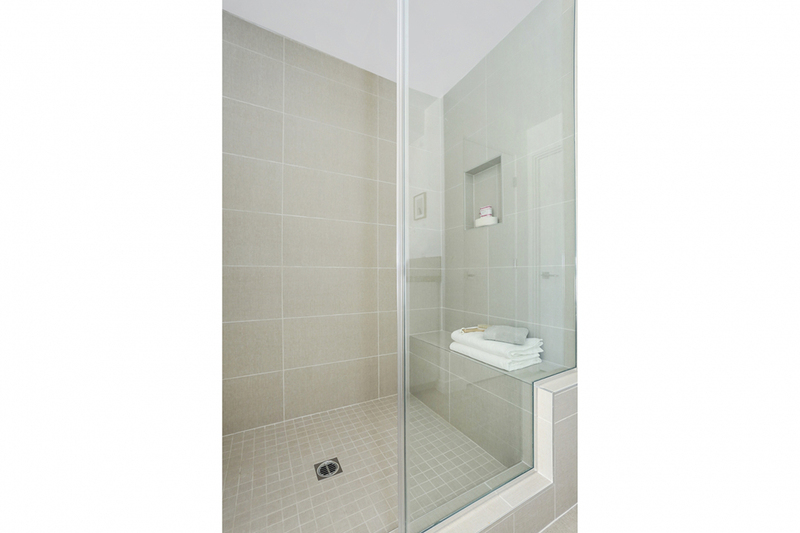 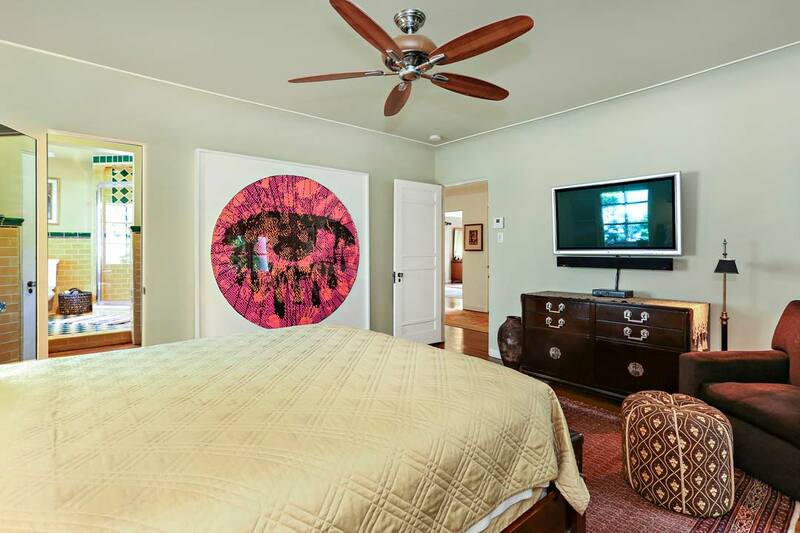 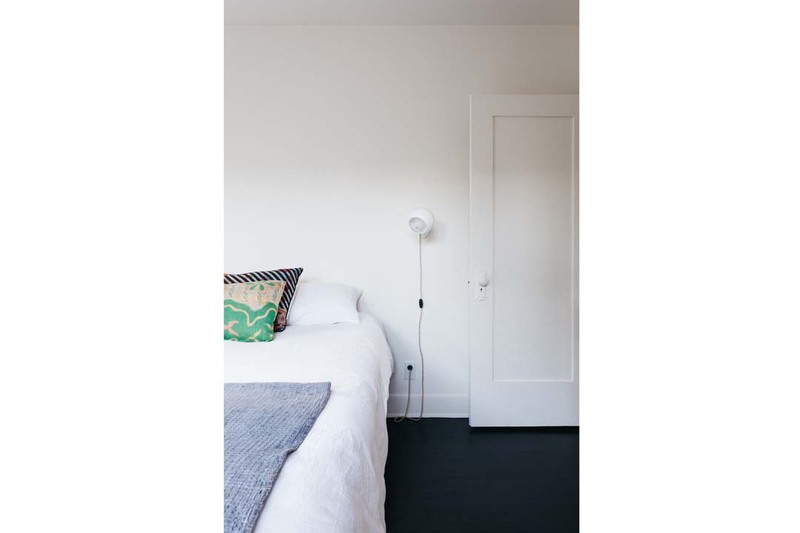 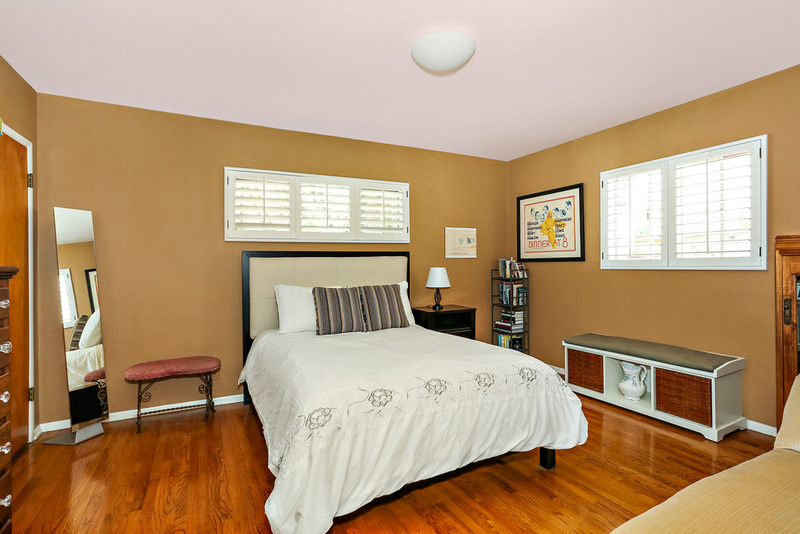 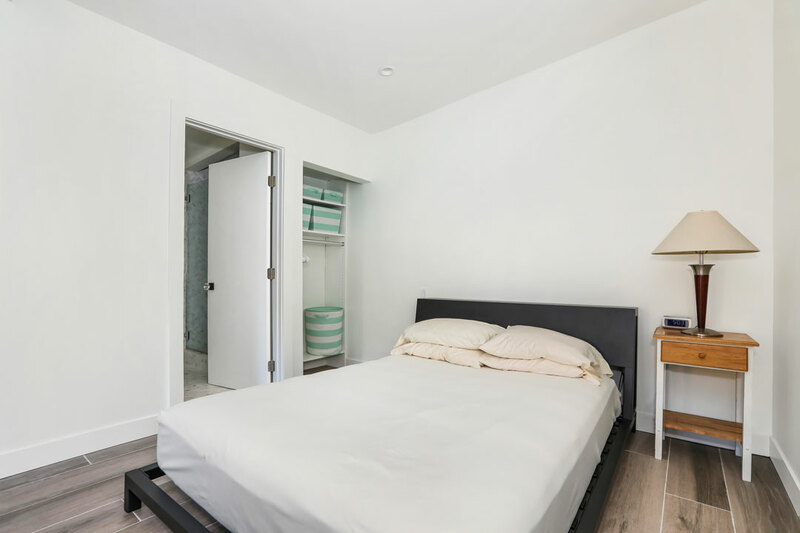 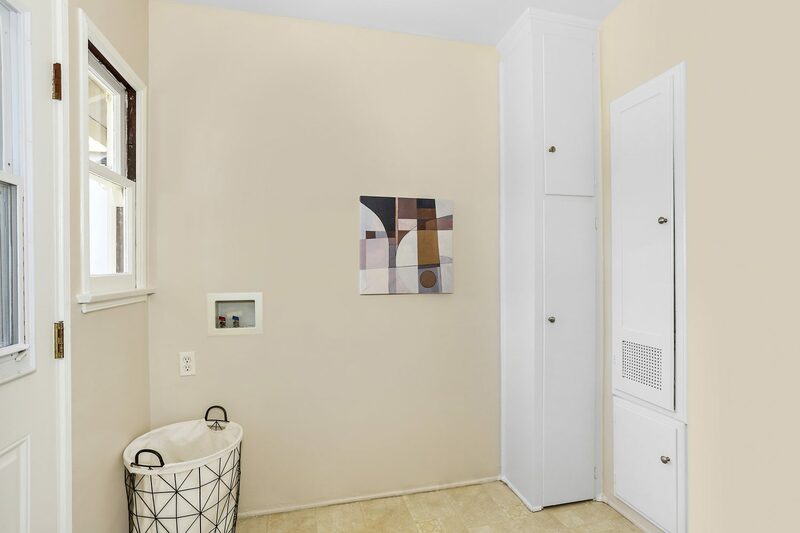 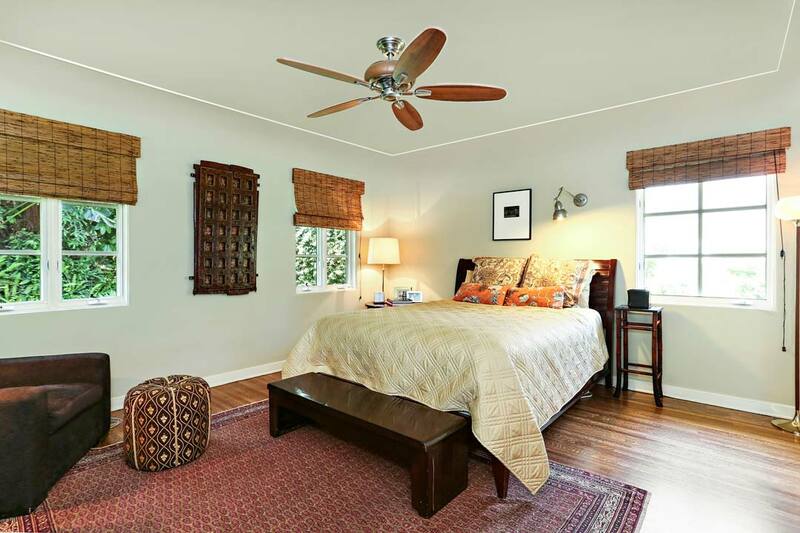 The Master bedroom has a large, customized walk-in closet and there is a beautifully remodeled bathroom. 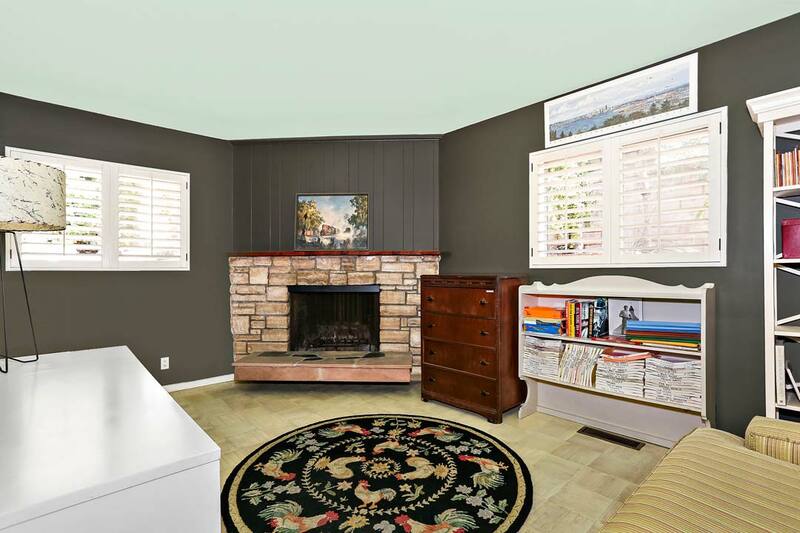 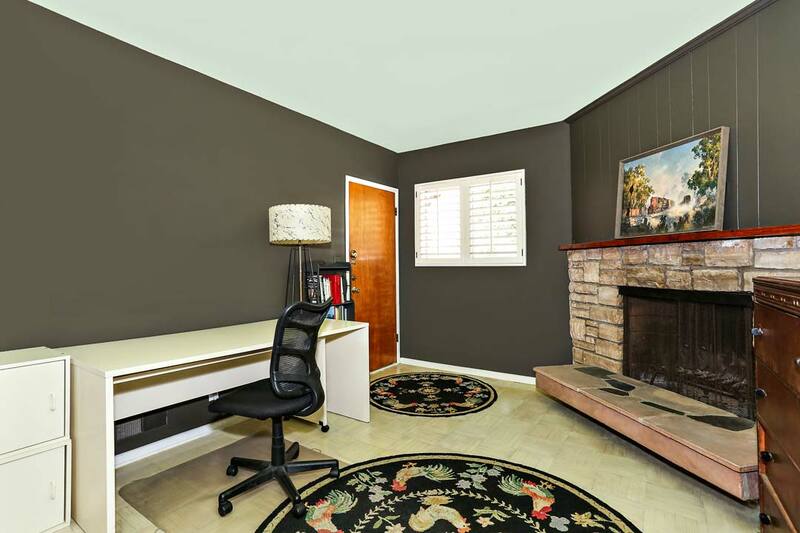 An additional room with a wood burning fireplace is ideal for your office, guest space or den. 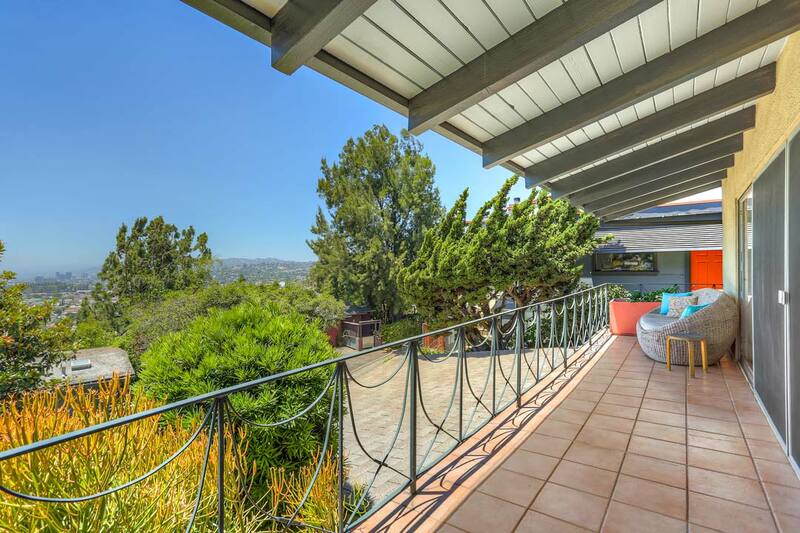 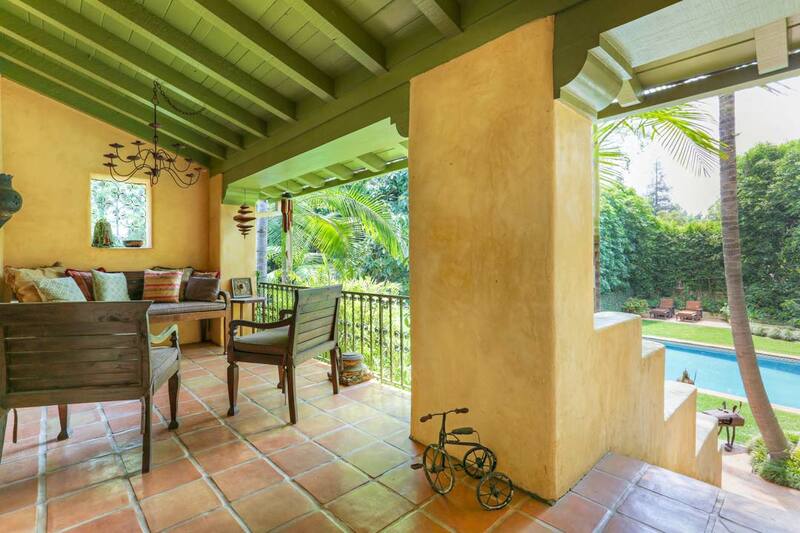 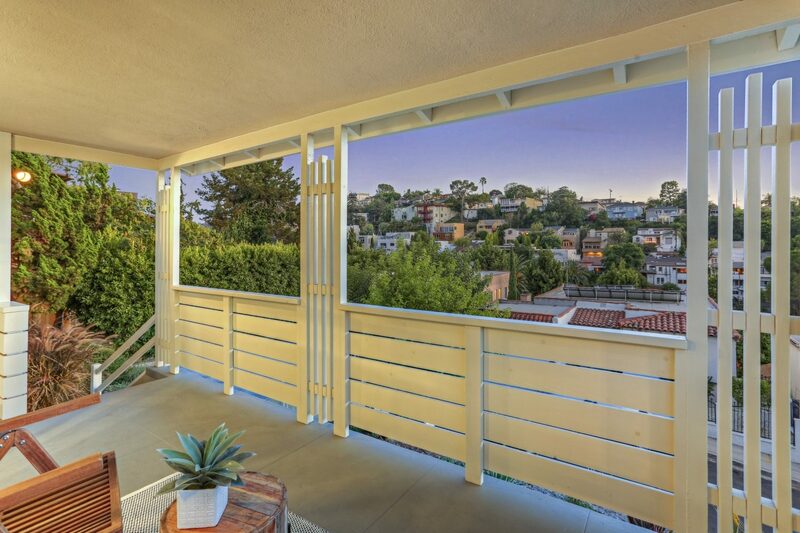 On the front terrace find lovely treetop-level vistas of city lights and sunsets. 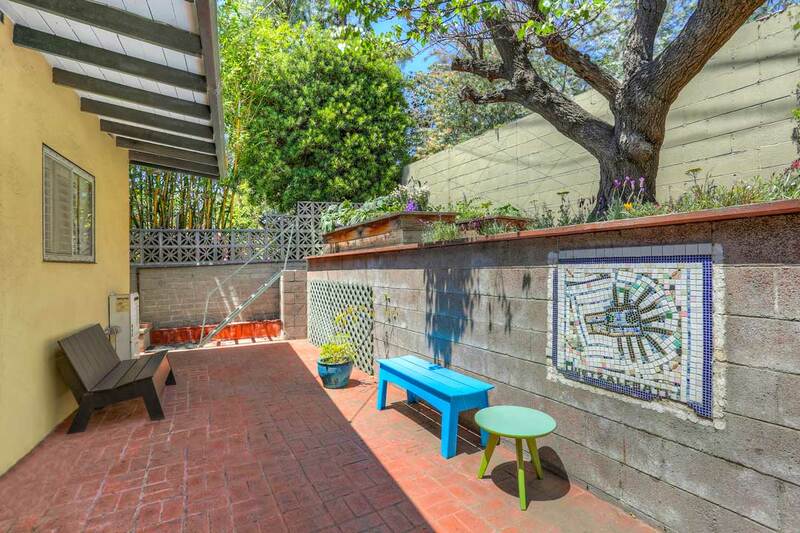 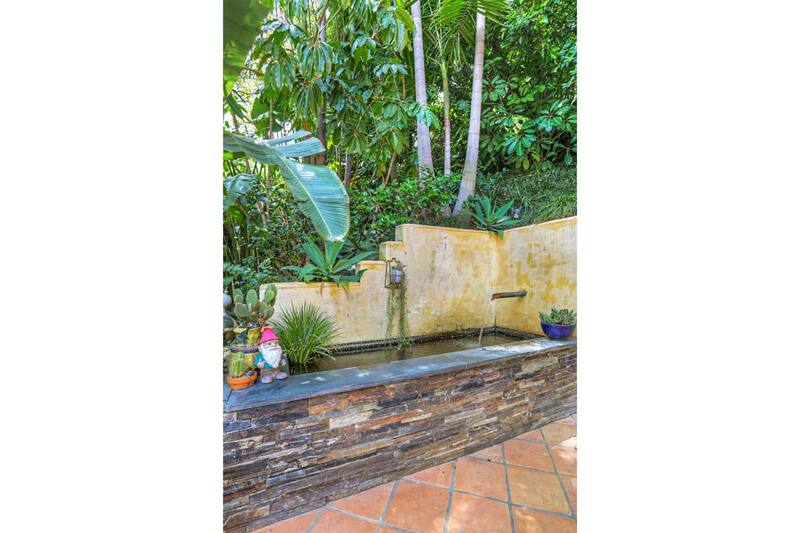 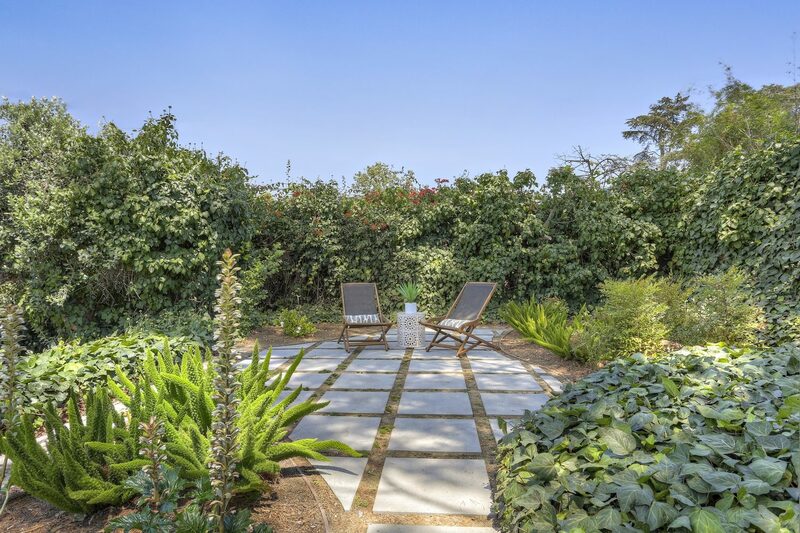 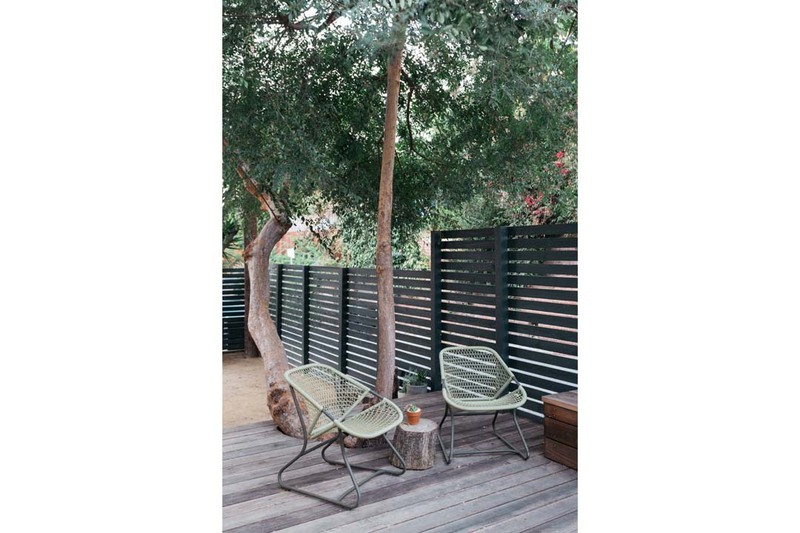 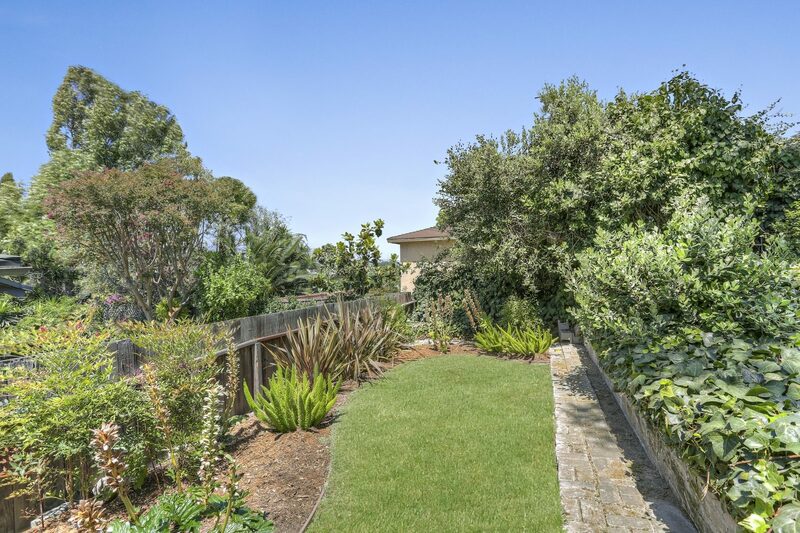 The back patio is a private, tranquil setting with mature fruit trees and raised planter beds. 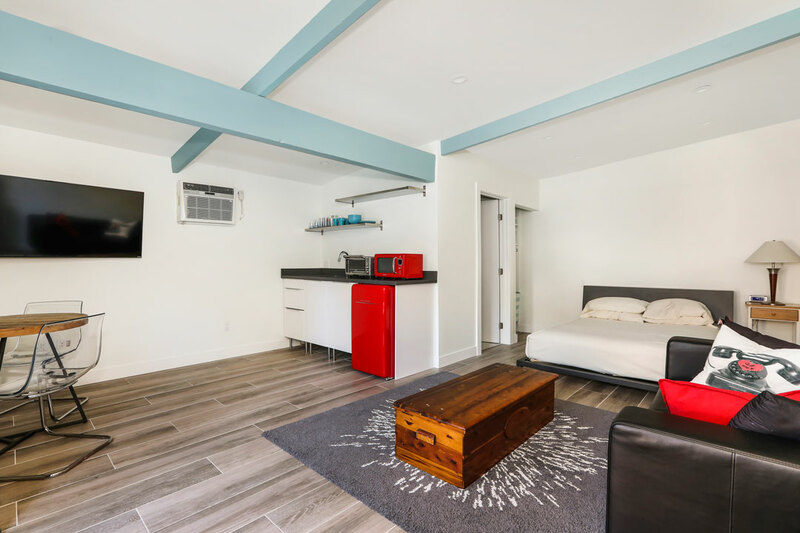 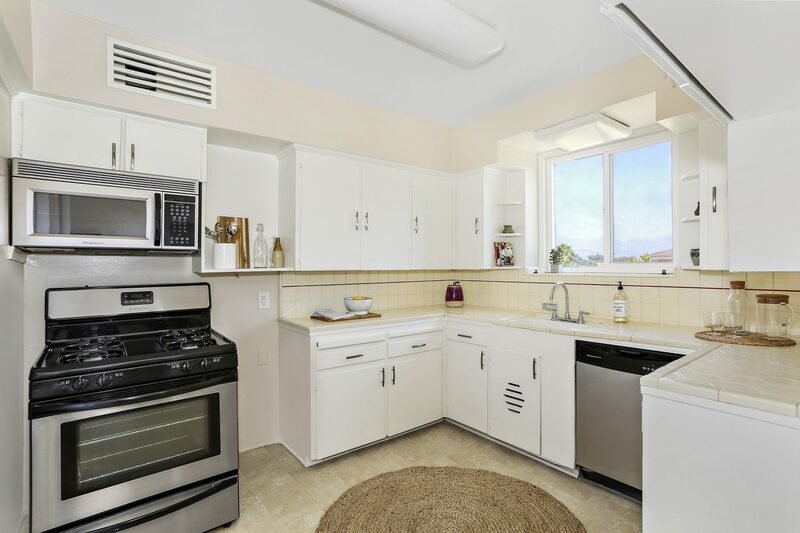 Amenities include a garage, laundry area, central a/c, water softening system, tankless water heater and upgraded electric panel. 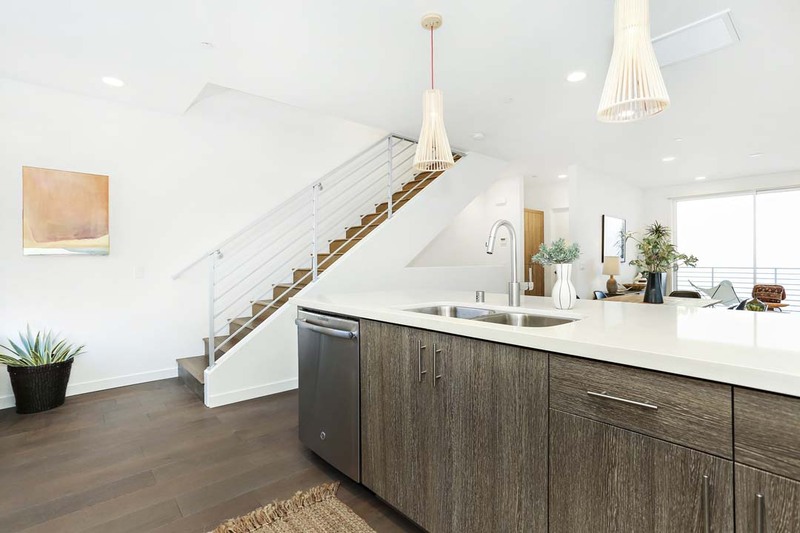 A coveted location in the Franklin Elementary school district puts you near local hot spots Little Dom’s, Maré, Speranza, Trader Joe’s, Lassens and more. 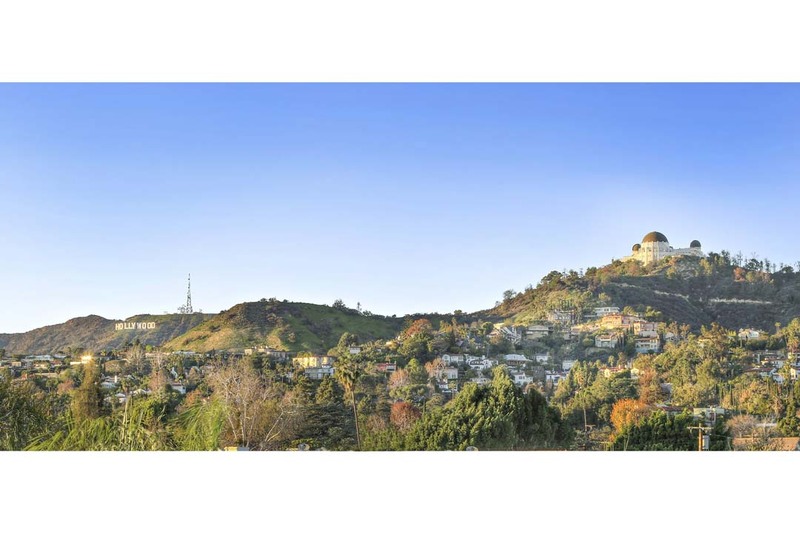 Griffith Park and The Silver Lake Reservoir are within easy reach. 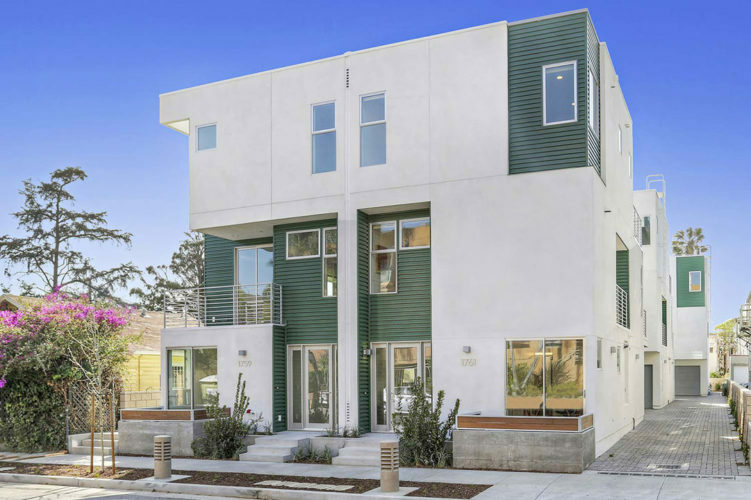 Newly built by WCH Communities. 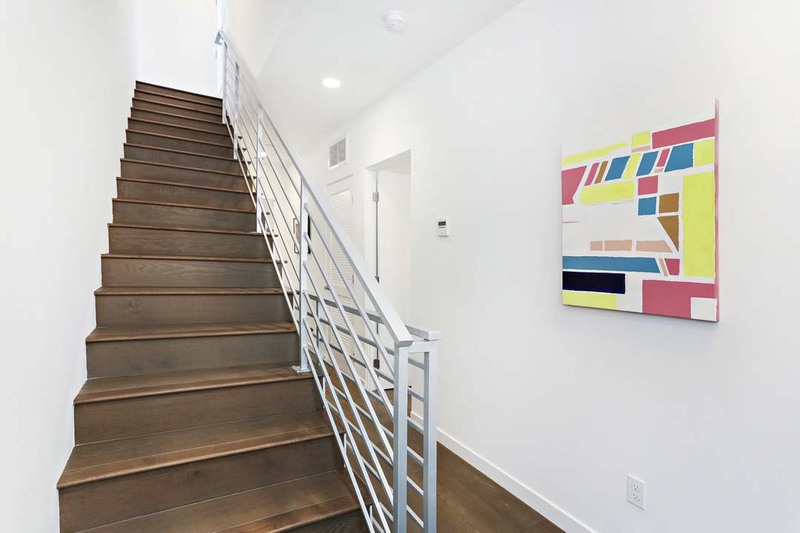 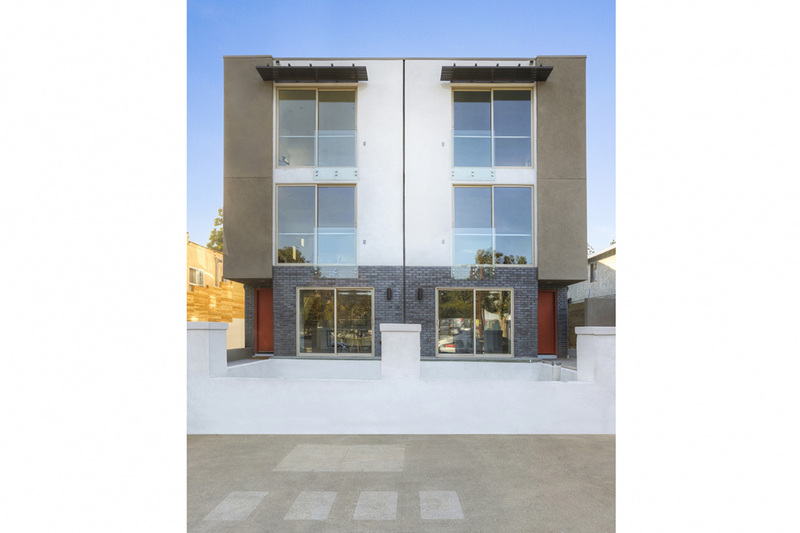 Contemporary architecture on a quiet residential street, just steps from the cafés and cultural happenings of Los Feliz Village. 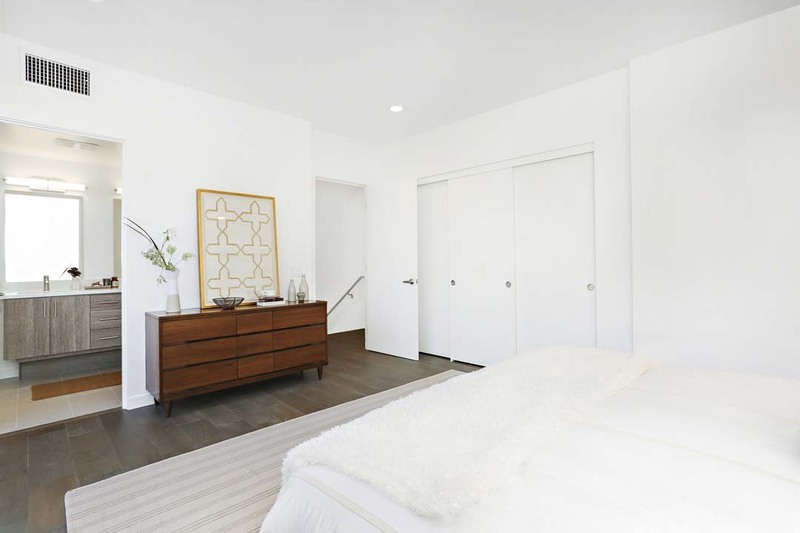 The homes are structurally independent and part of an intimate community of just six residences. 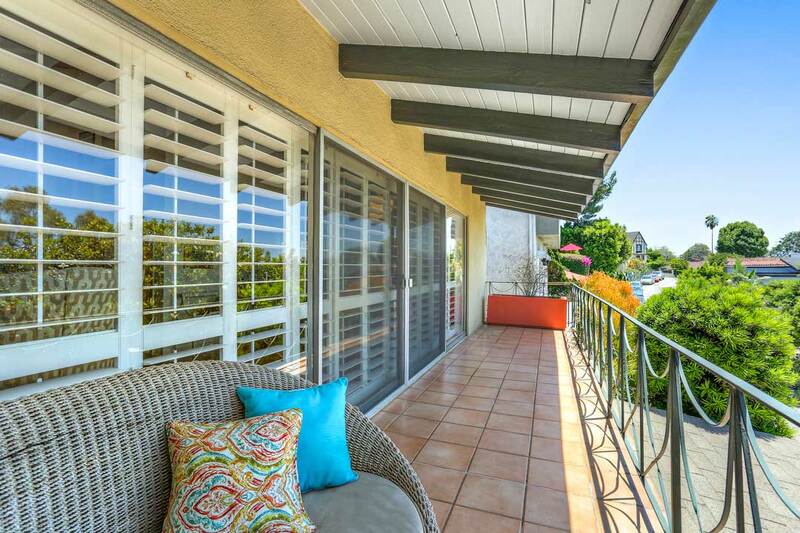 There are three levels of living space, multiple balconies and an attached two-car garage. 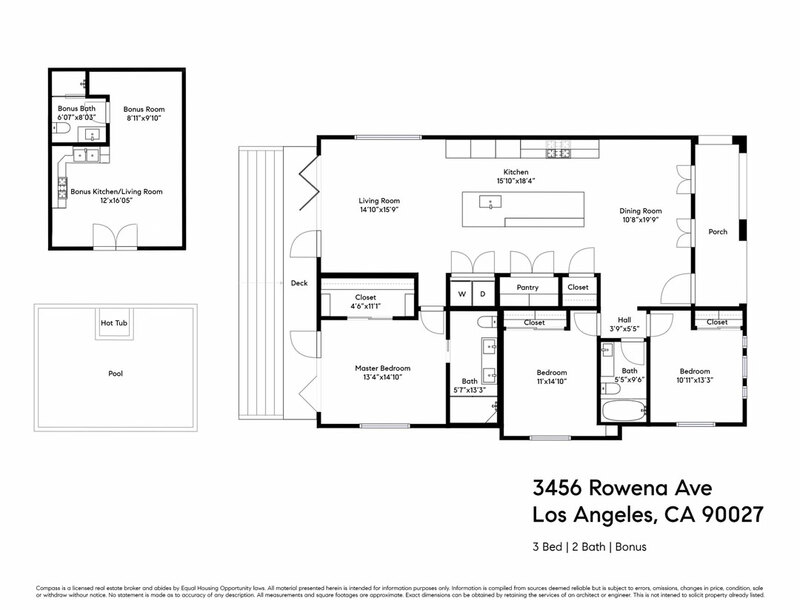 Second level living, dining and gourmet kitchen are open, airy, filled with natural light. 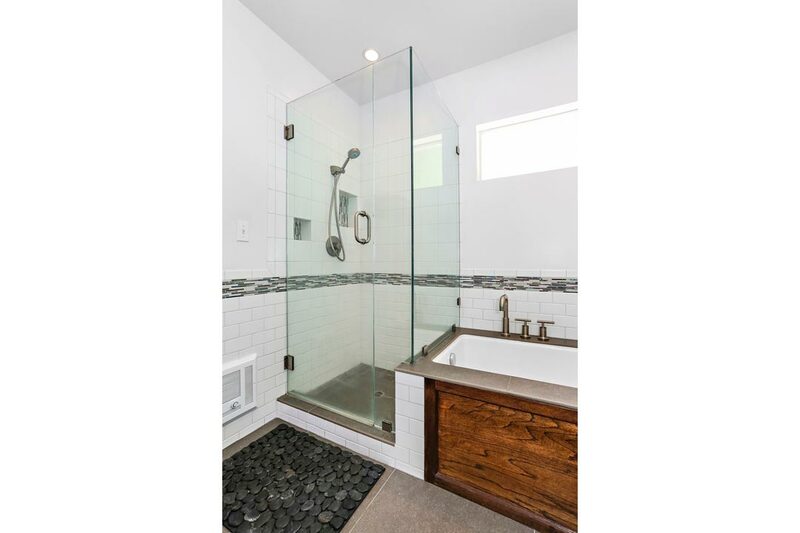 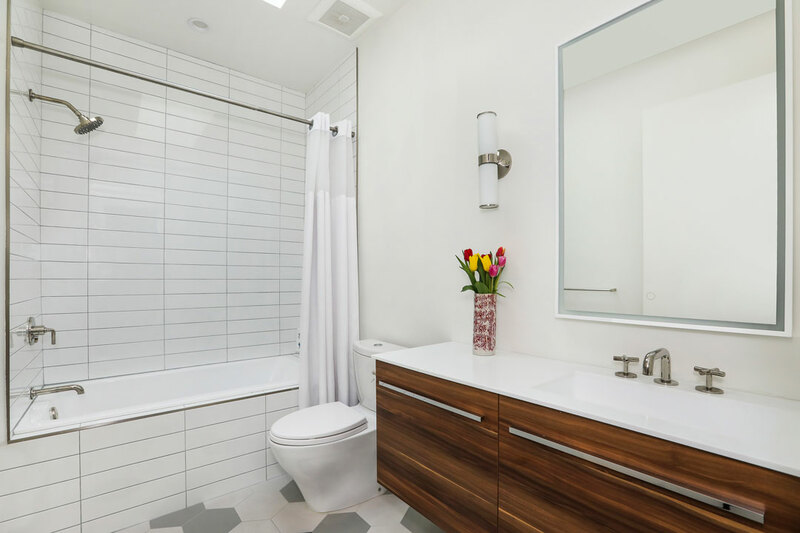 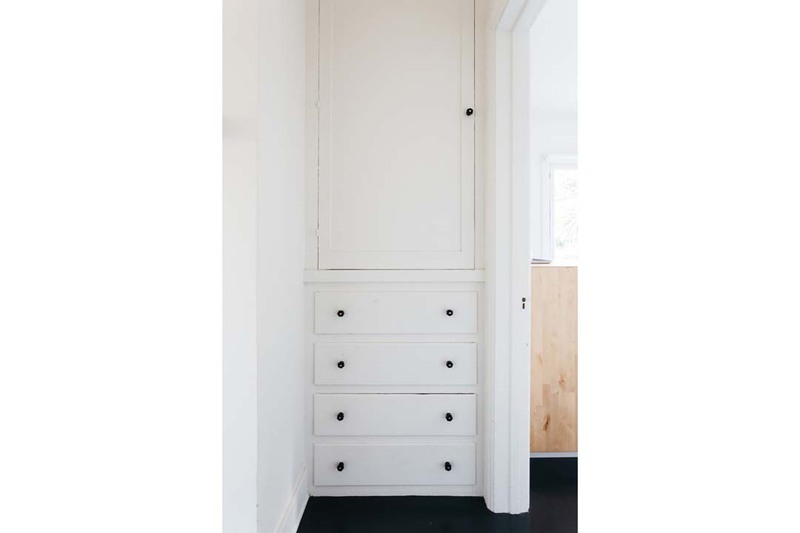 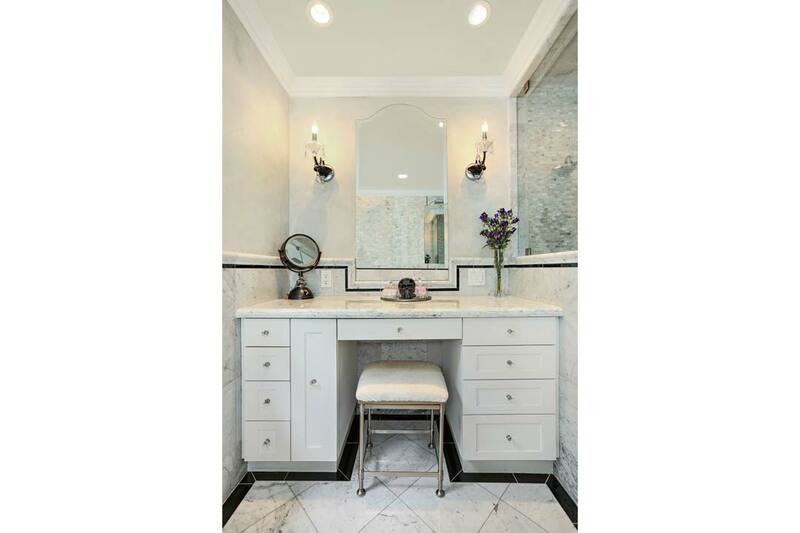 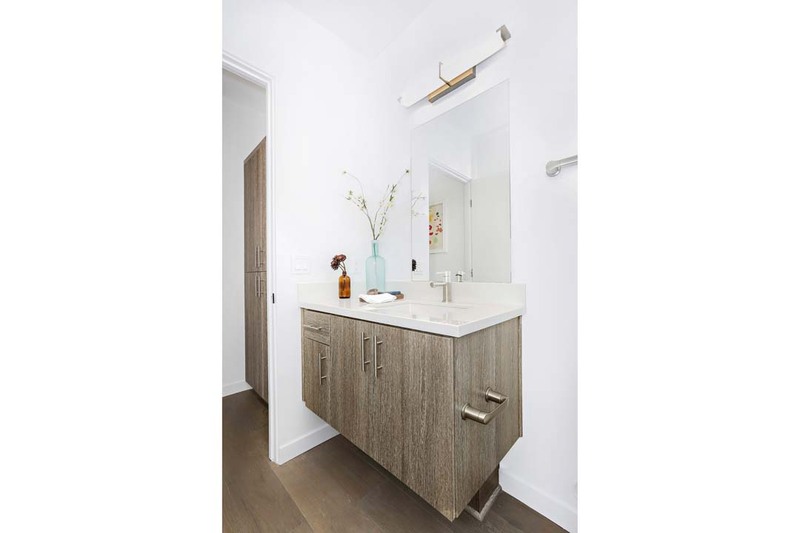 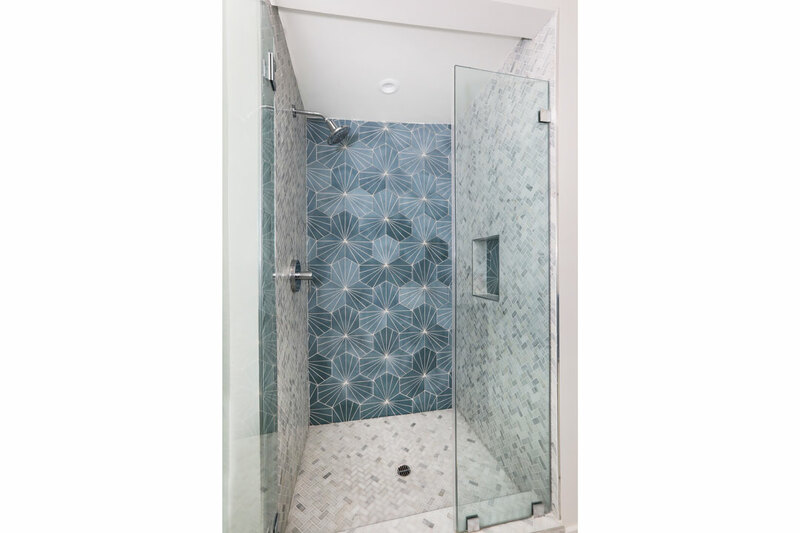 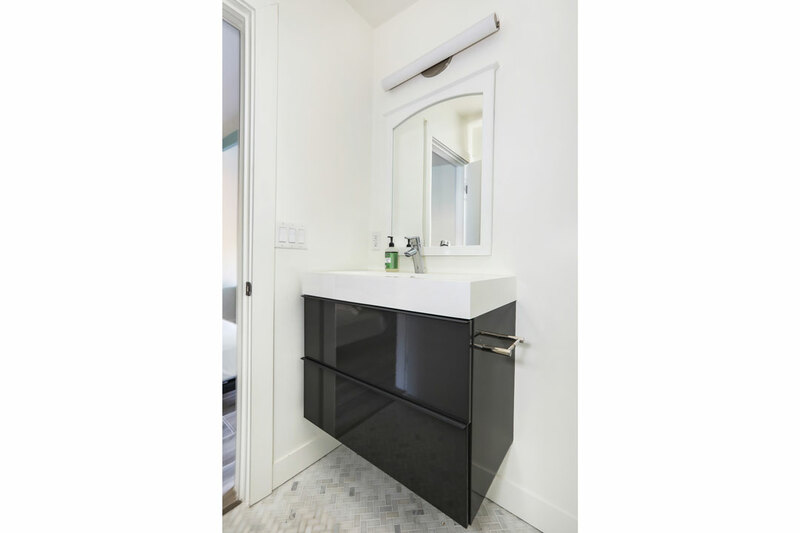 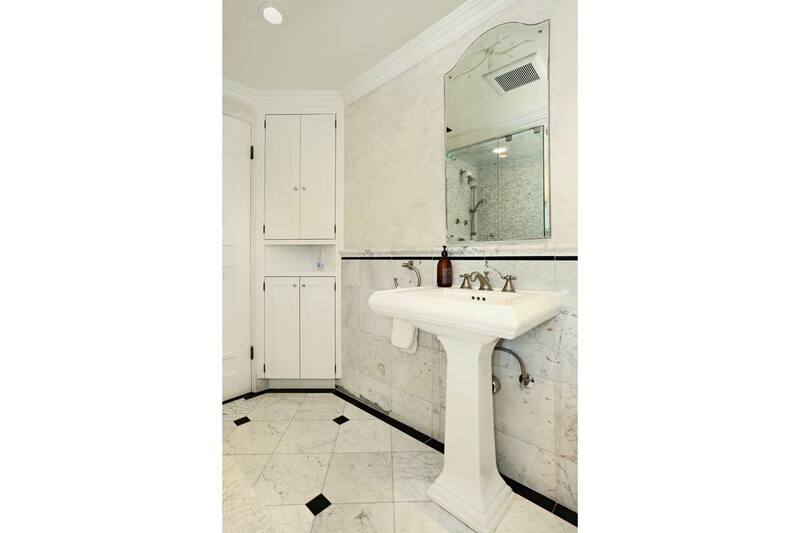 Carefully curated finishes include oak plank flooring, custom stone and tile work and designer fixtures. 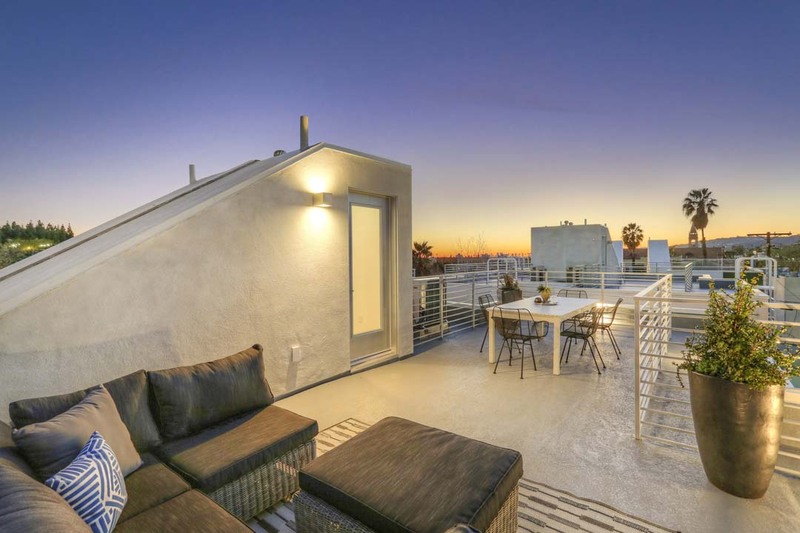 On the stunning rooftop deck find 360-degree views of city lights, sunsets and L.A.’s iconic landmarks. 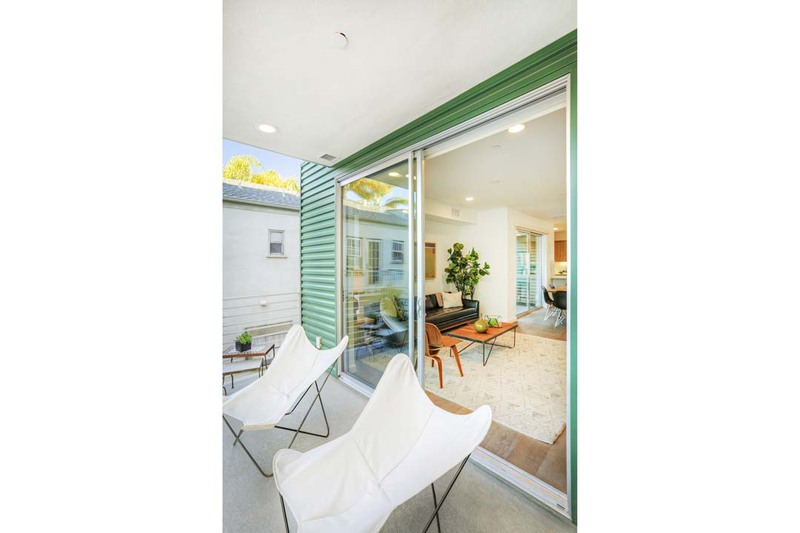 This eco-friendly residence features state-of-the-art green technologies and enjoys a best-in-class 94 Walk Score Rating (TM). 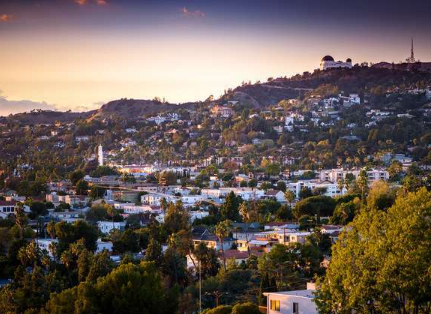 Around the corner are local hot-spots Bru Coffeebar, Figaro Bistrot, Skylight Books, the Los Feliz 3 movie theater, two weekly Farmers Markets and more. 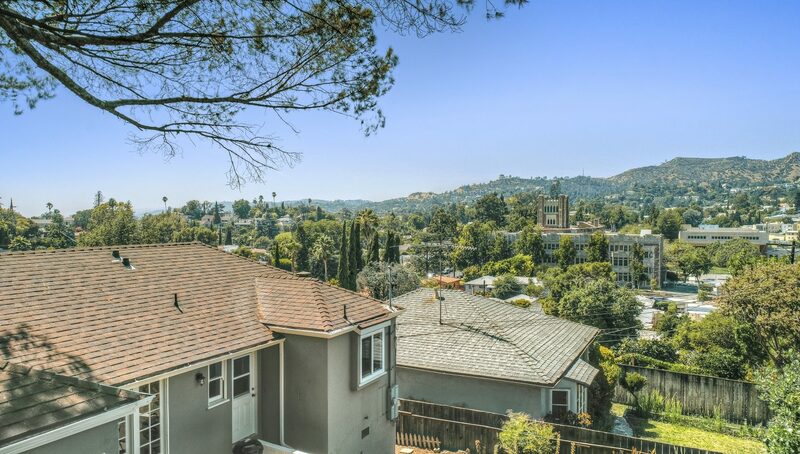 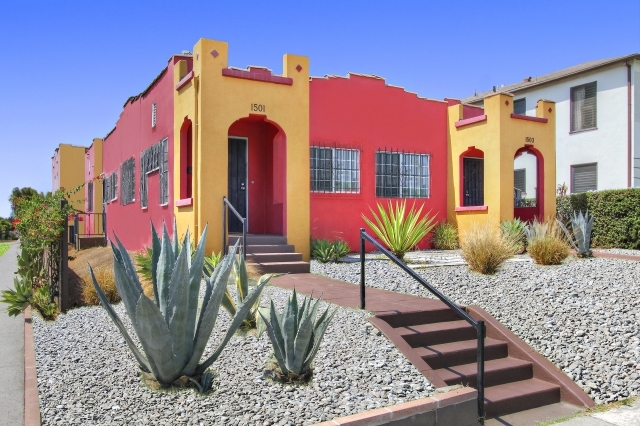 Barnsdall Art Park and the Metro Red Line are nearby and easy to reach. 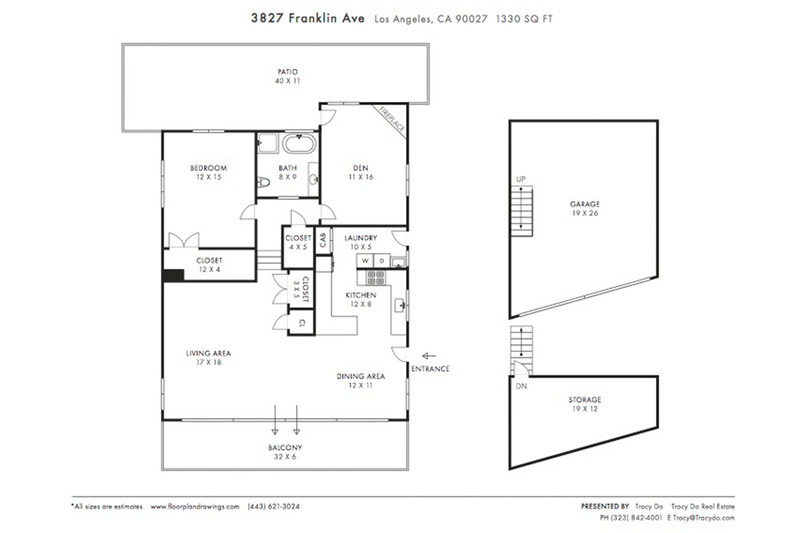 Living Area: 2,552 Square Ft. / Lot Size: 4,443 Square Ft.